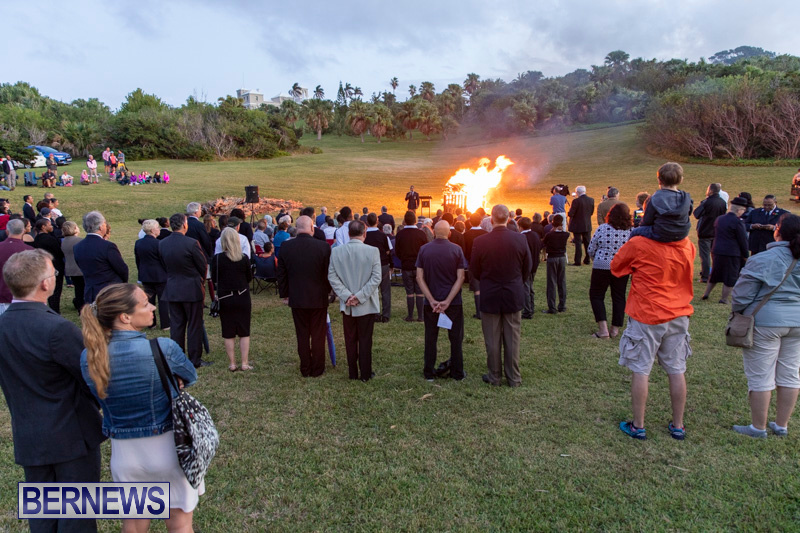 The commemoration of the 100th anniversary of the end of the First World War ended last night [Nov 11] with a ‘Beacon of Hope’ lit at Government House. 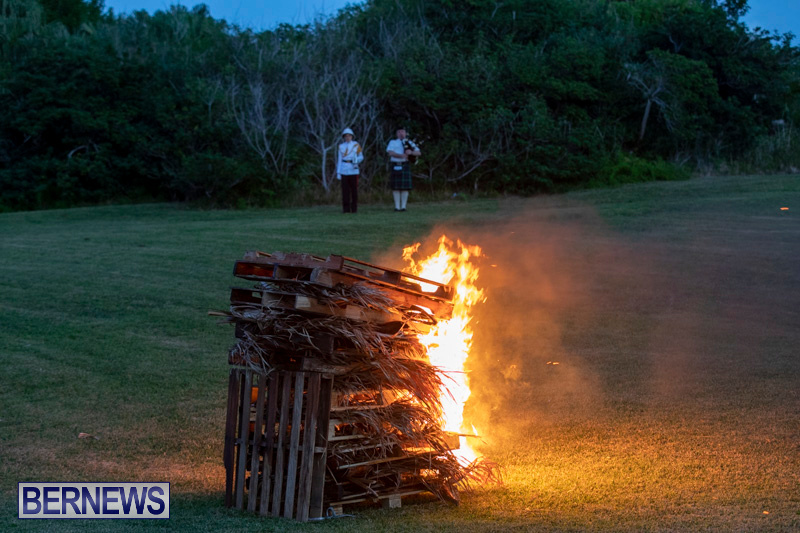 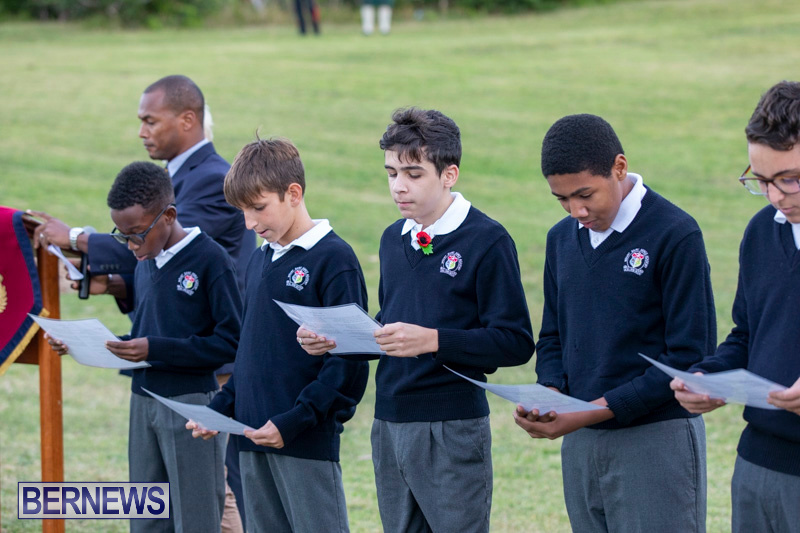 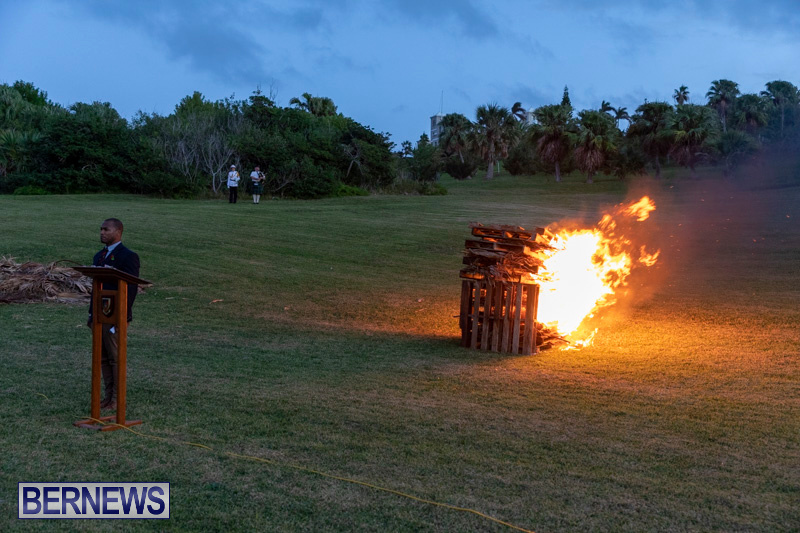 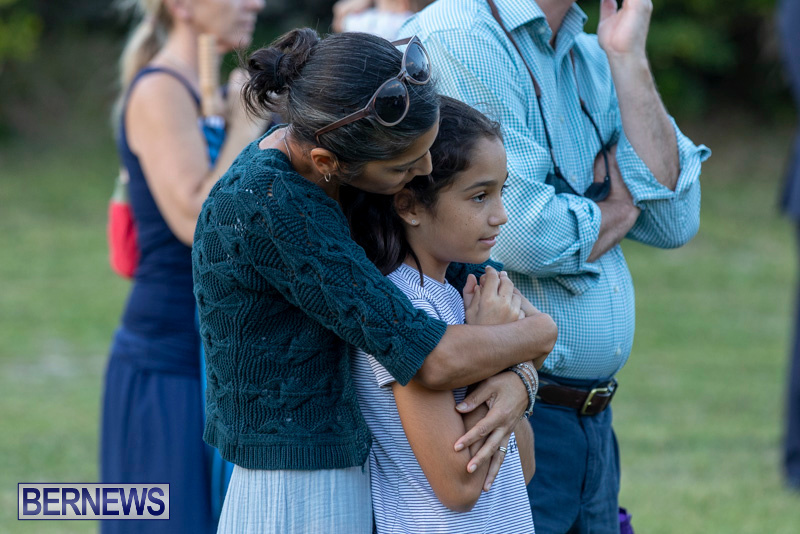 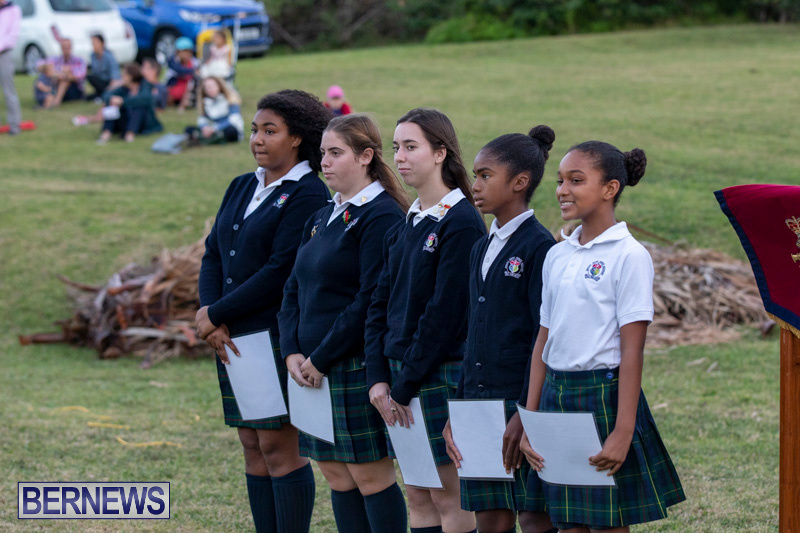 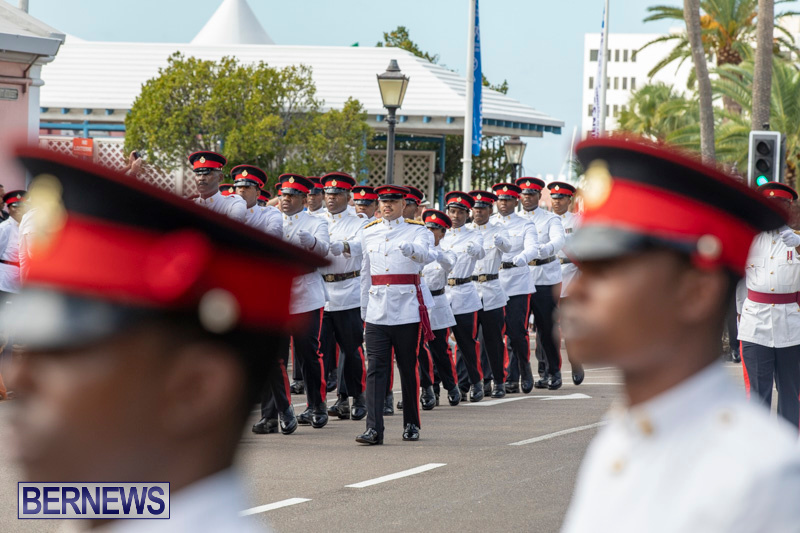 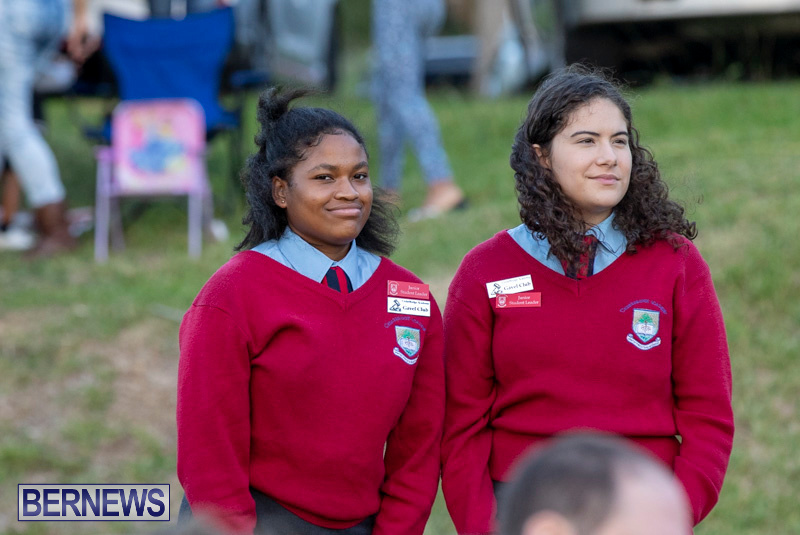 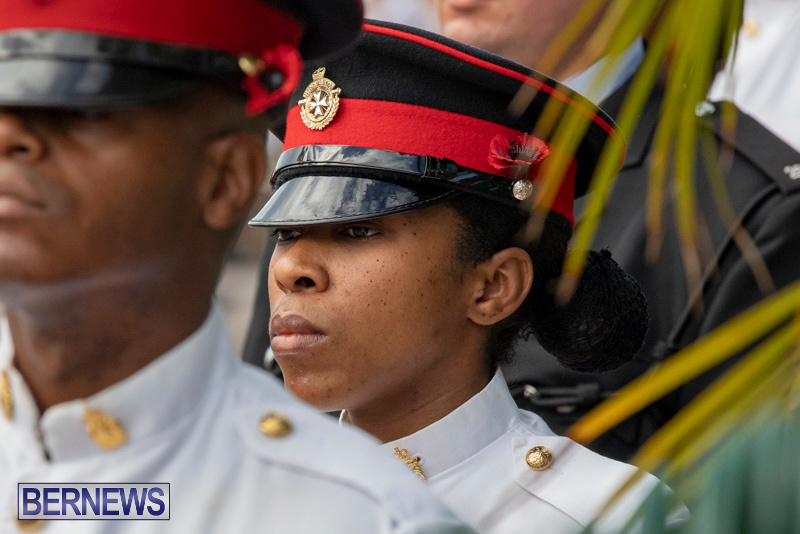 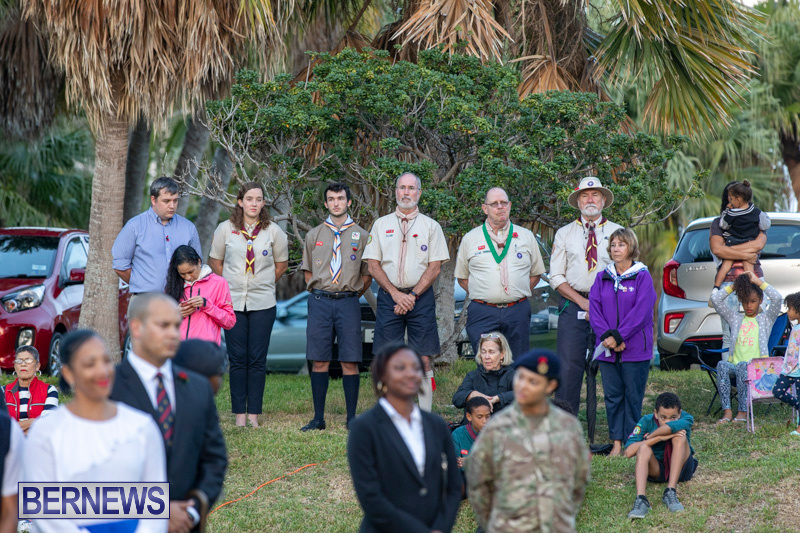 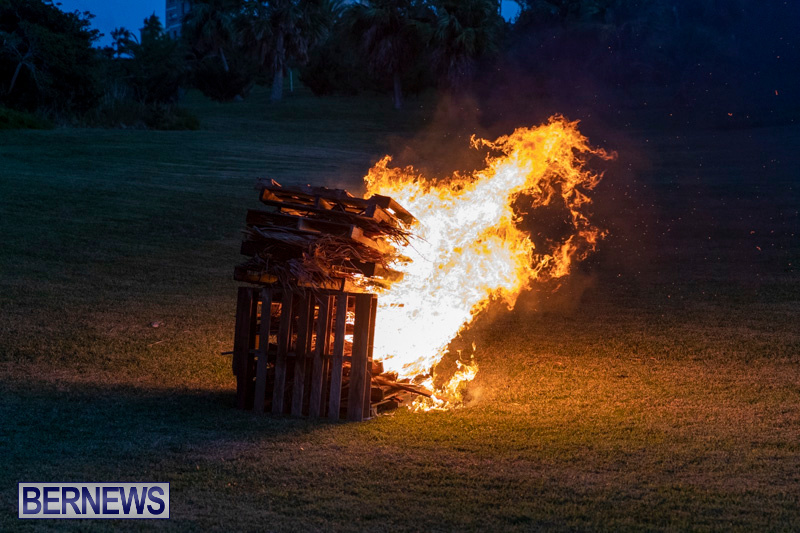 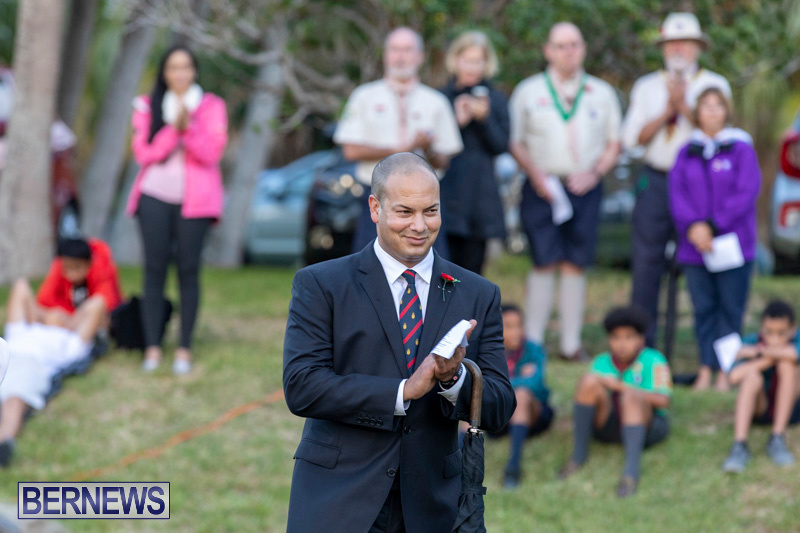 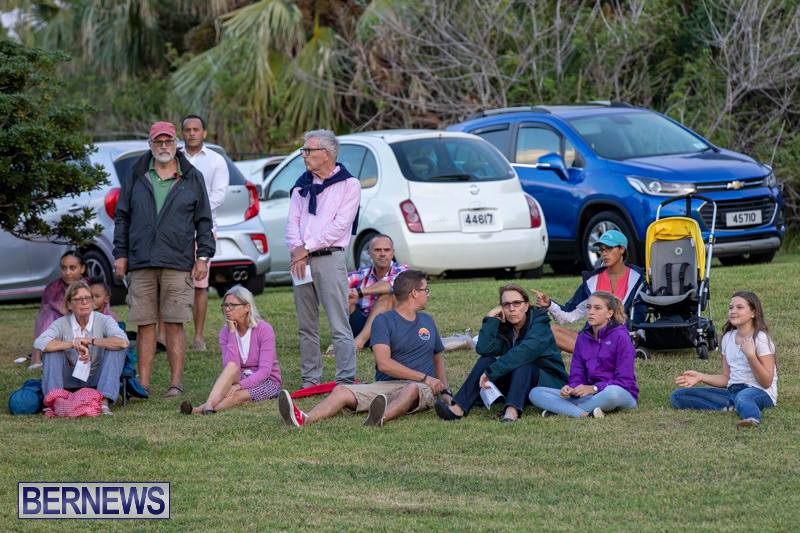 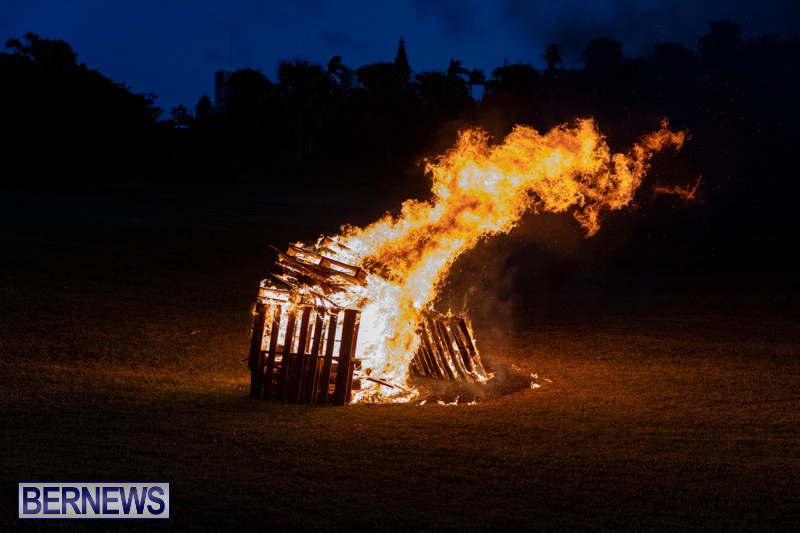 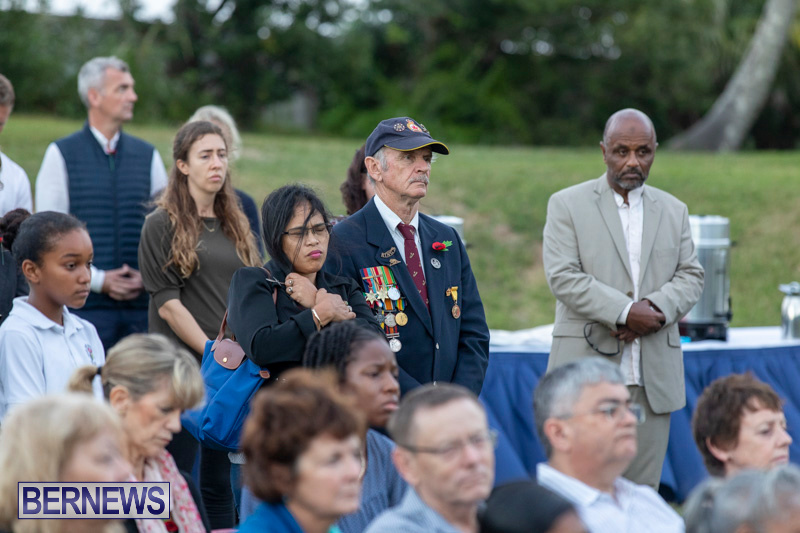 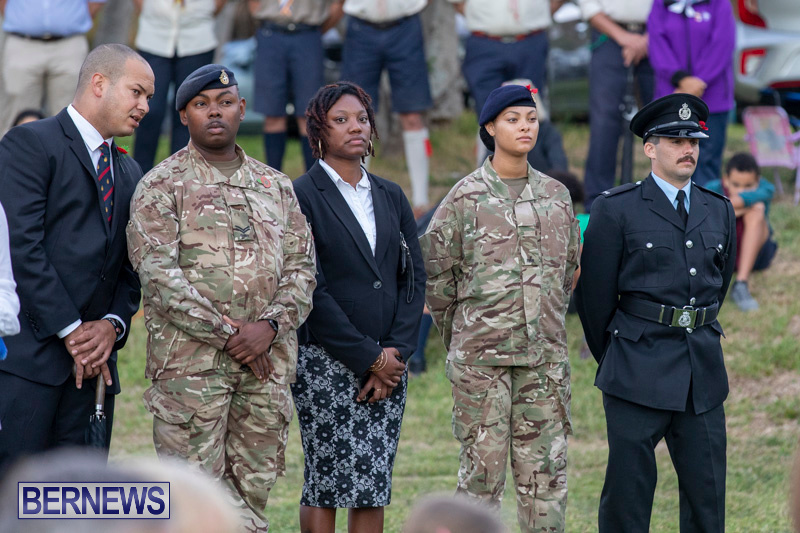 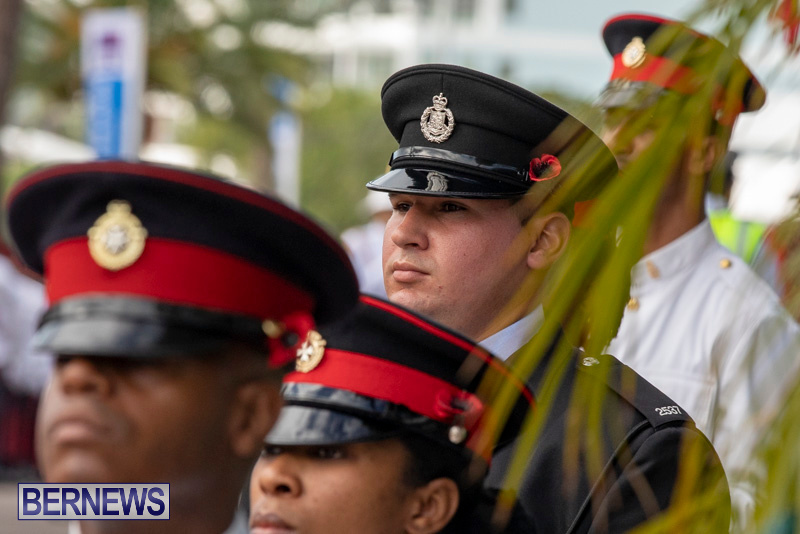 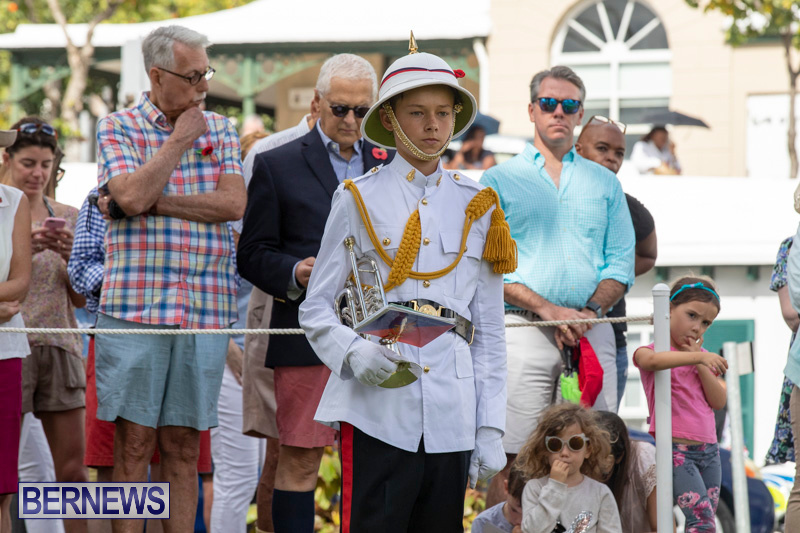 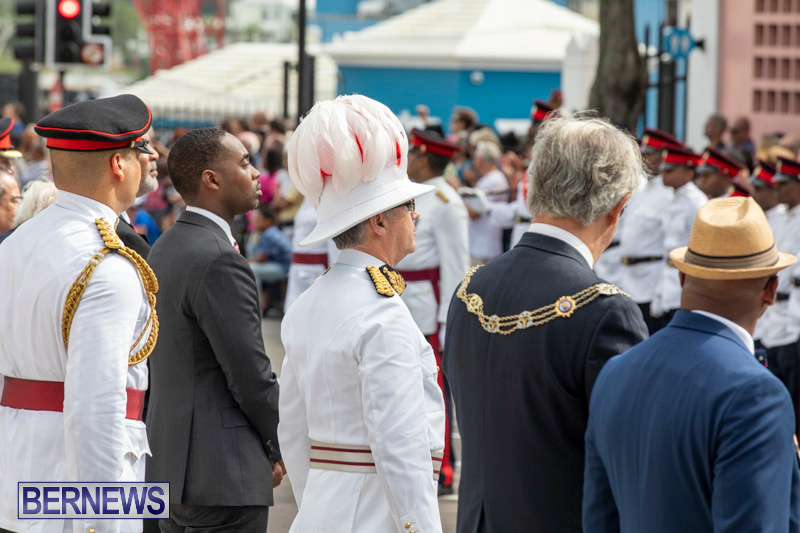 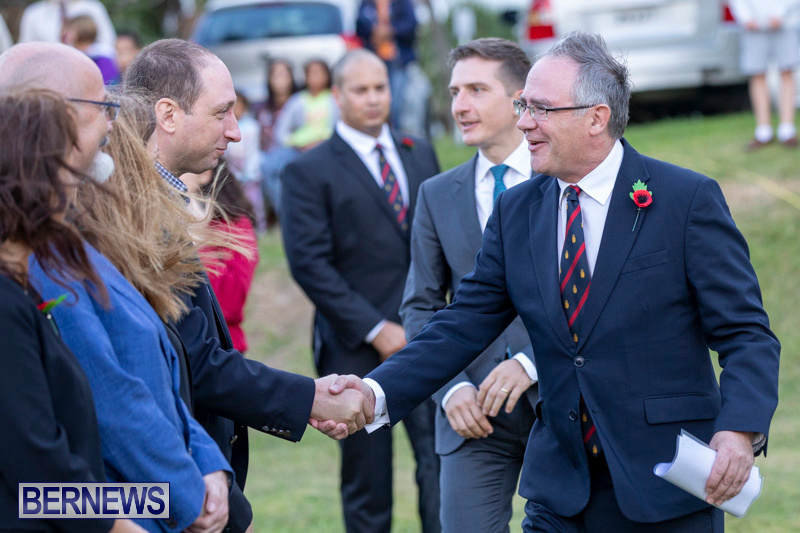 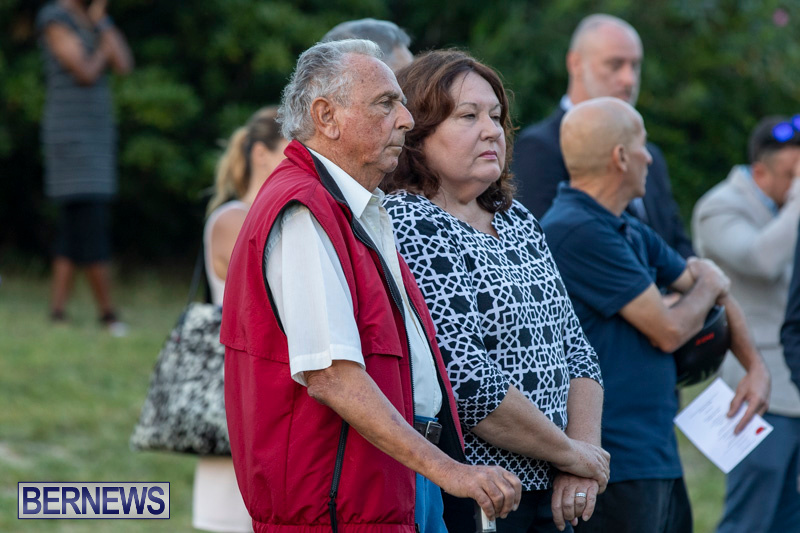 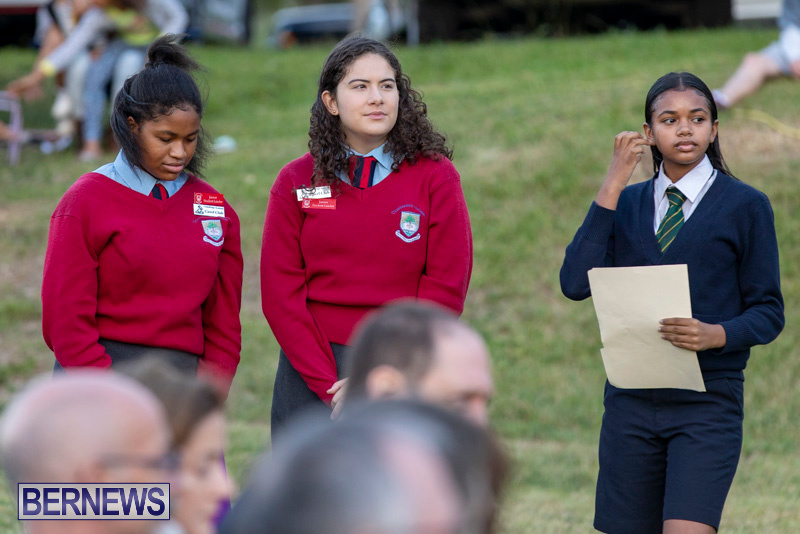 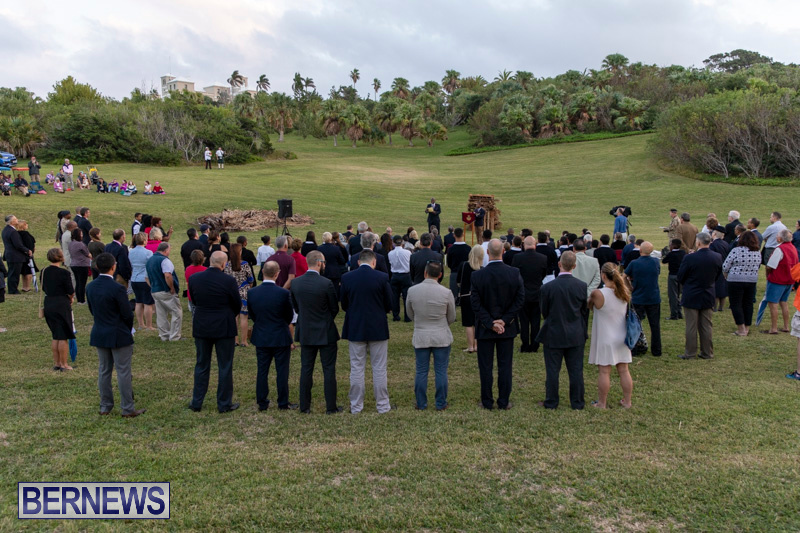 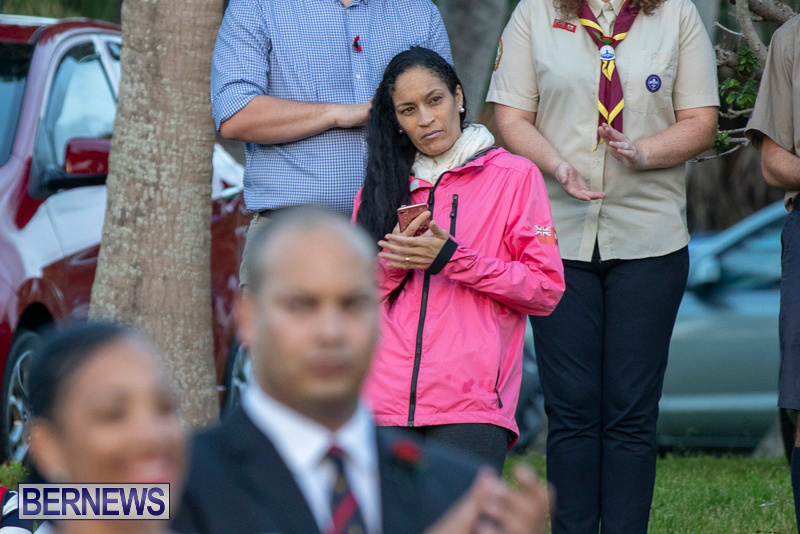 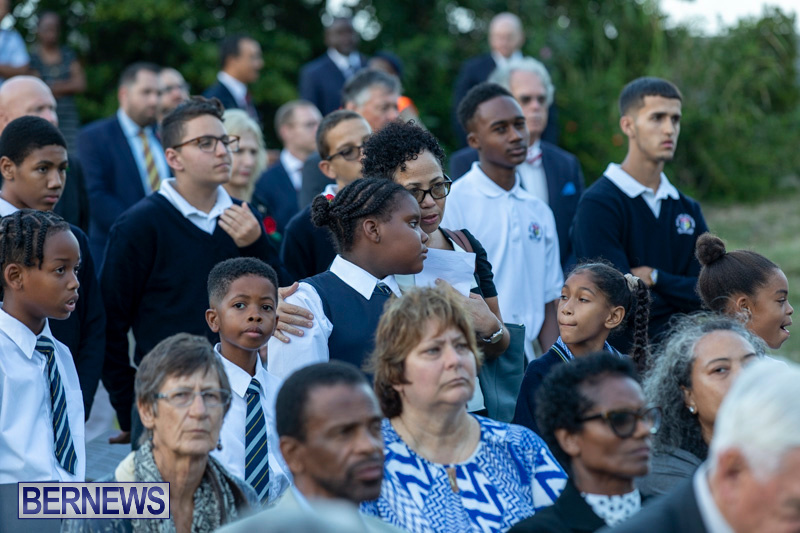 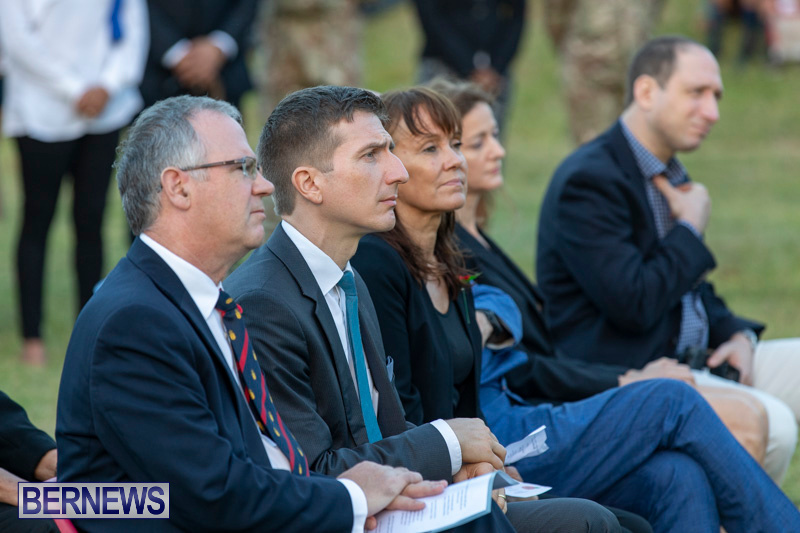 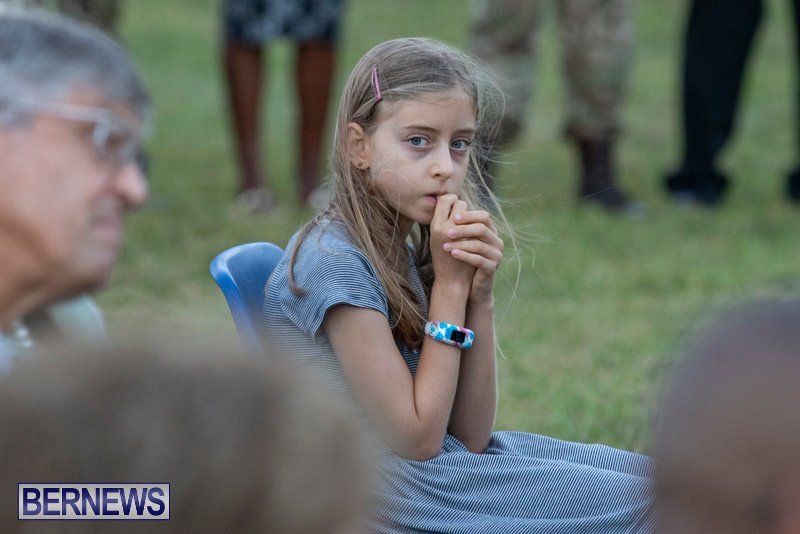 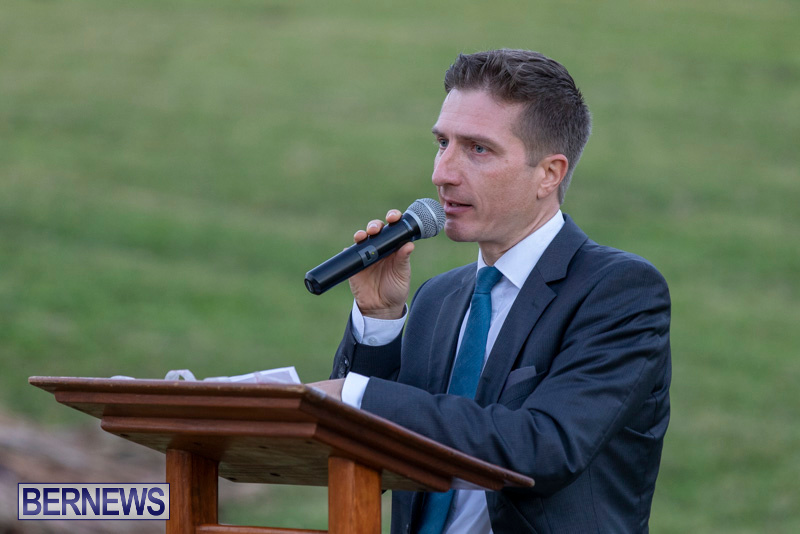 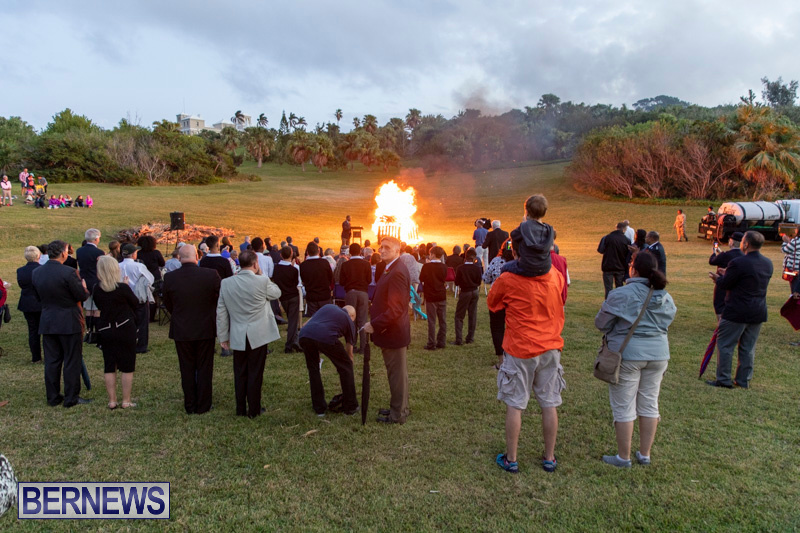 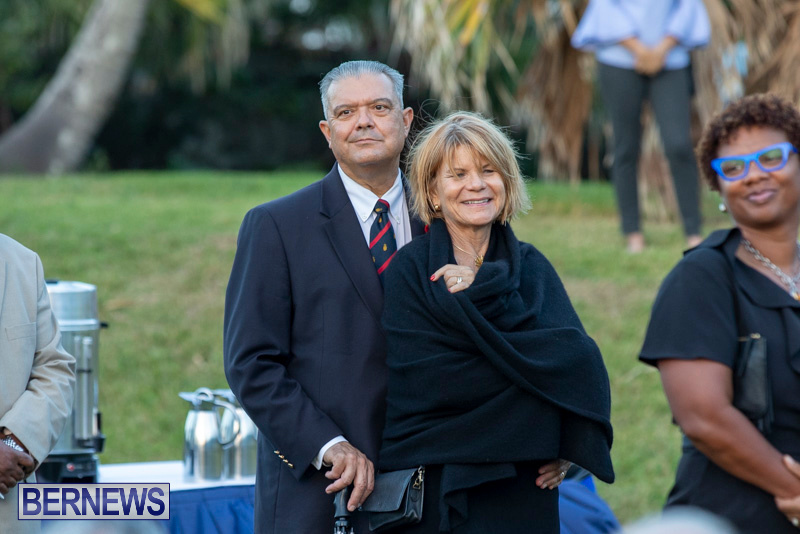 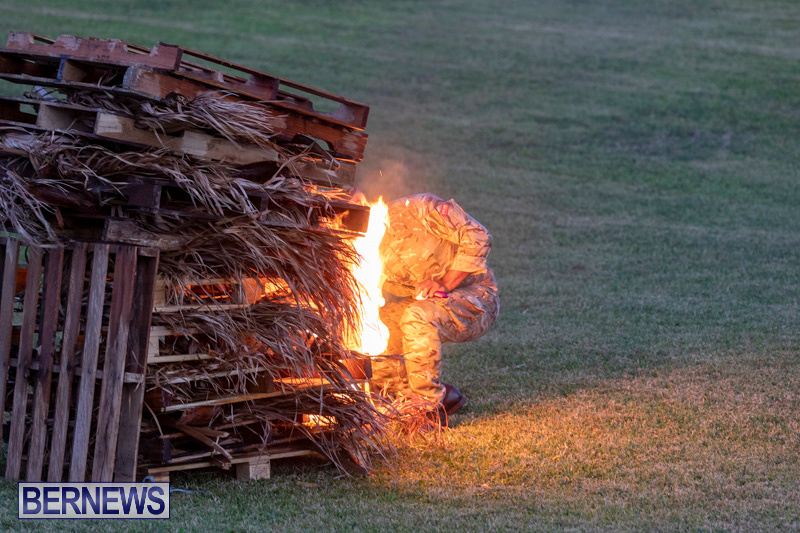 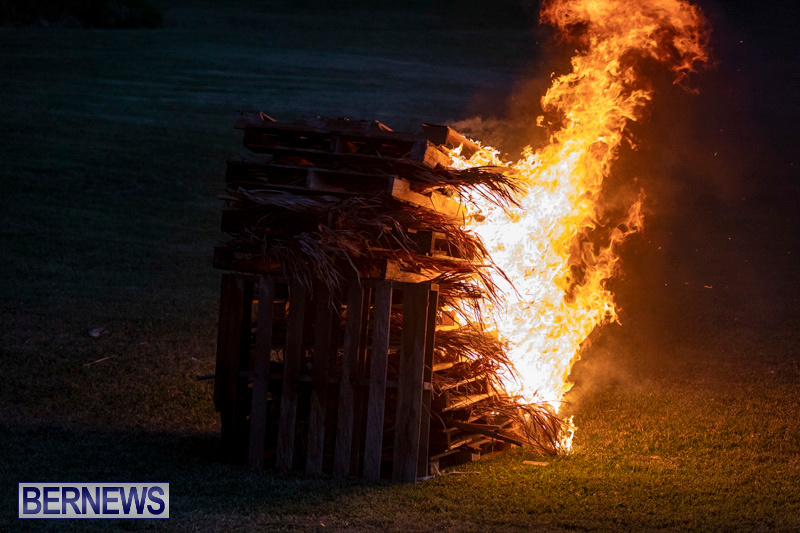 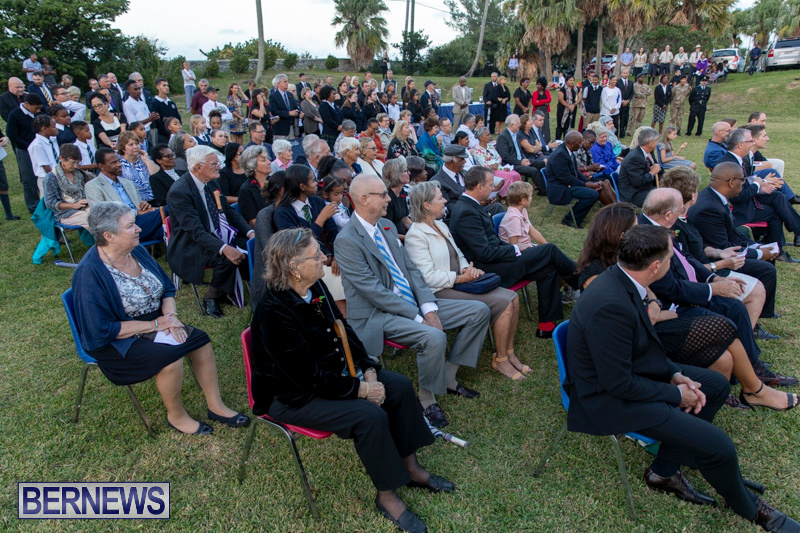 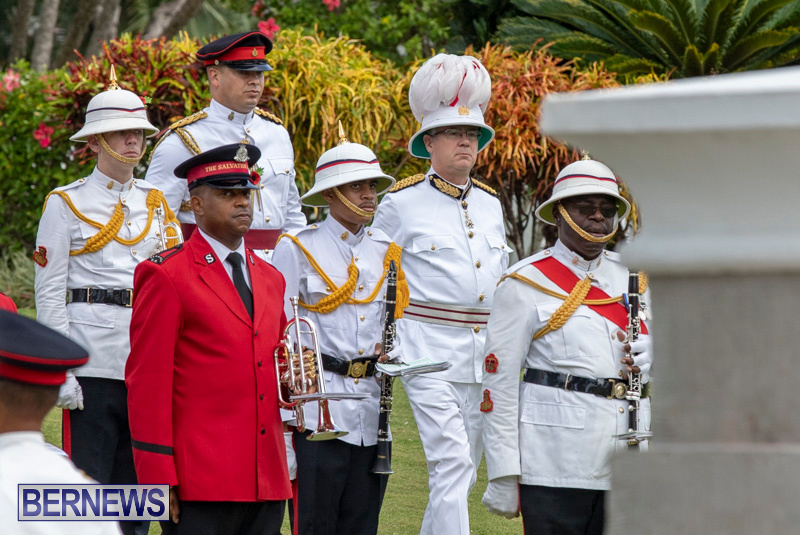 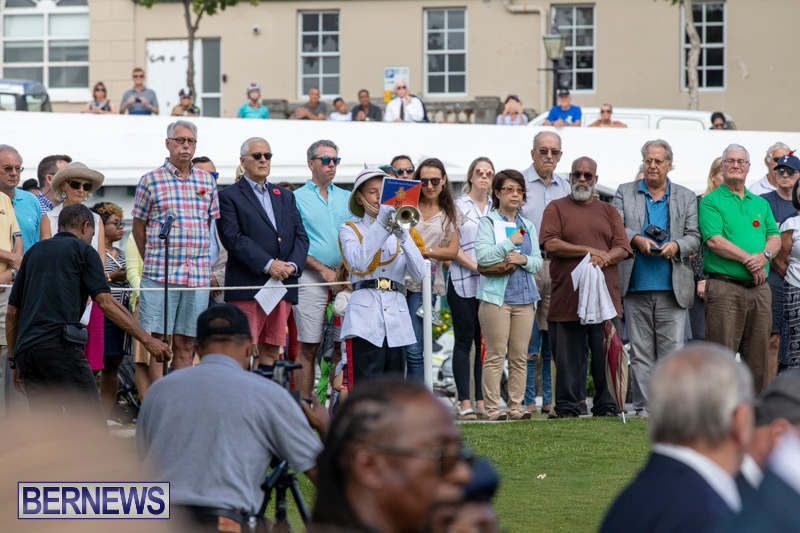 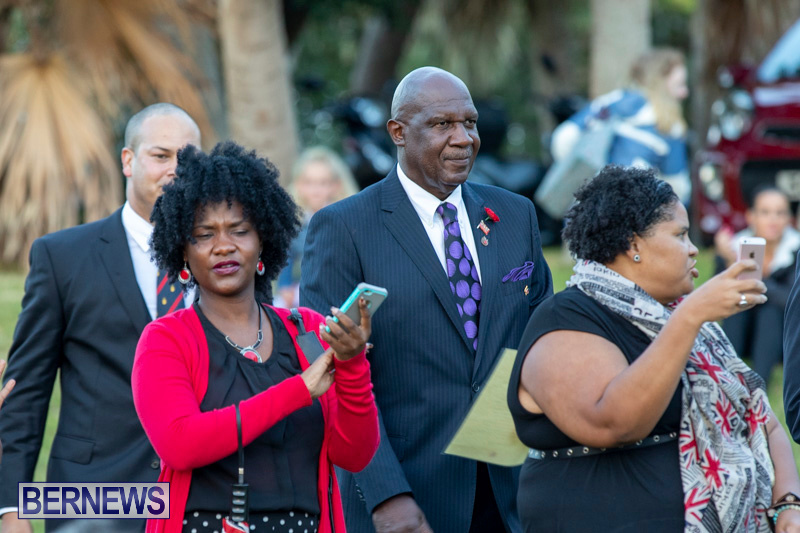 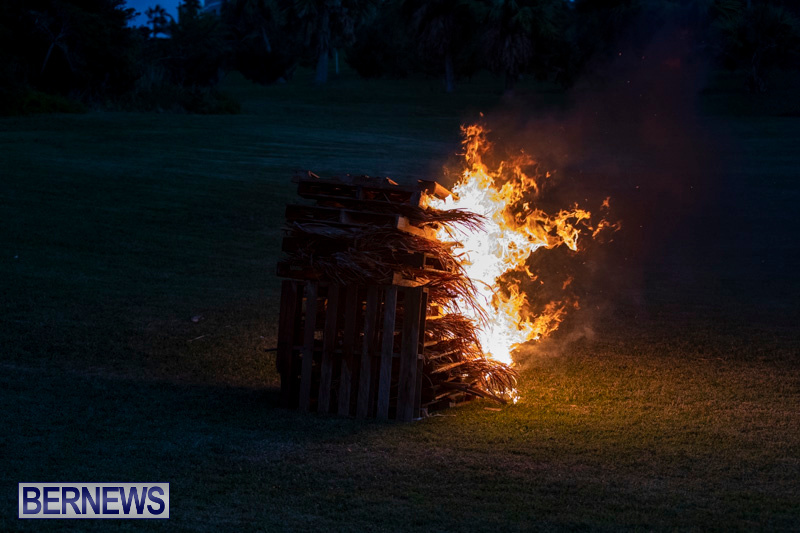 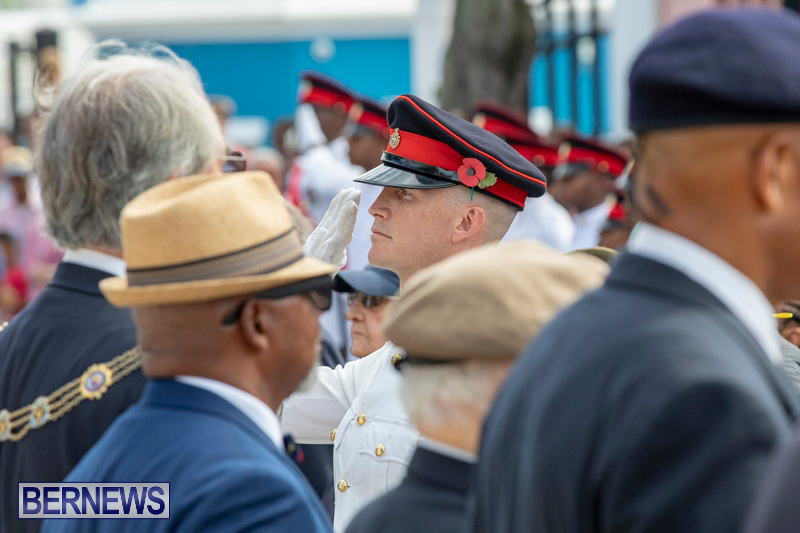 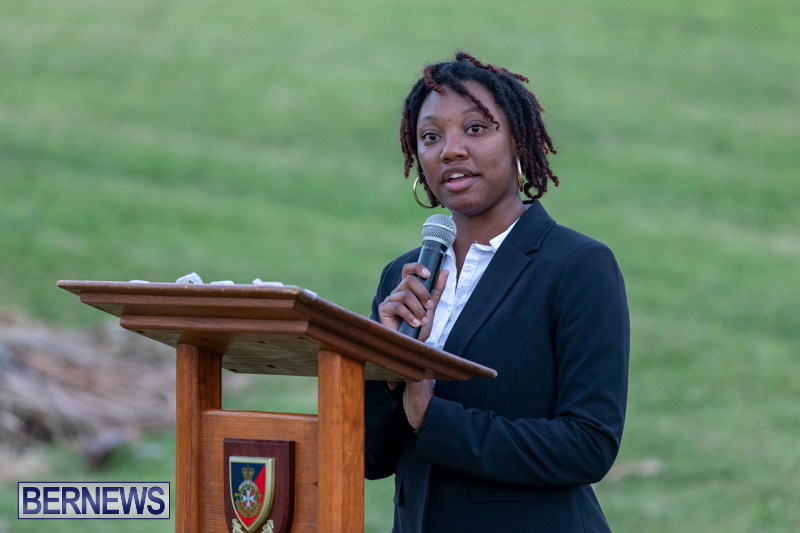 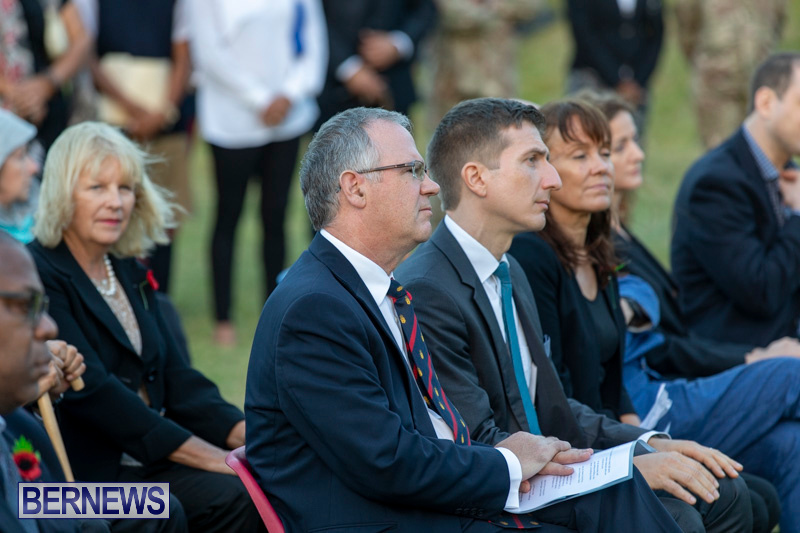 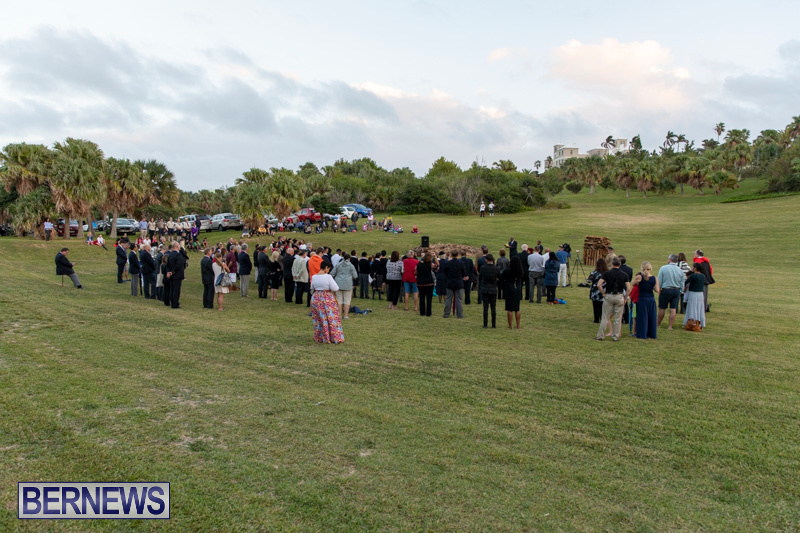 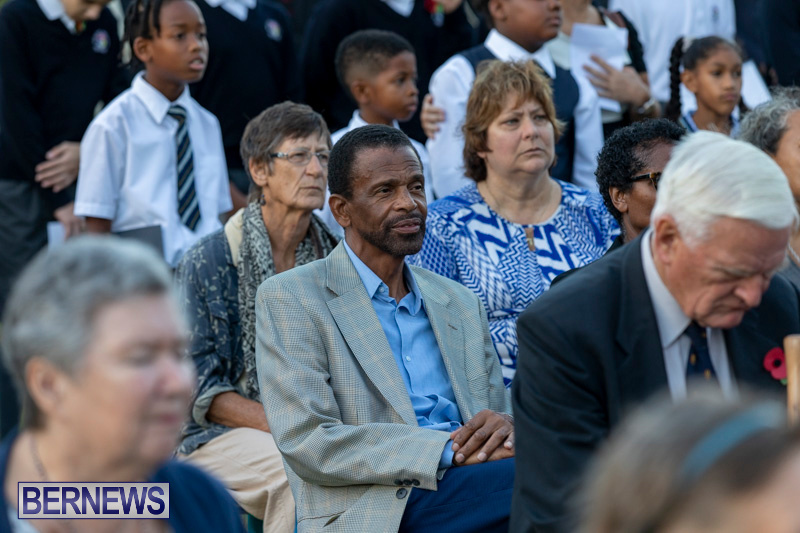 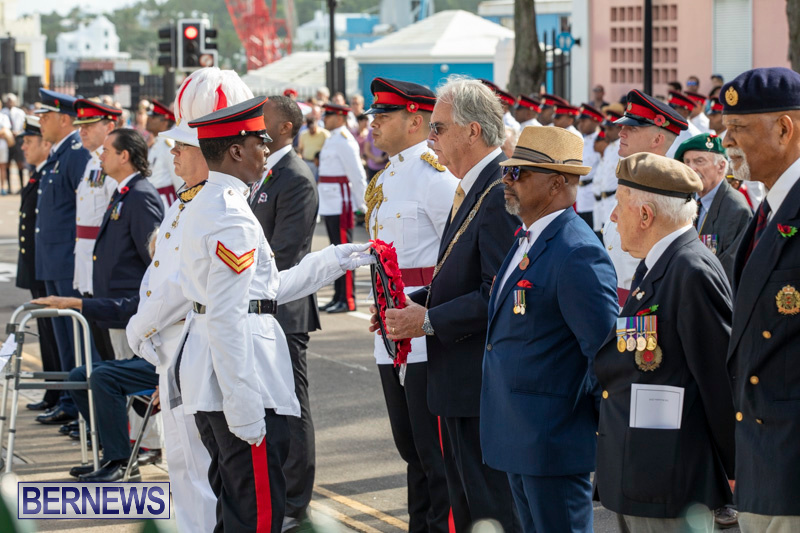 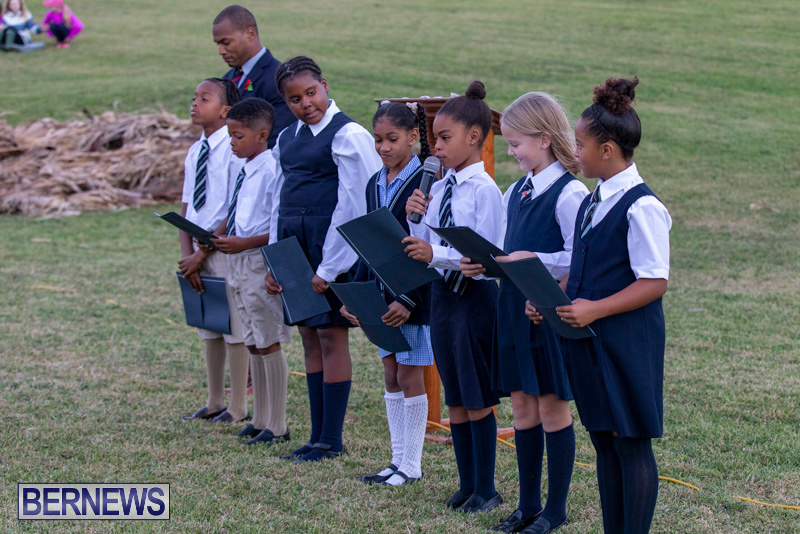 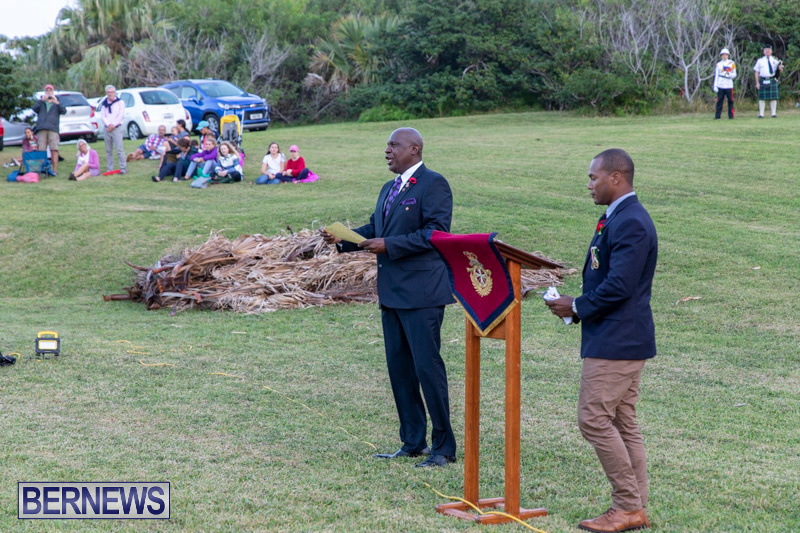 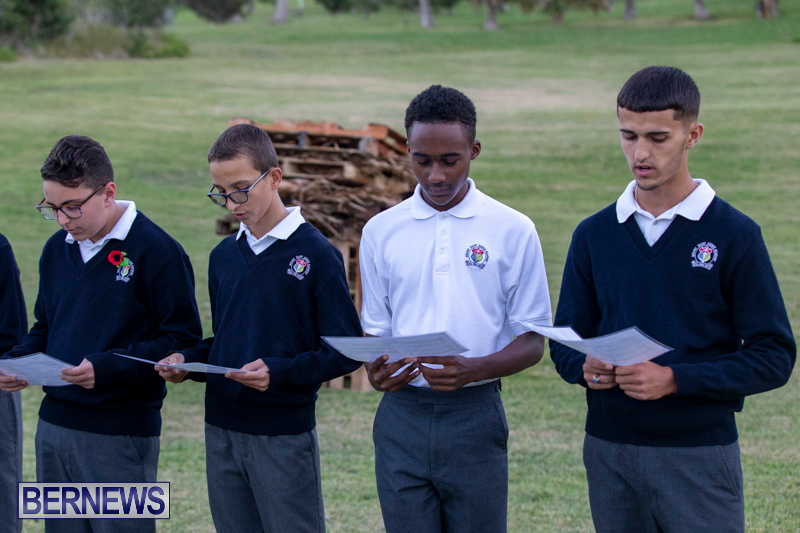 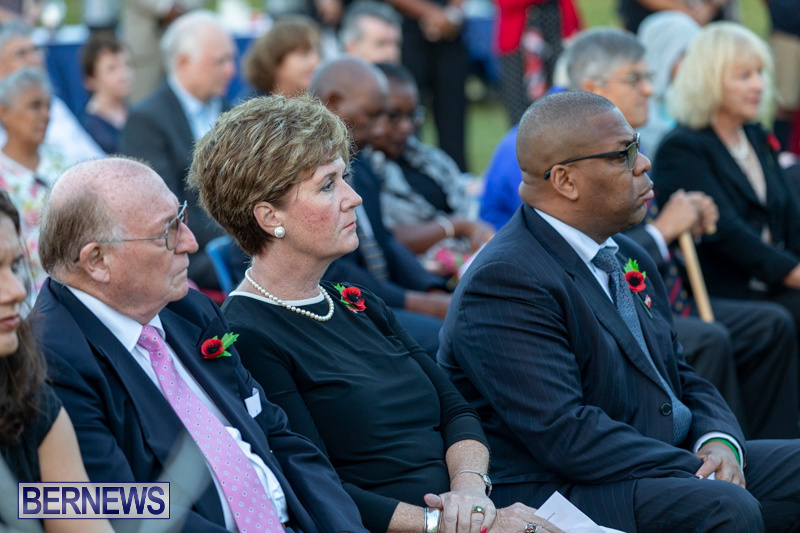 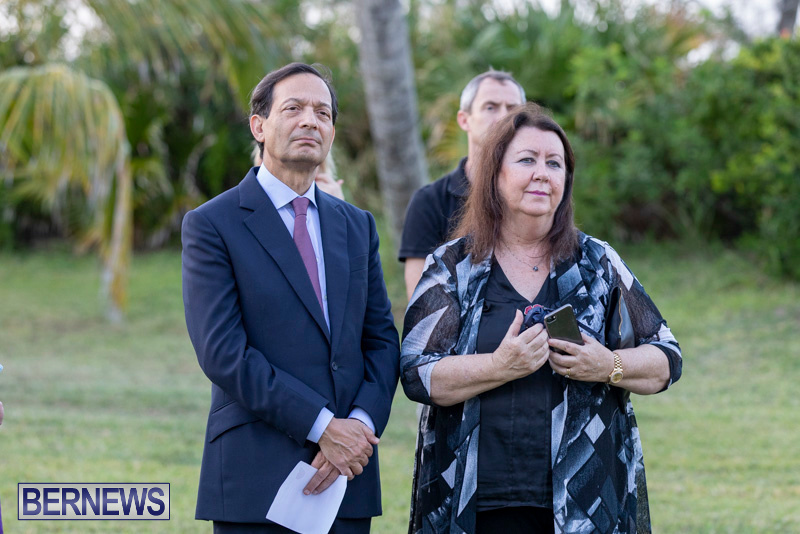 Governor John Rankin, members of the public and guests, including Heiko Schwartz, head of the political department at the German Consulate in New York, watched as the fire was lit in the grounds by soldiers from the Royal Bermuda Regiment. 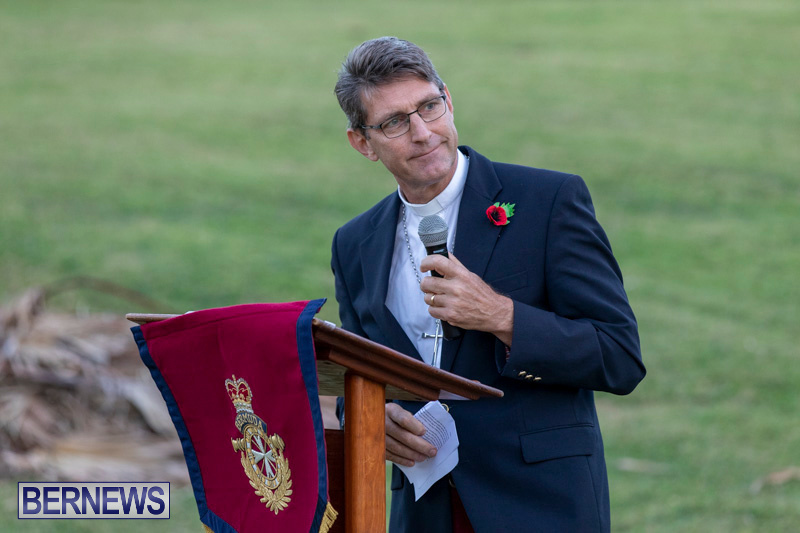 Mr Rankin told the crowds that “however dark the hour, there is always hope”. 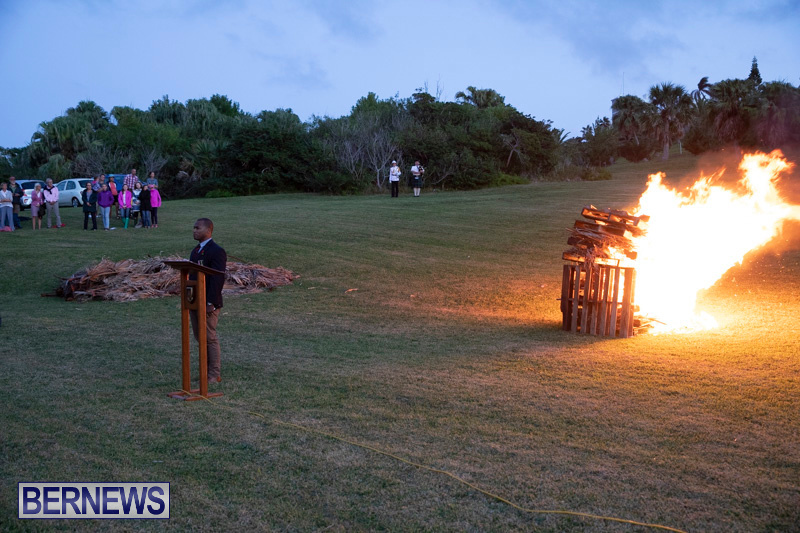 Mr Rankin added the beacon was “a light of hope” and that “we should rededicate ourselves to keeping that light alive”. 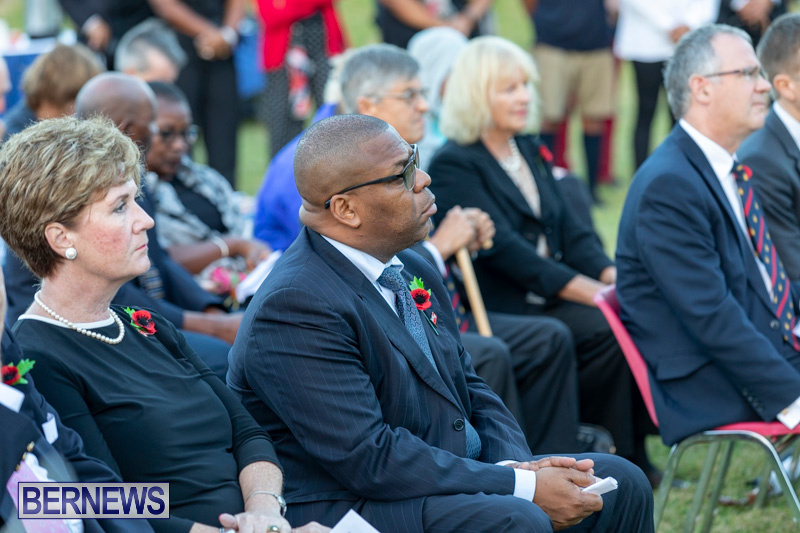 Mr Schwartz said he was honoured to accept the invitation to visit Bermuda for Remembrance Day. 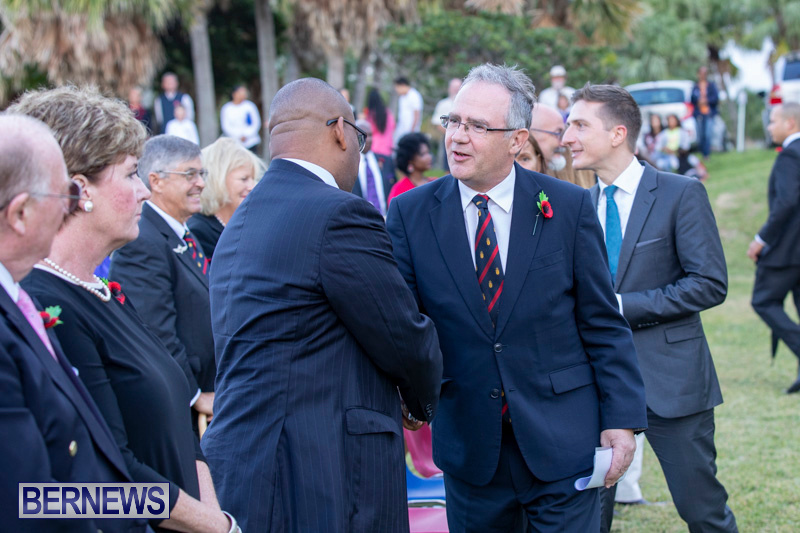 He added: “For us, it was a strong signal of our friendship – we have been enemies before and now we have become friends and close allies. 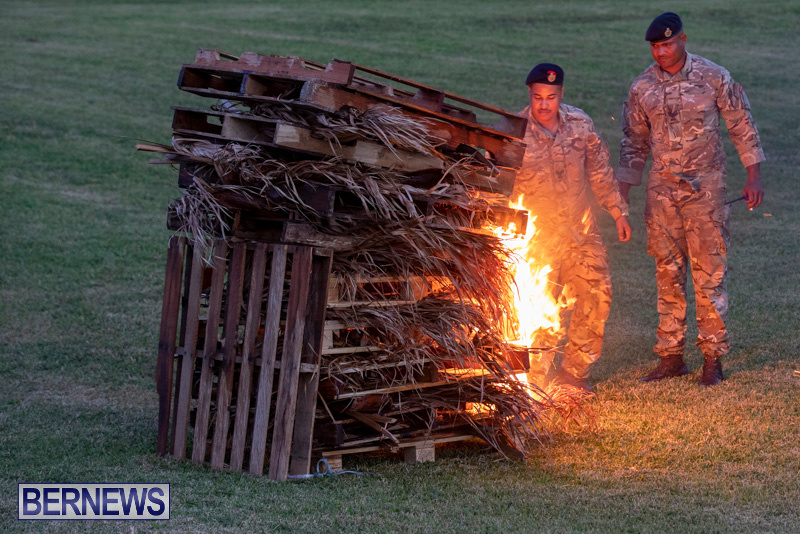 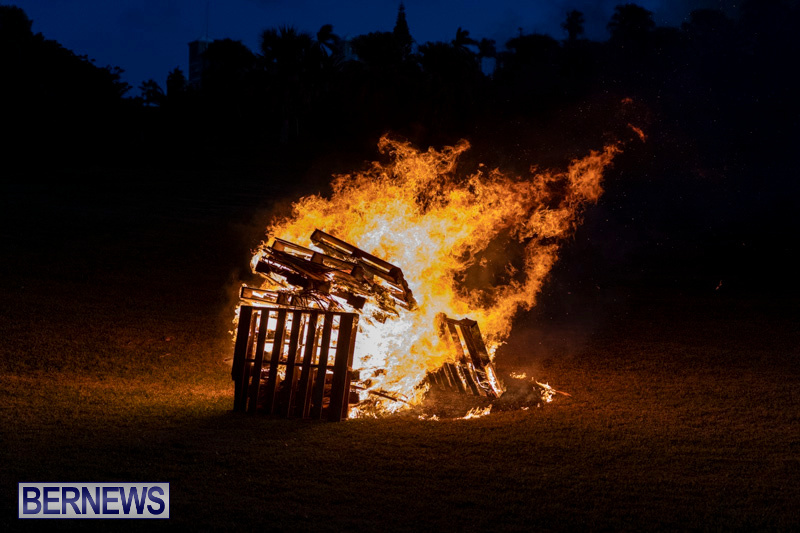 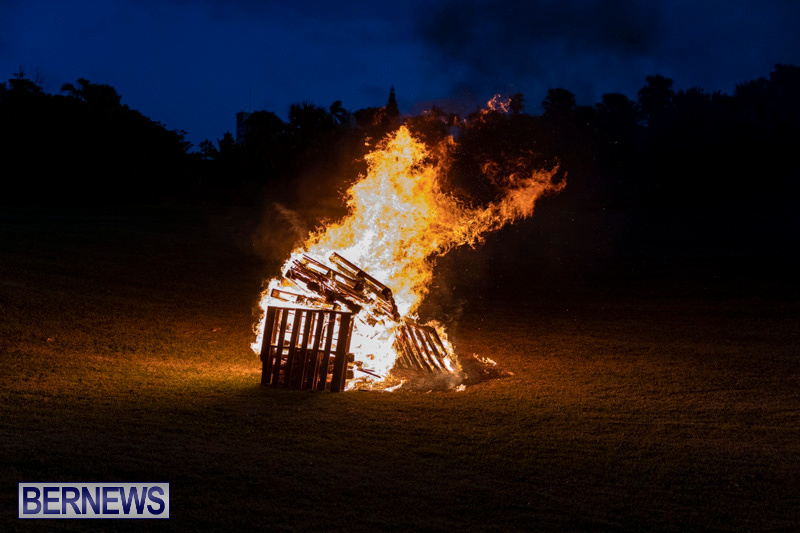 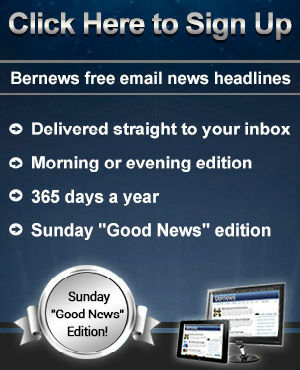 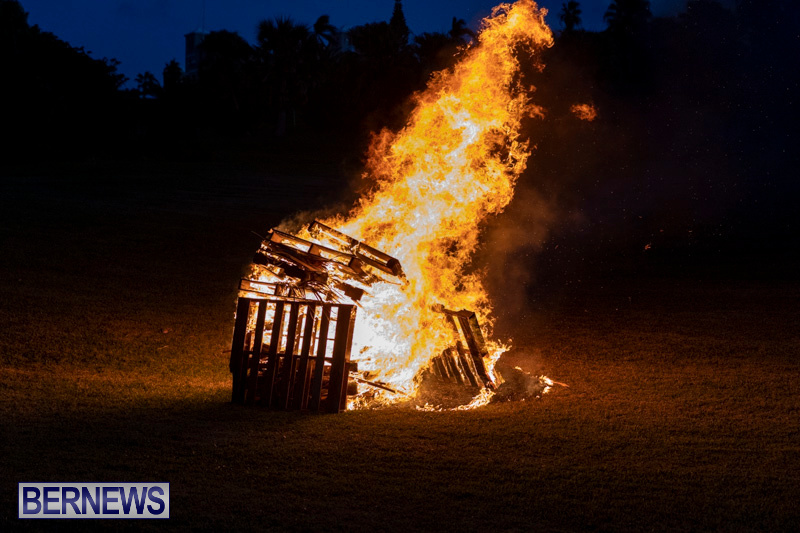 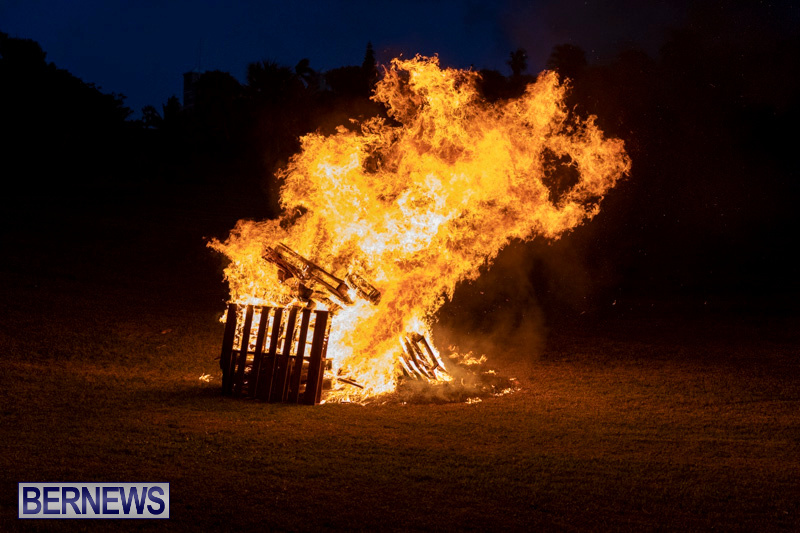 The beacon was one of many lit around the UK, the Commonwealth and in the Overseas Territories to mark the anniversary. 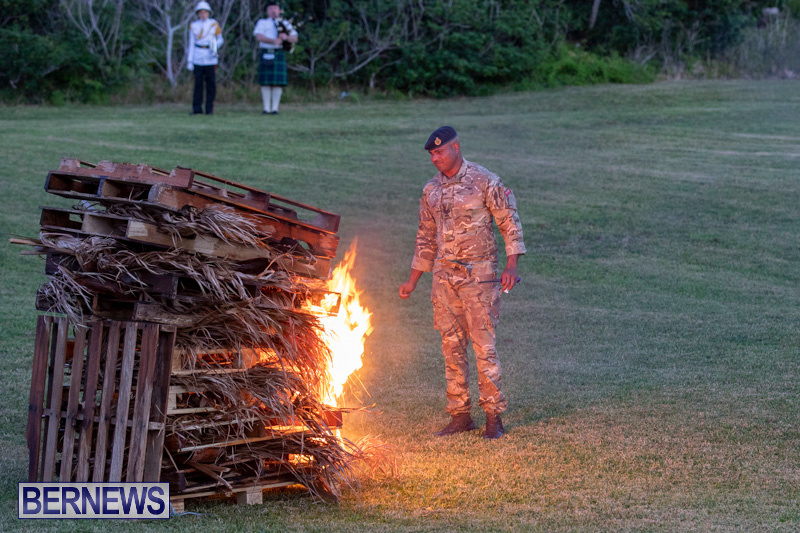 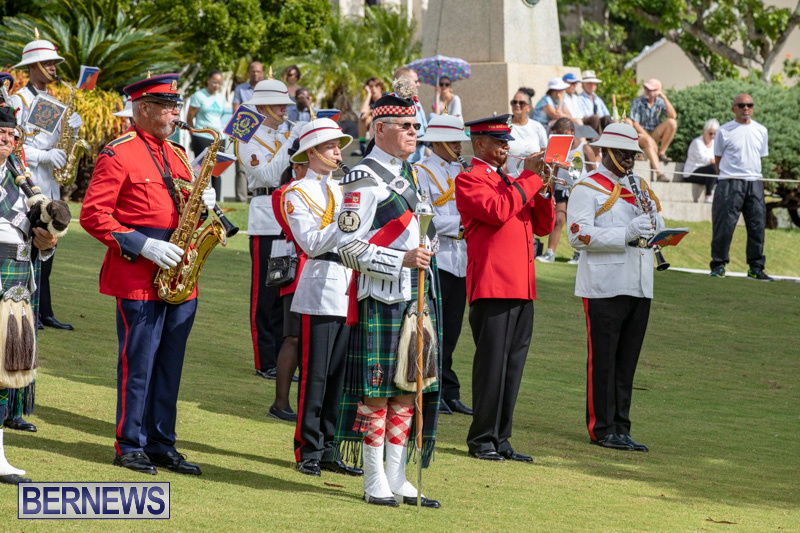 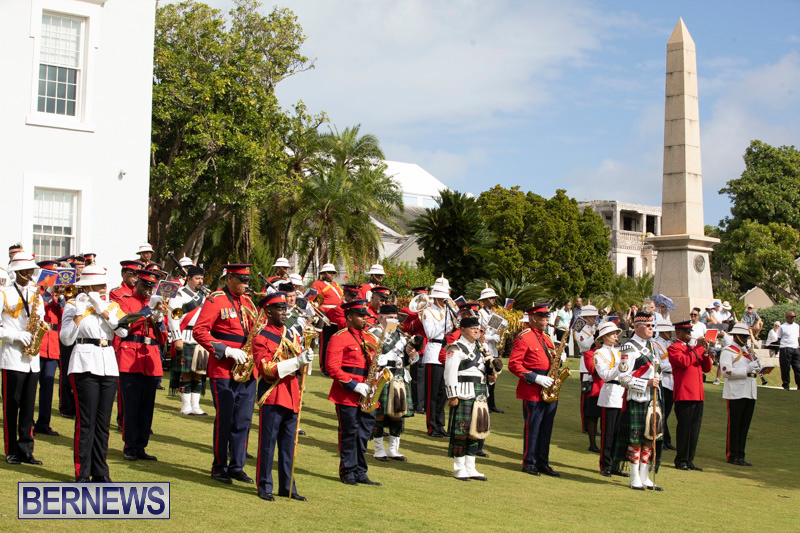 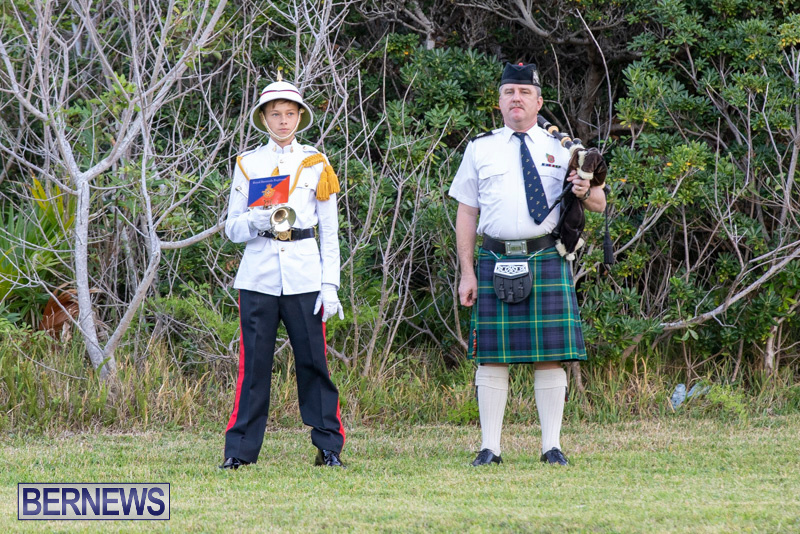 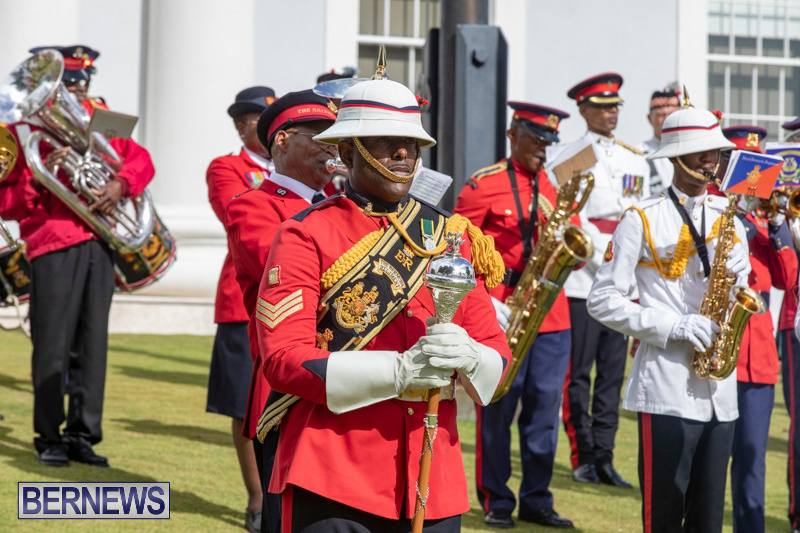 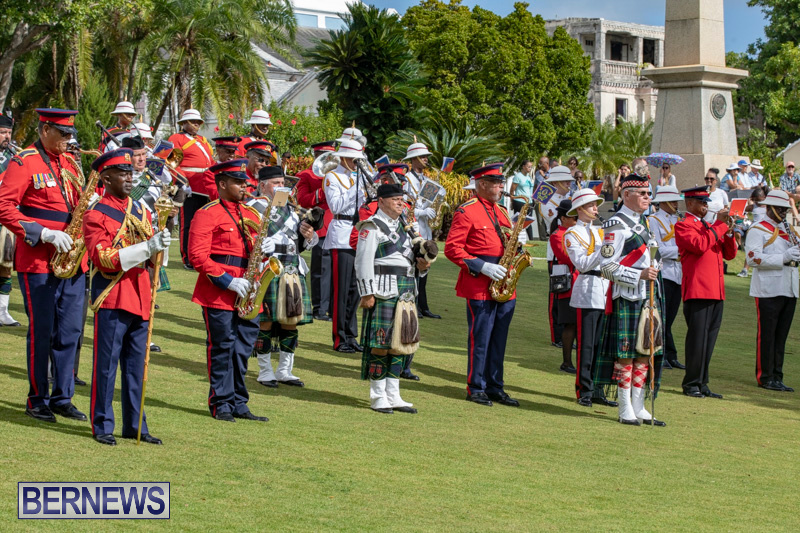 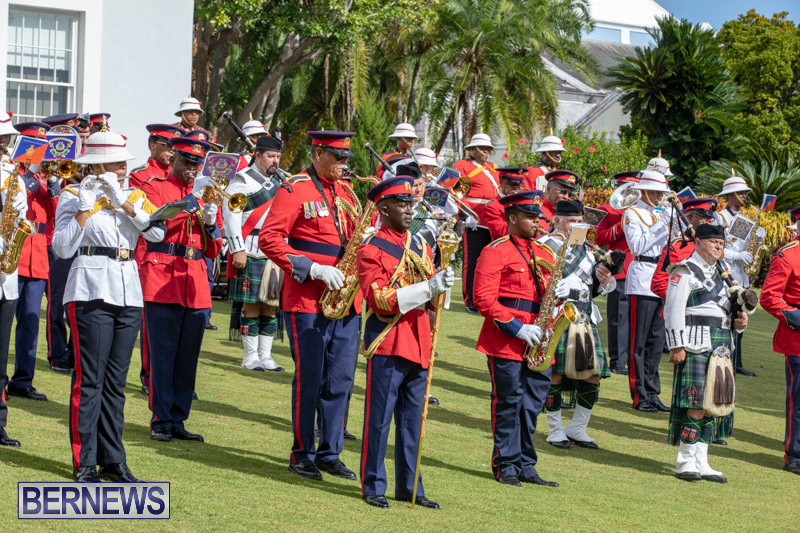 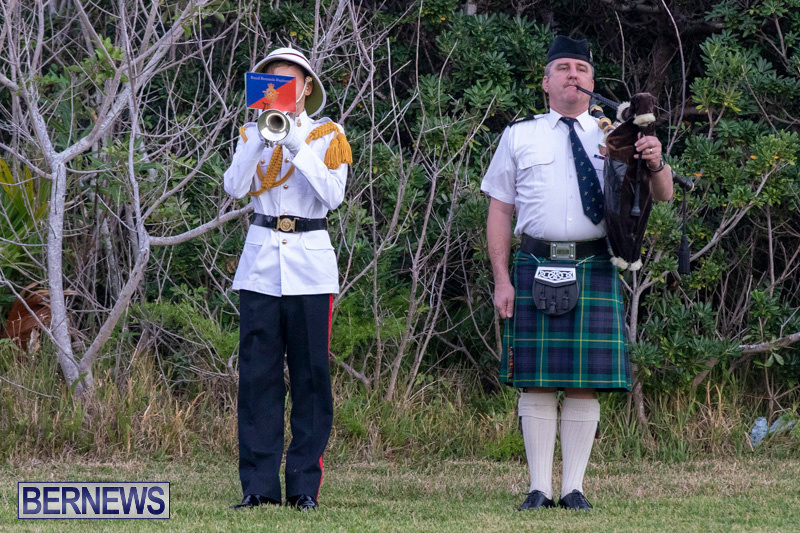 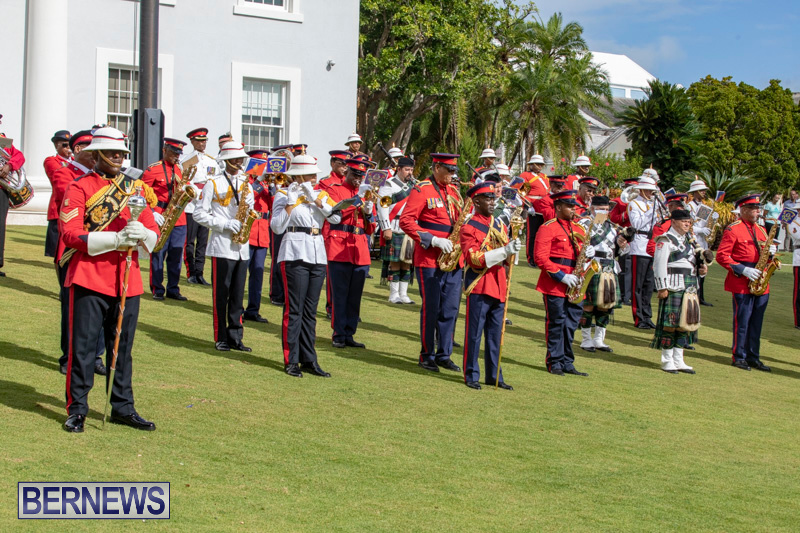 As soldiers from the Royal Bermuda Regiment lit the beacon, an RBR bugler played the Last Post and a piper played the Flowers of the Forest – the traditional lament of Scottish Highland regiments for the fallen. 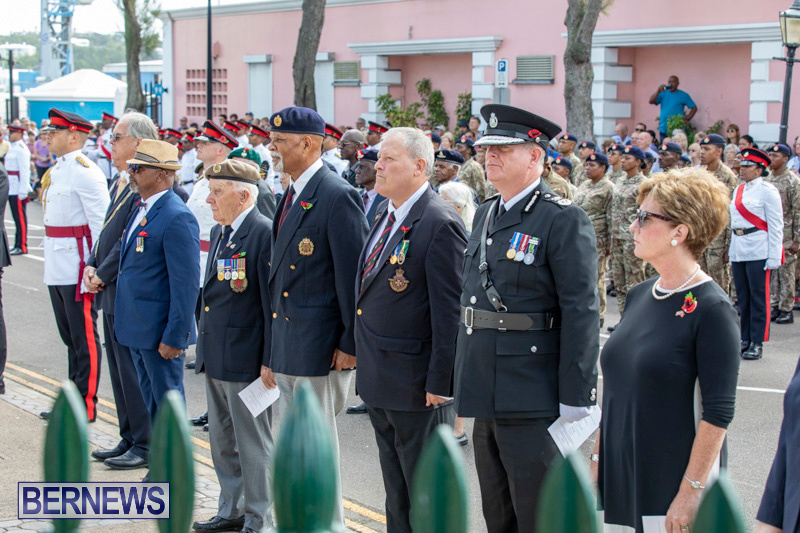 The beacon ceremony came only hours after a crowd of hundreds turned out for a Remembrance Day parade designed to mark the 100th anniversary of the end of the First World War. 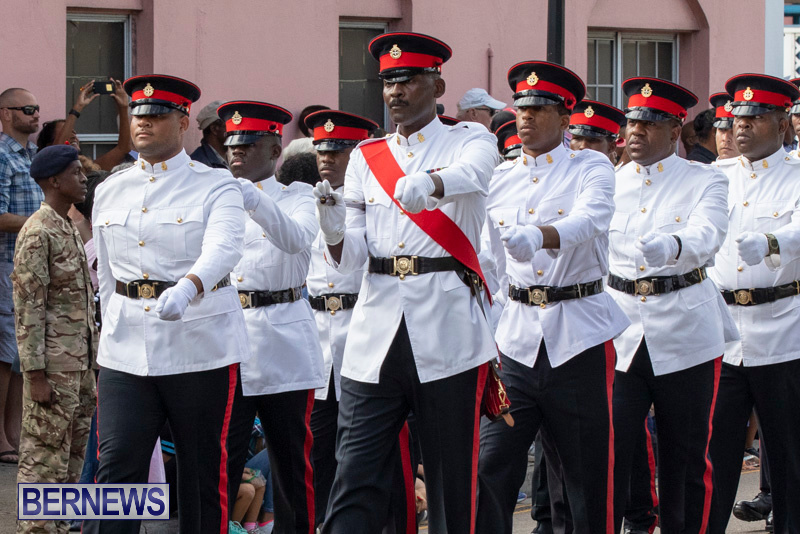 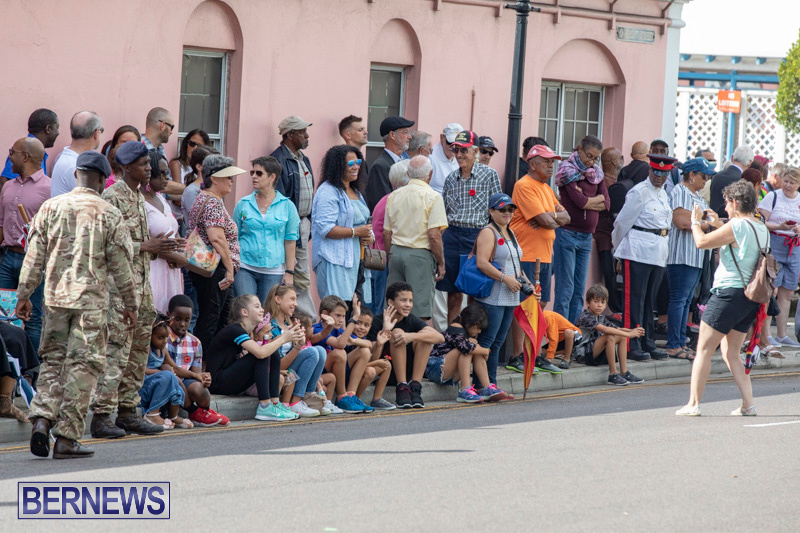 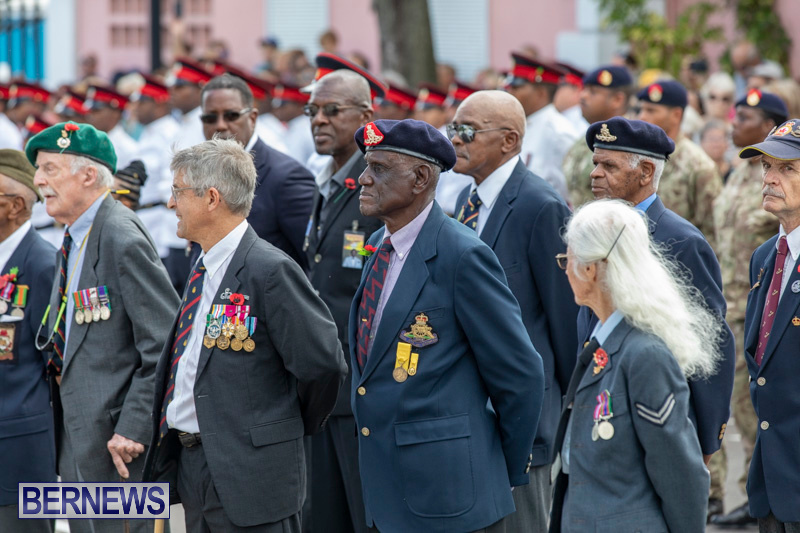 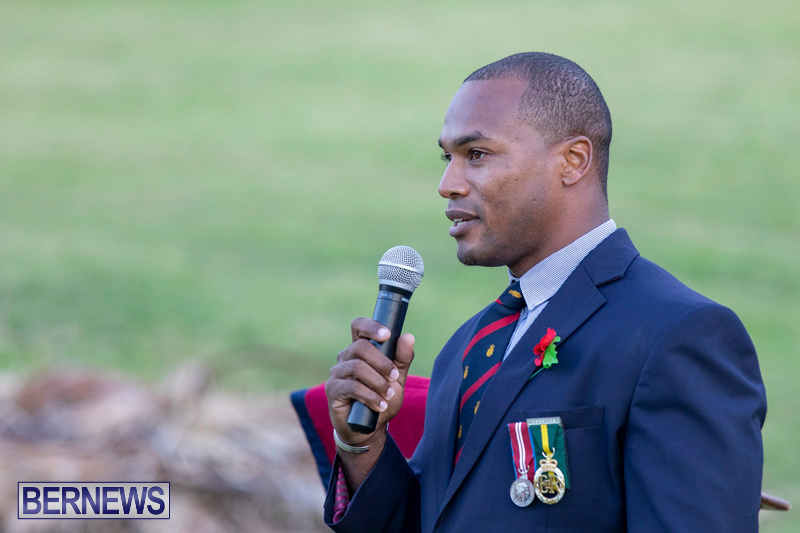 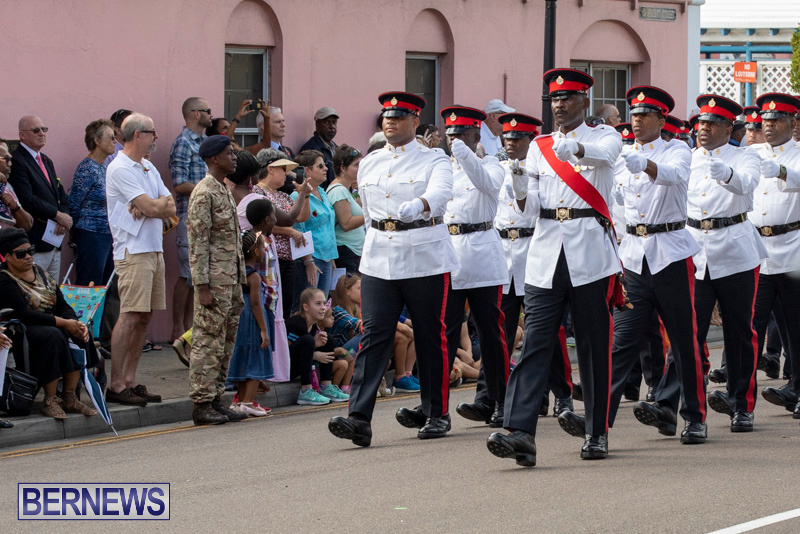 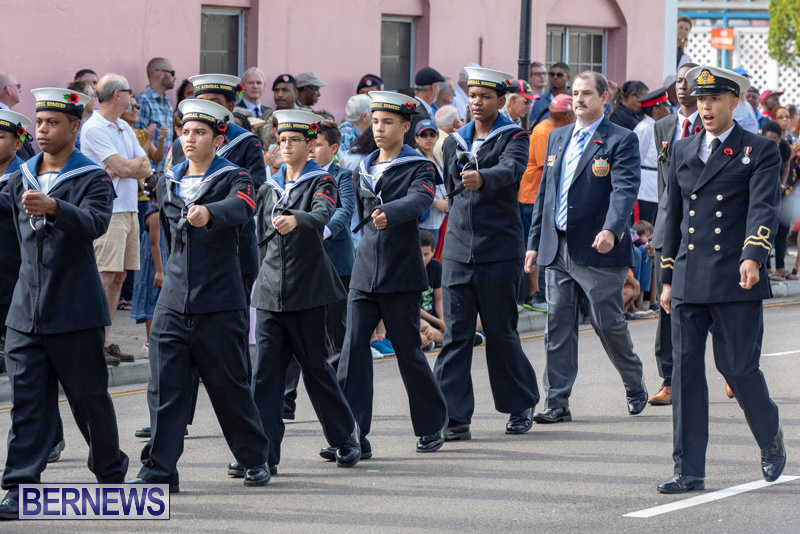 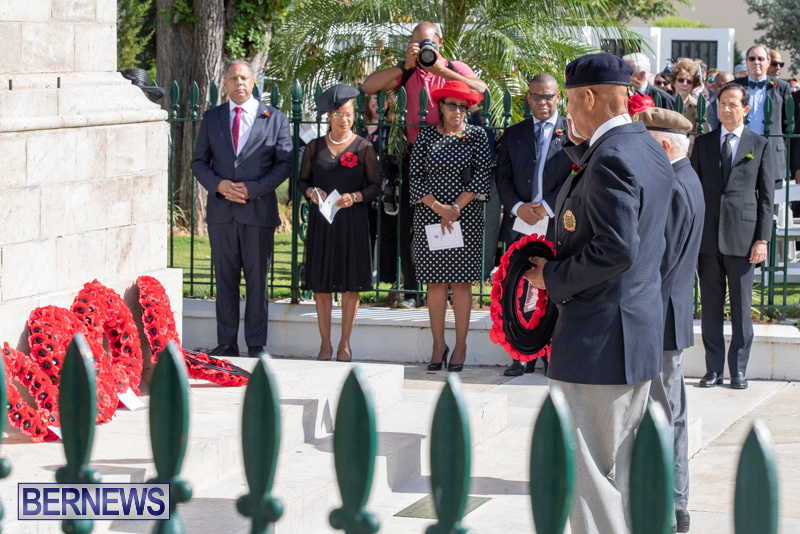 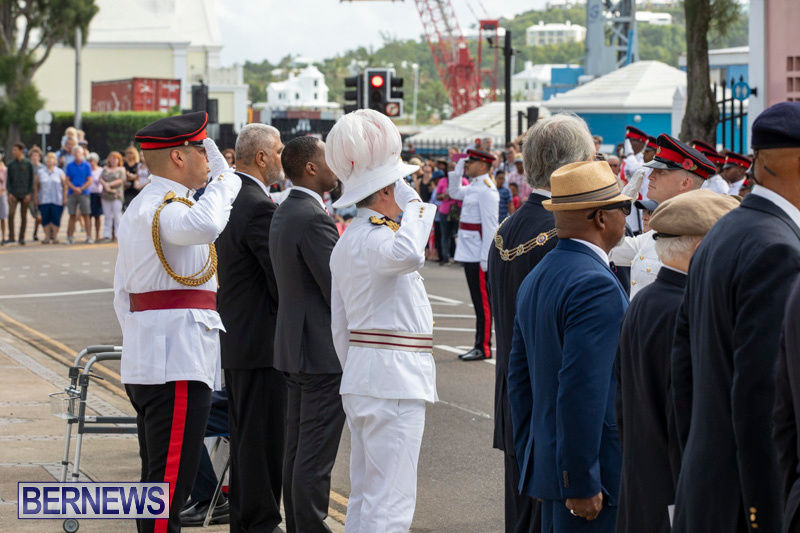 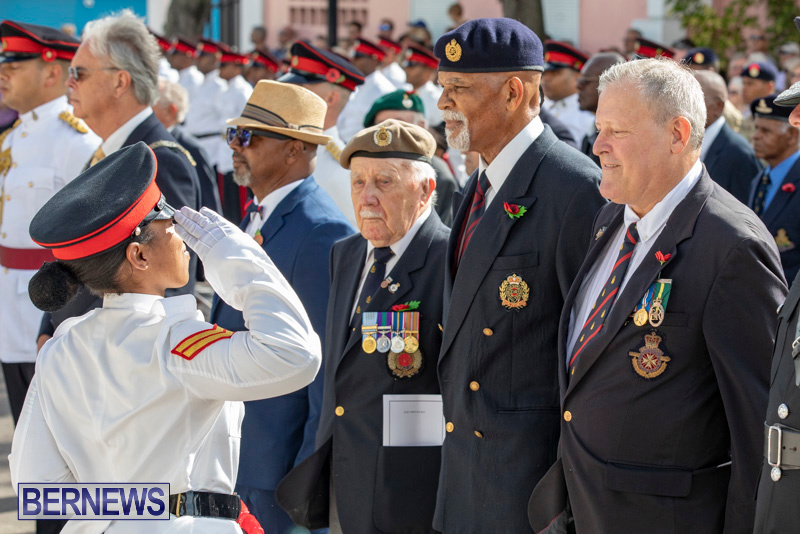 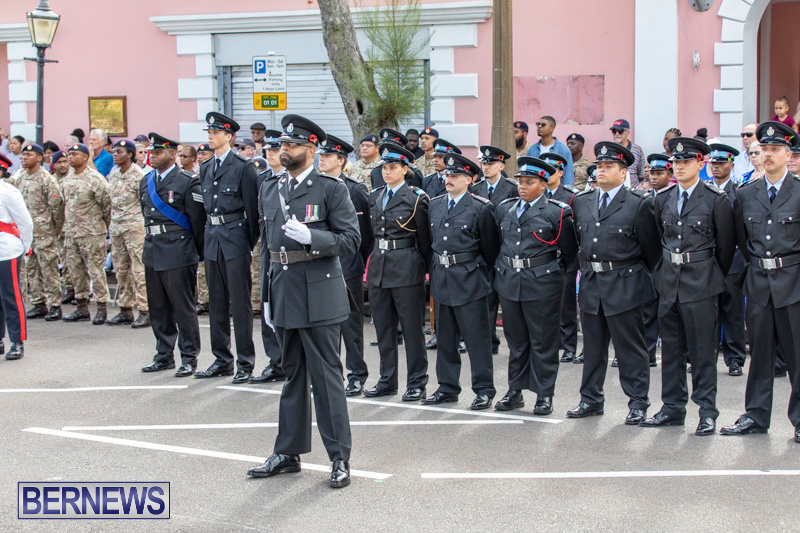 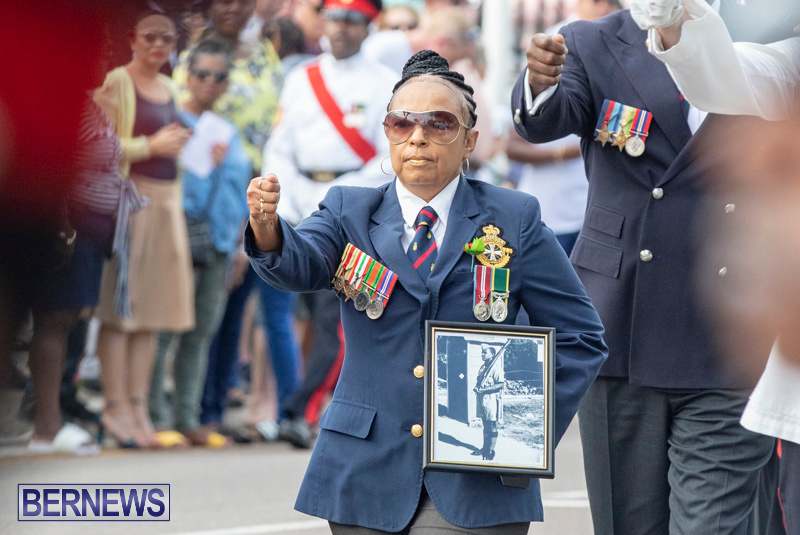 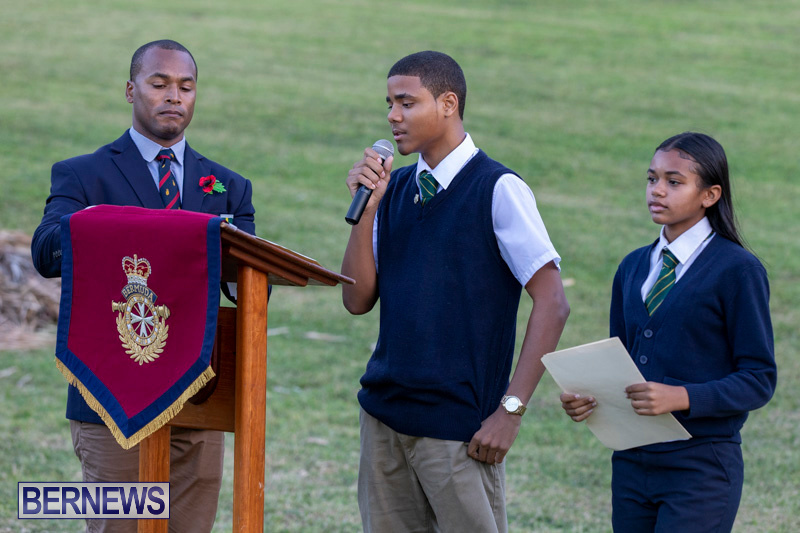 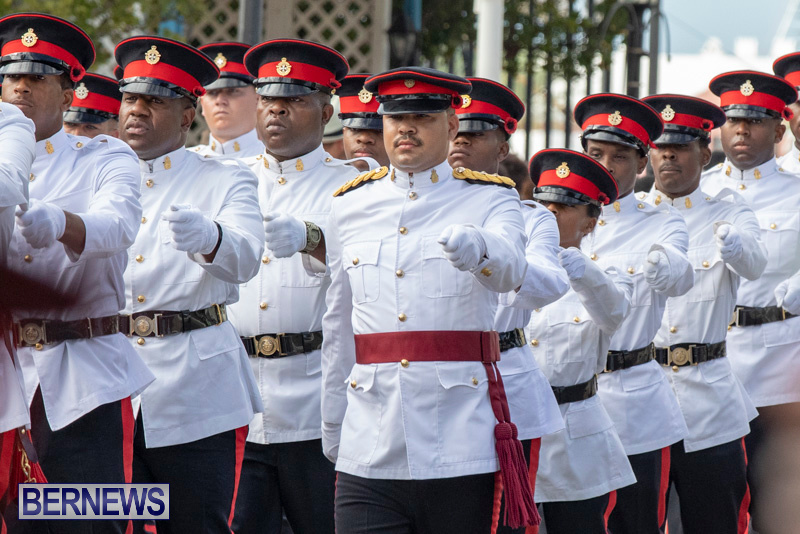 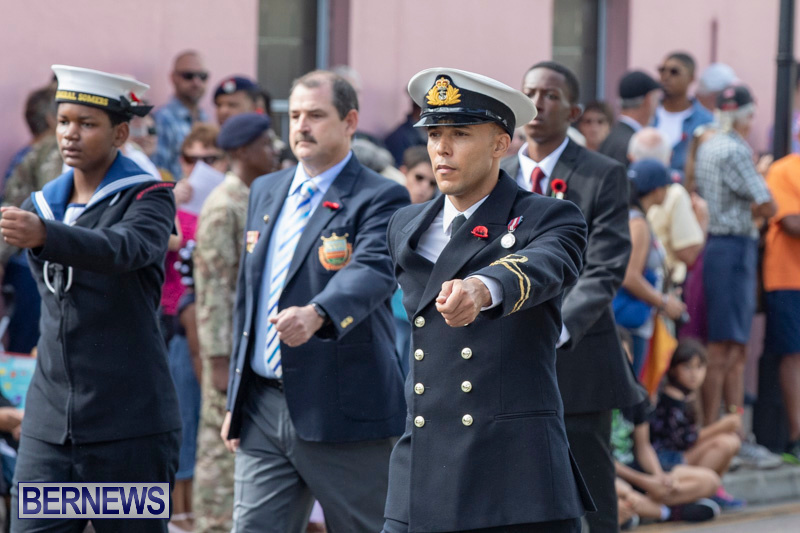 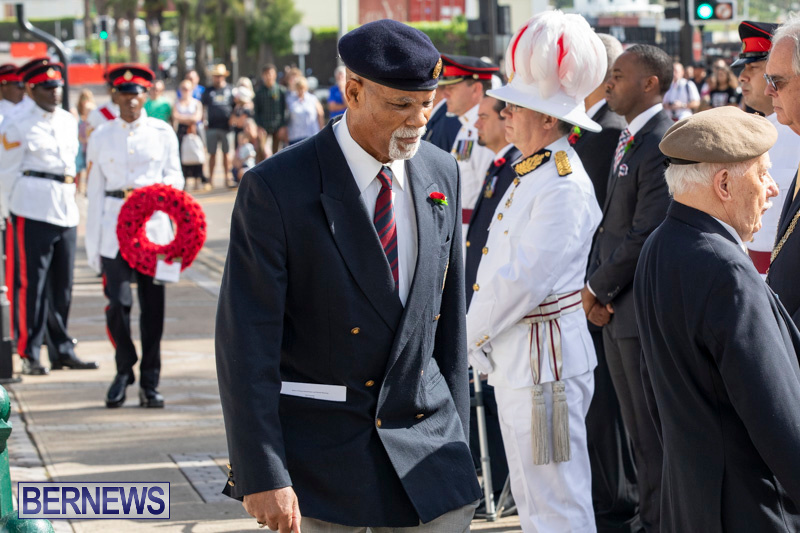 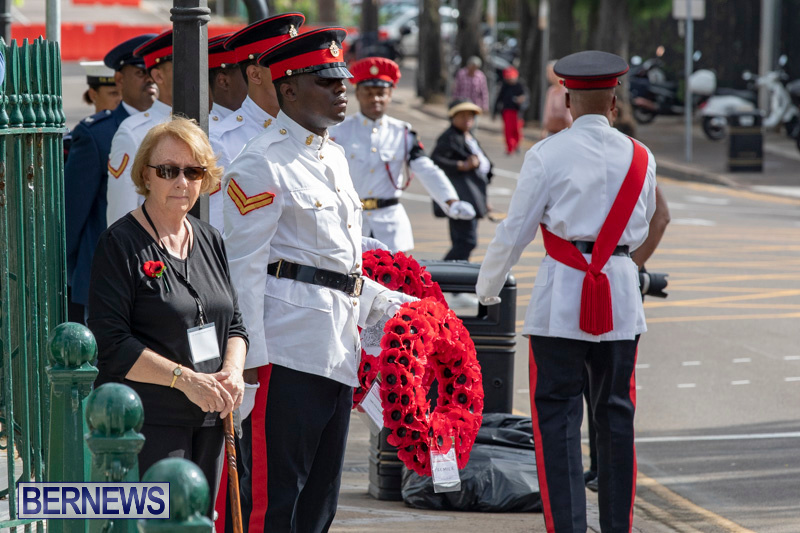 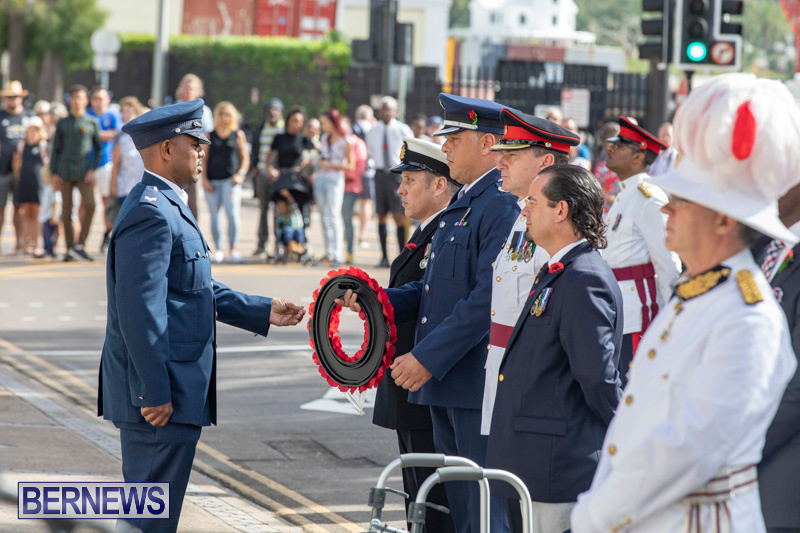 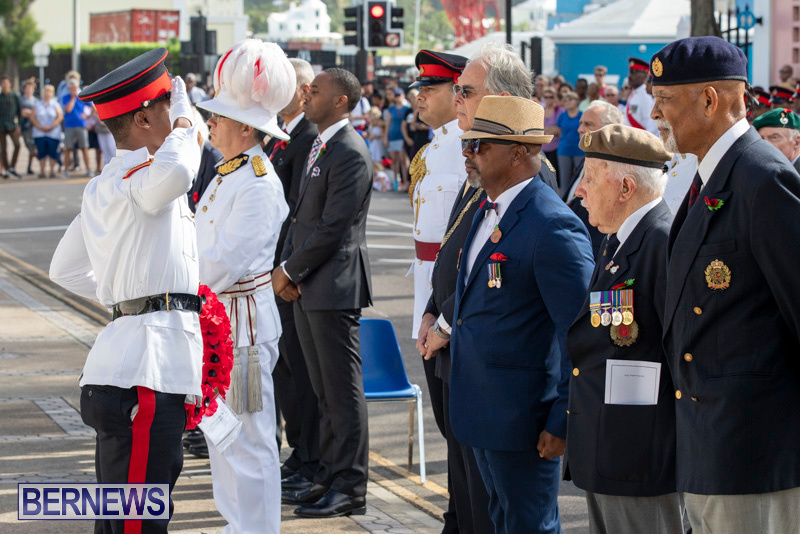 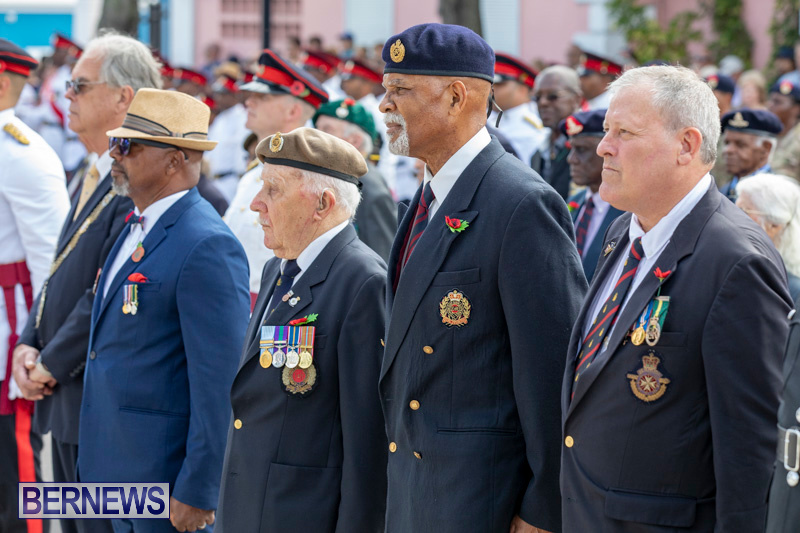 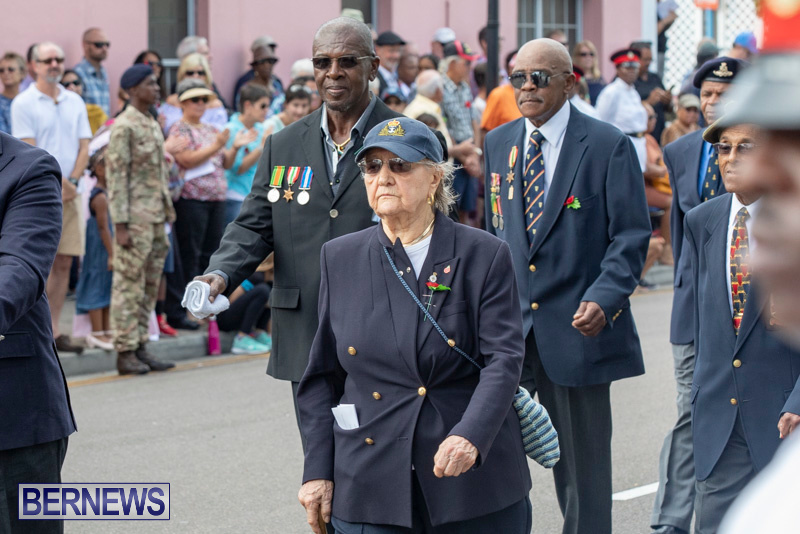 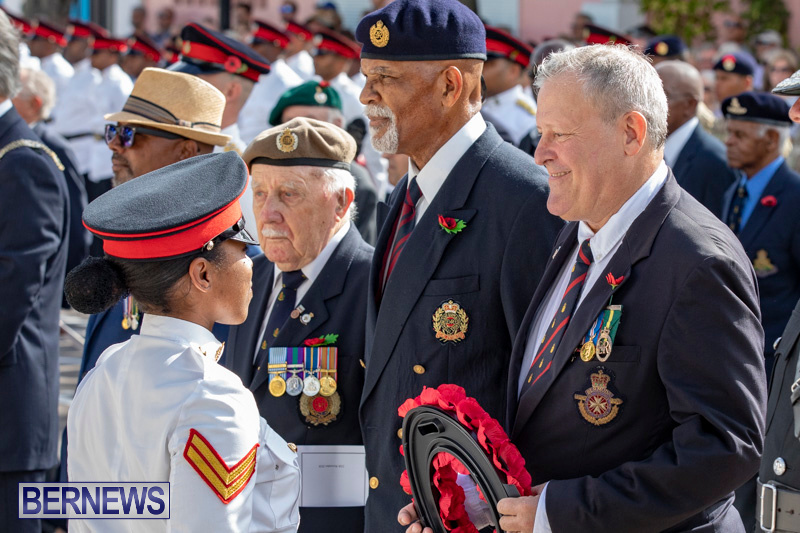 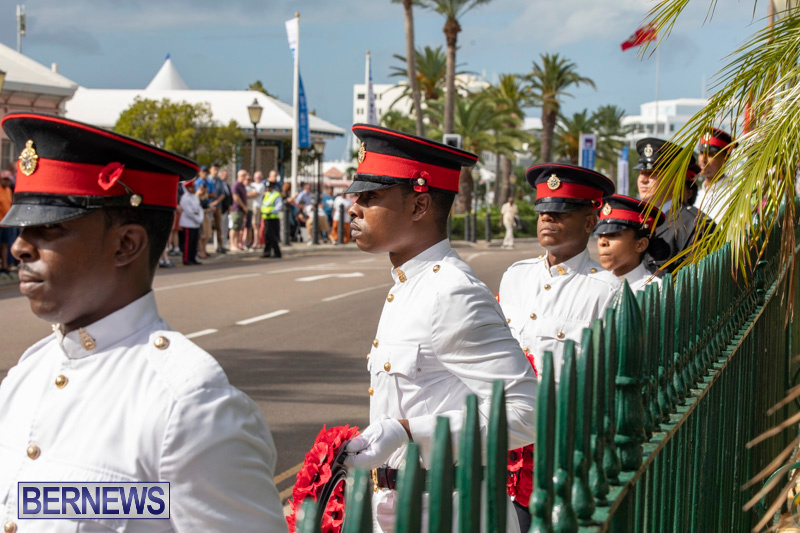 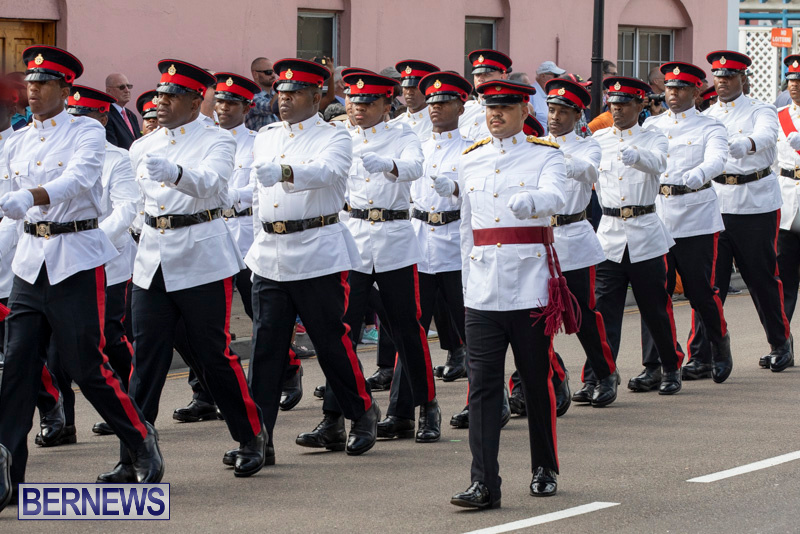 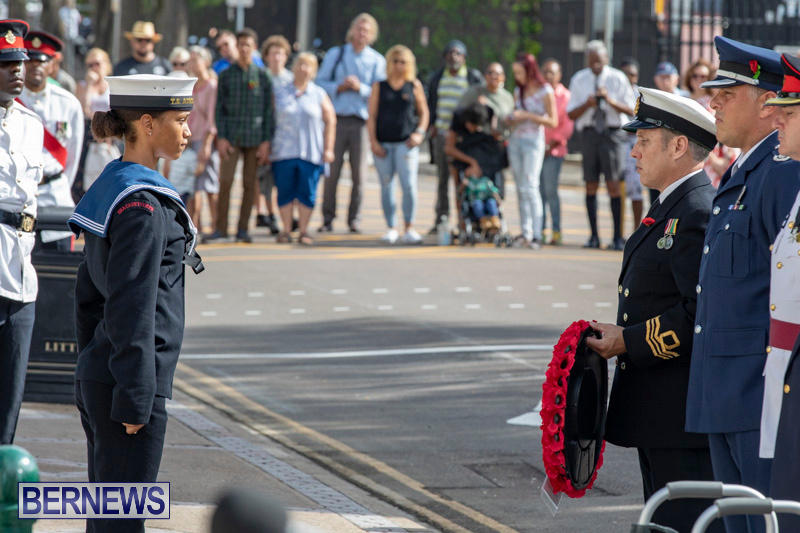 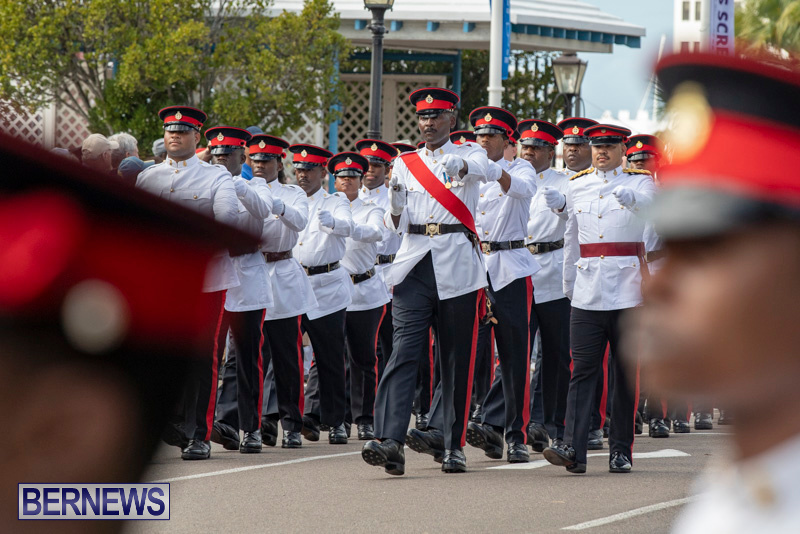 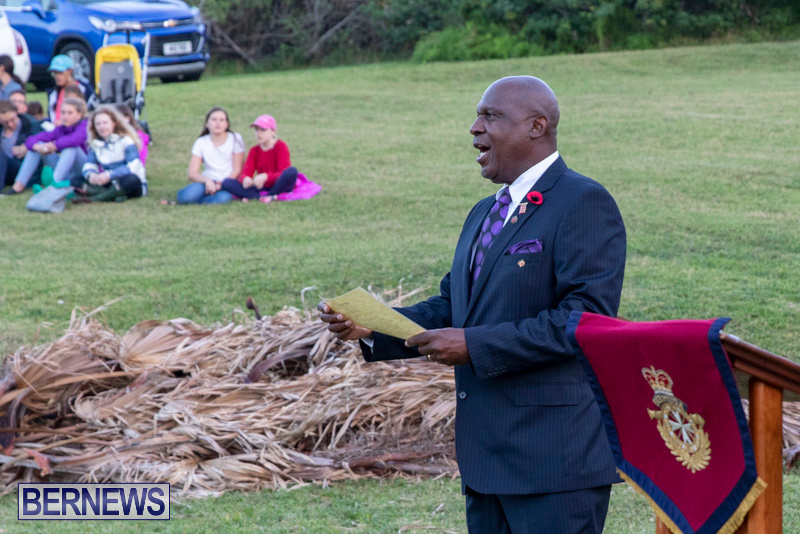 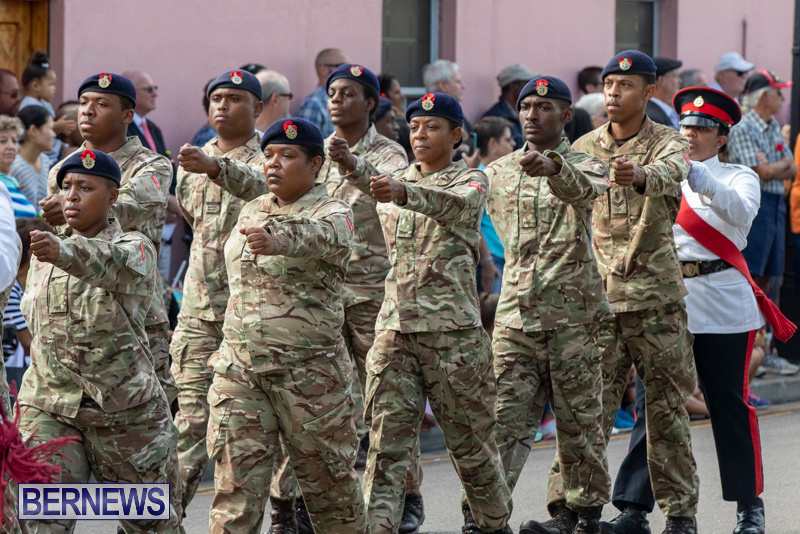 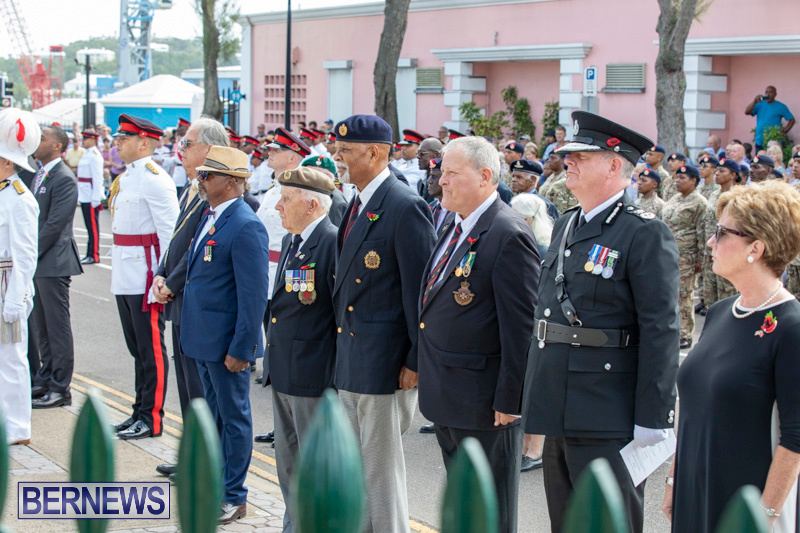 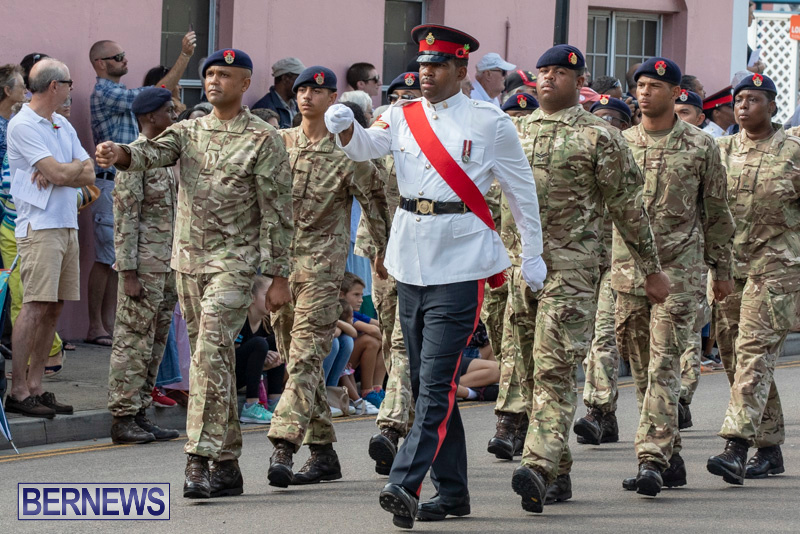 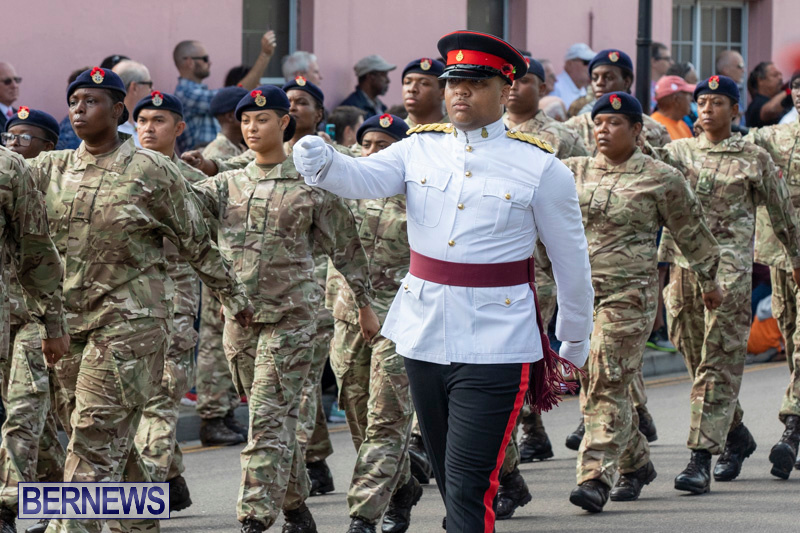 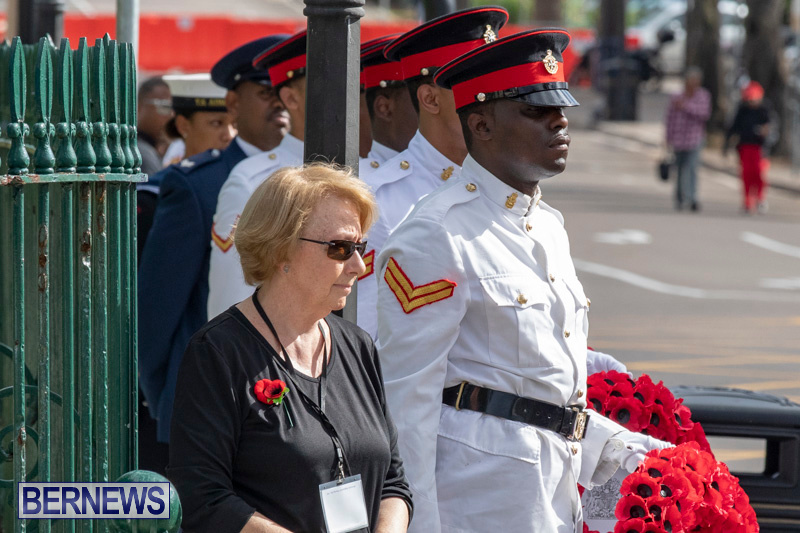 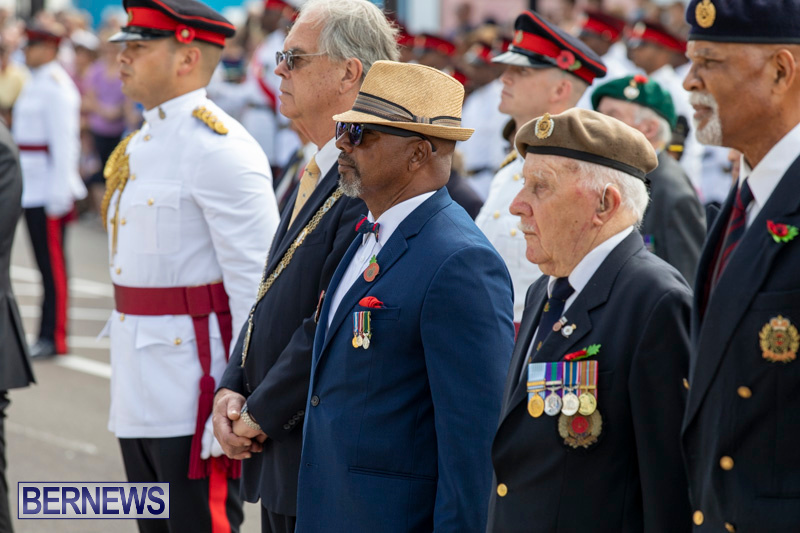 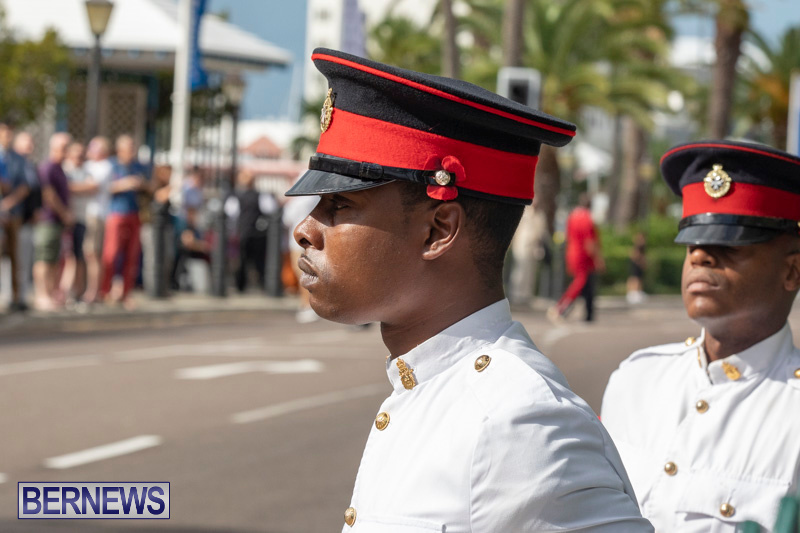 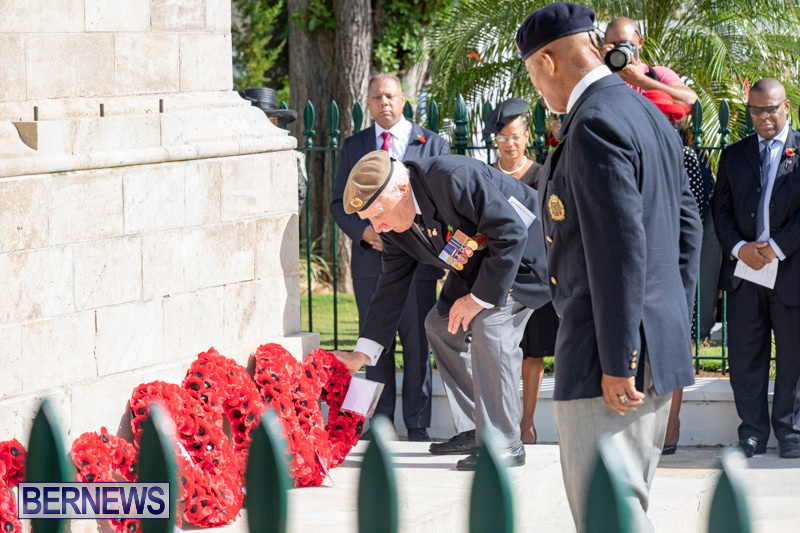 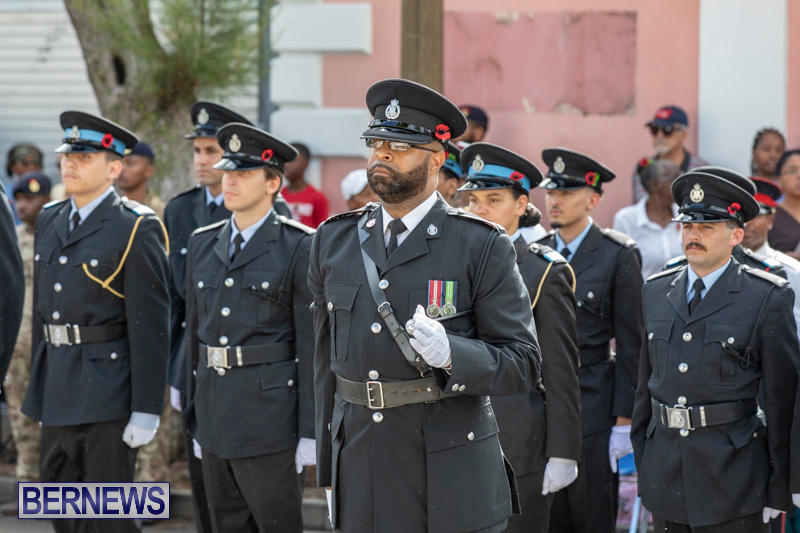 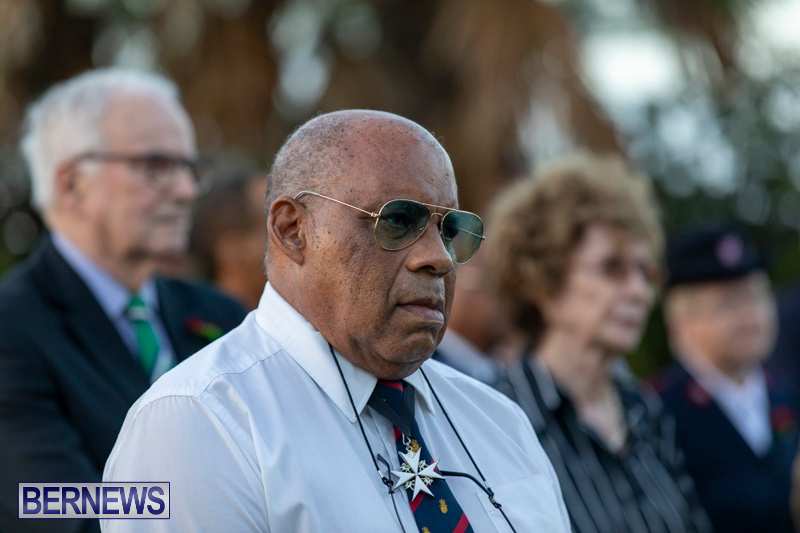 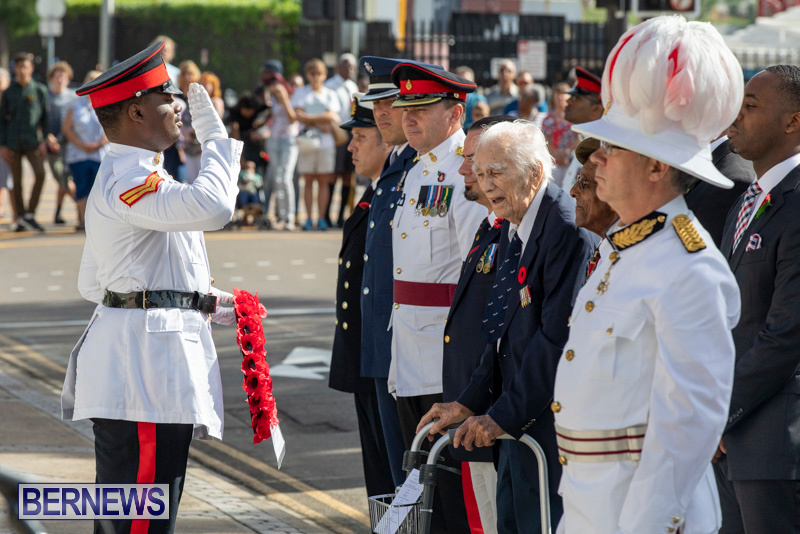 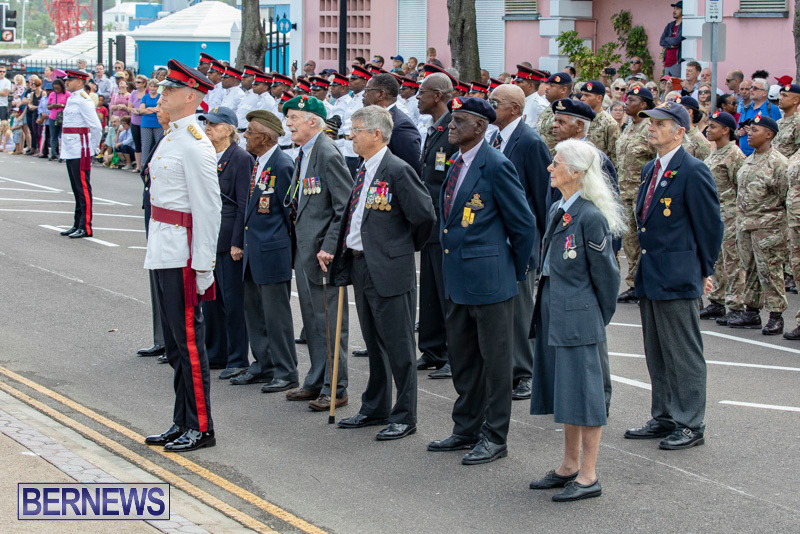 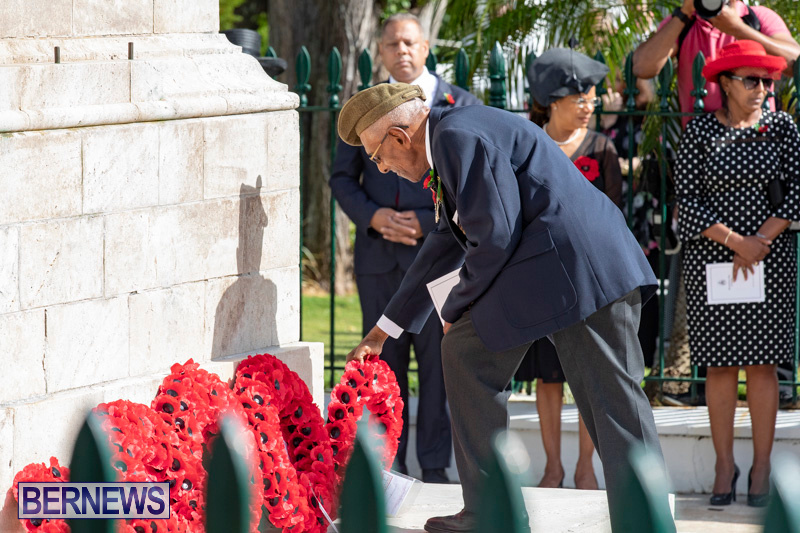 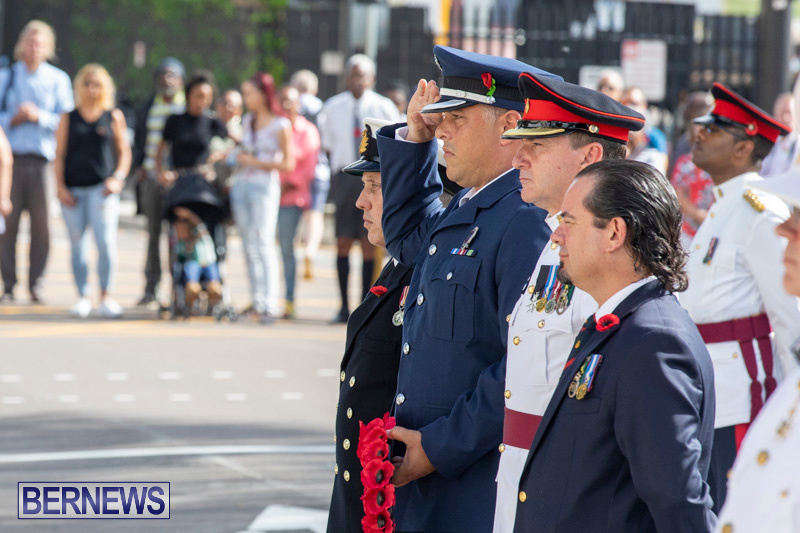 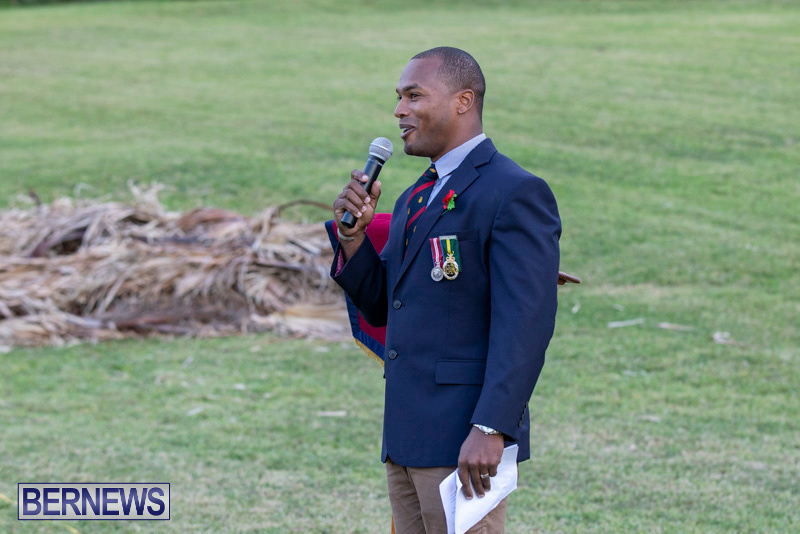 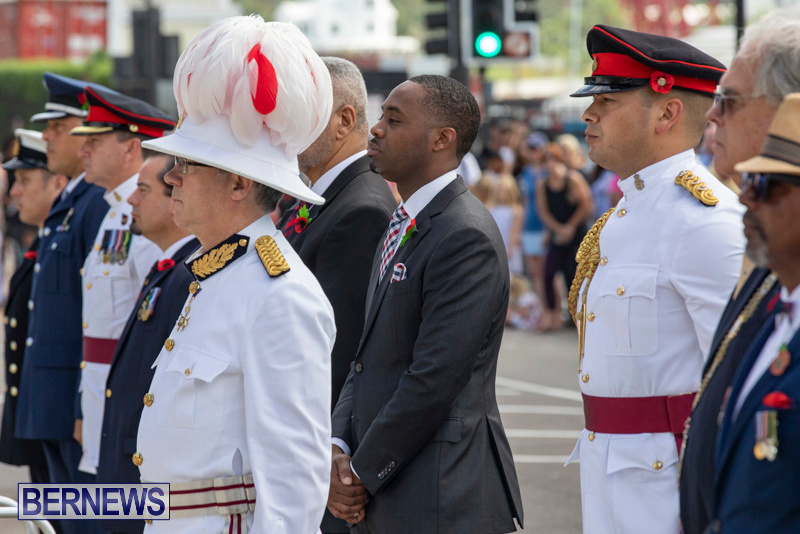 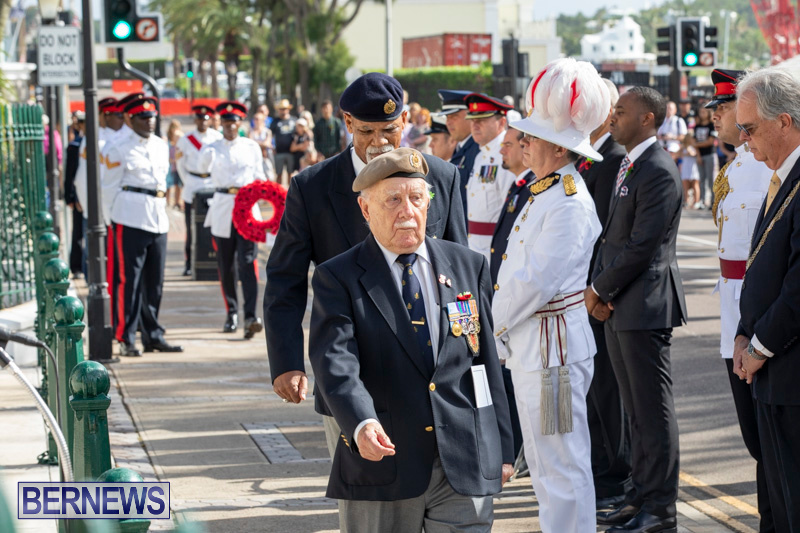 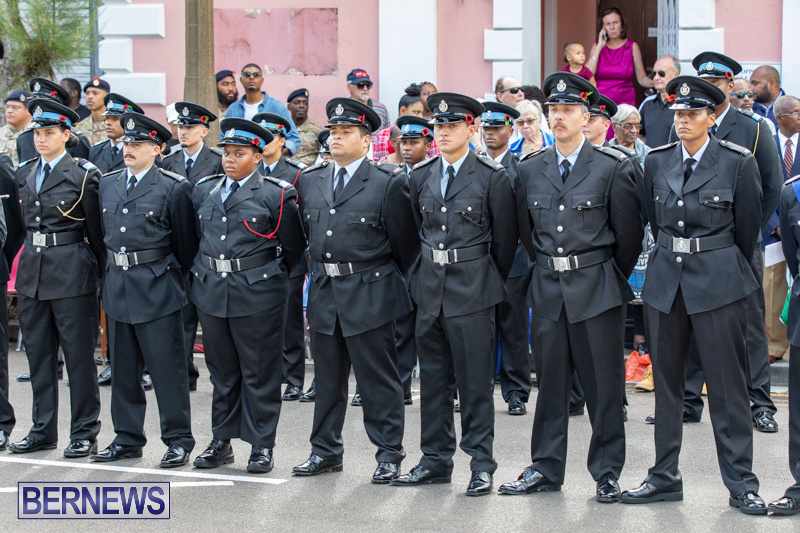 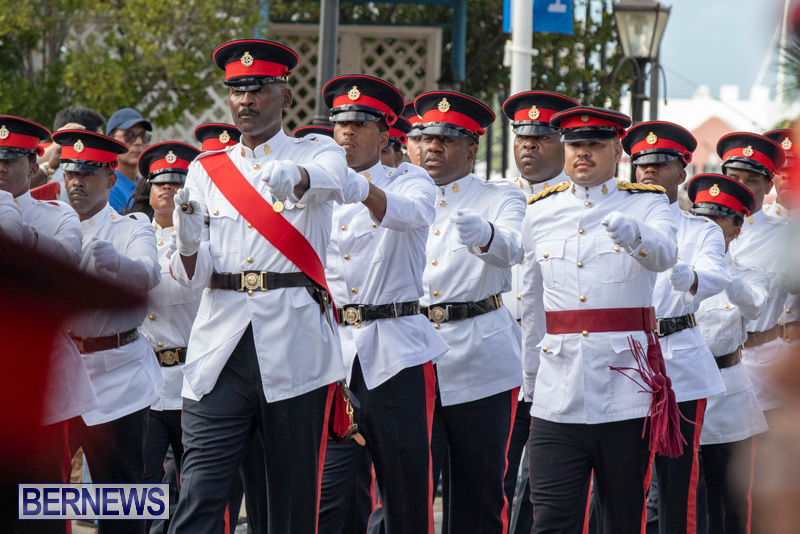 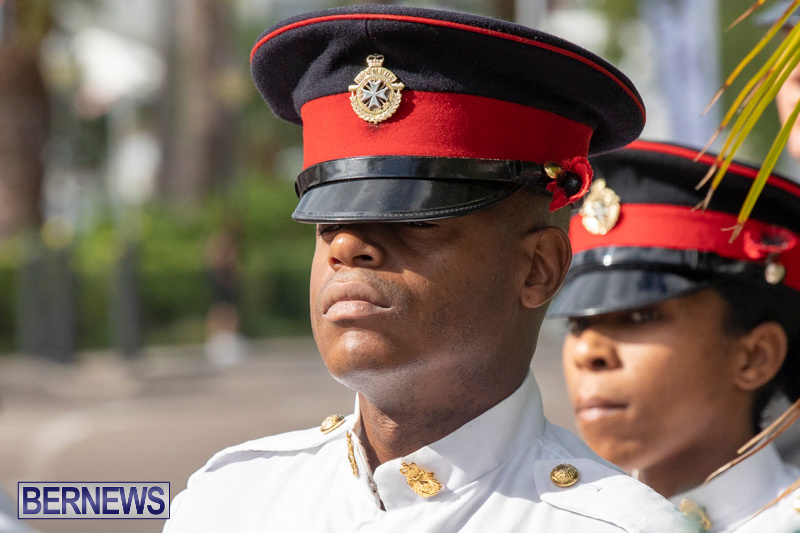 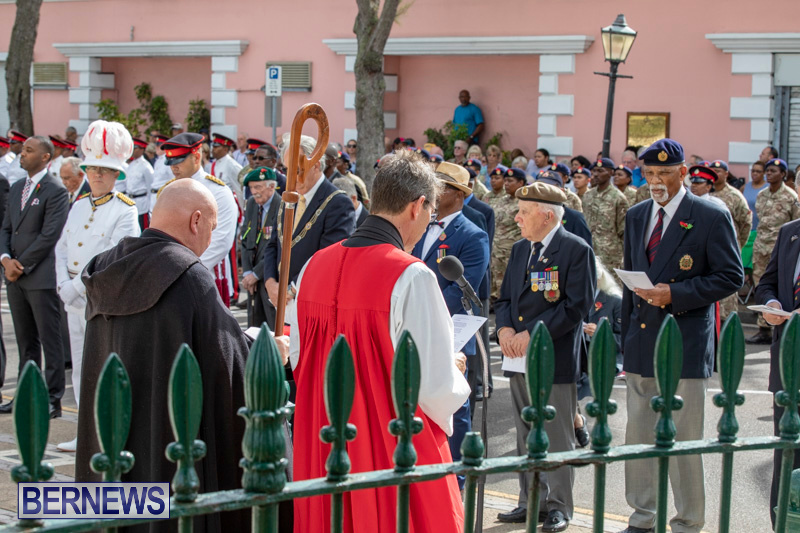 Veterans of other conflicts lined up alongside soldiers from the Royal Bermuda Regiment and other uniformed services to commemorate the Armistice, which came into effect on 11am on November 11, 1918, with two minutes’ silence. 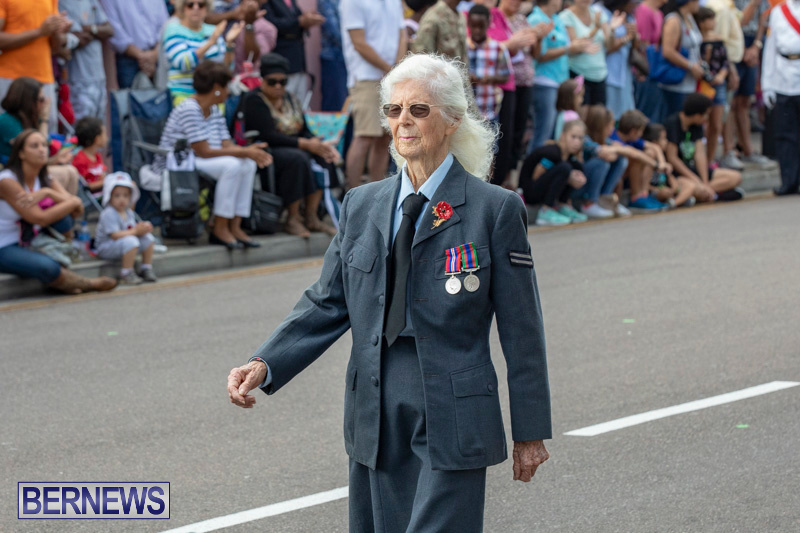 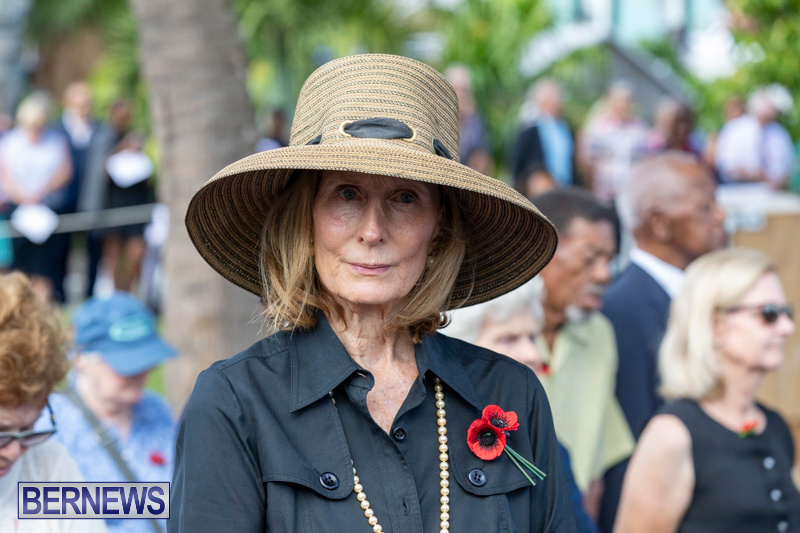 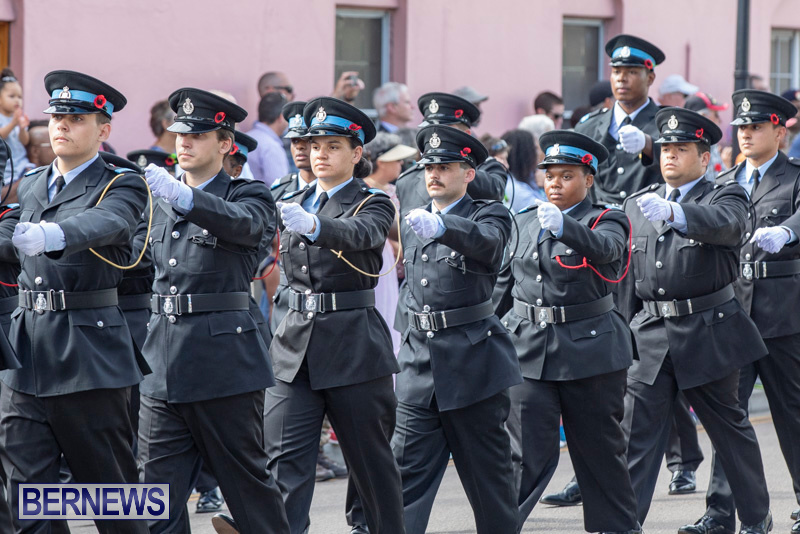 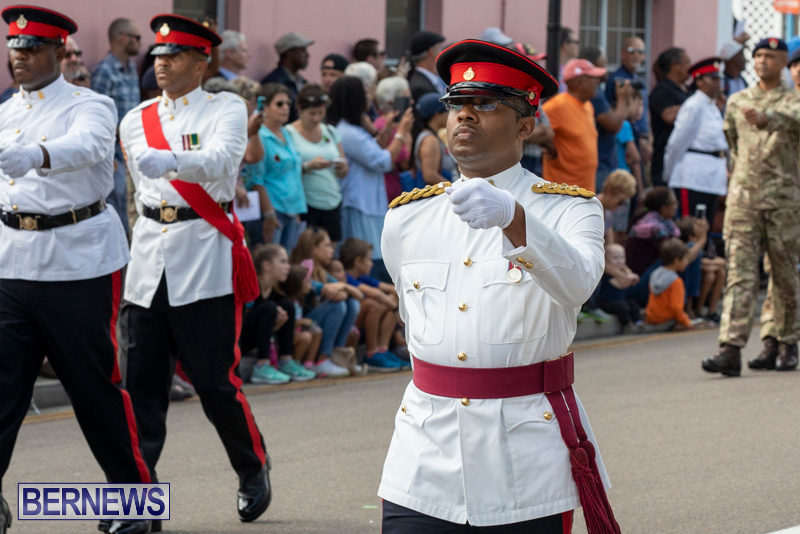 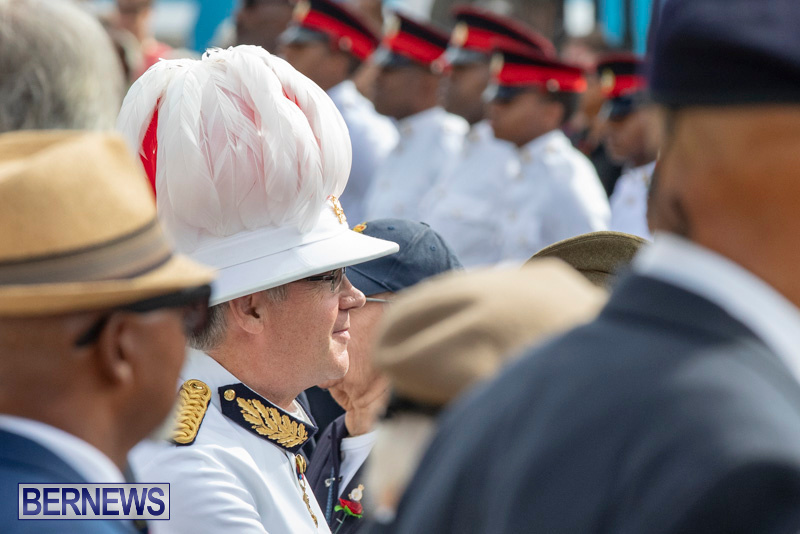 Canadian visitor Janet Jeffery, who attended the parade with husband Nick, said Bermuda had put on a parade to be proud of. 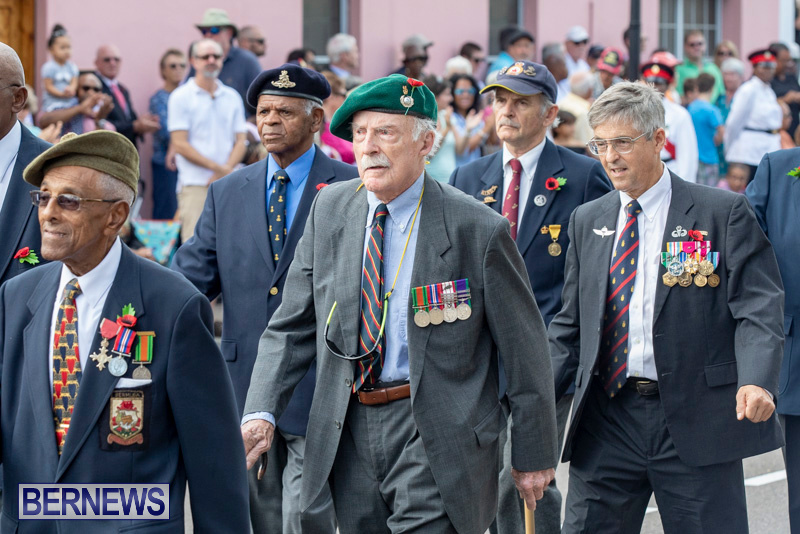 Veterans of the services and other conflicts lined up alongside their modern counterparts for the parade and wreath-laying ceremony at the Cenotaph on Front Street. 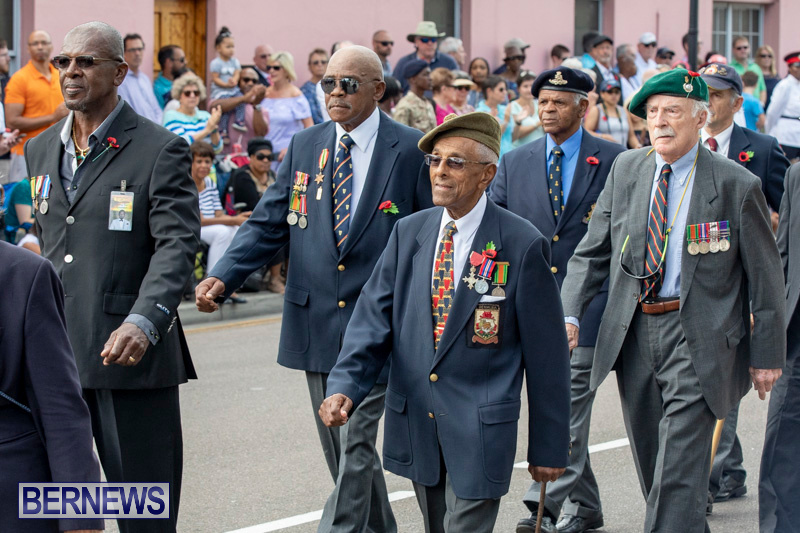 And the former warriors got the biggest round of applause as they marched off from outside Cabinet Office at the end of the commemoration. 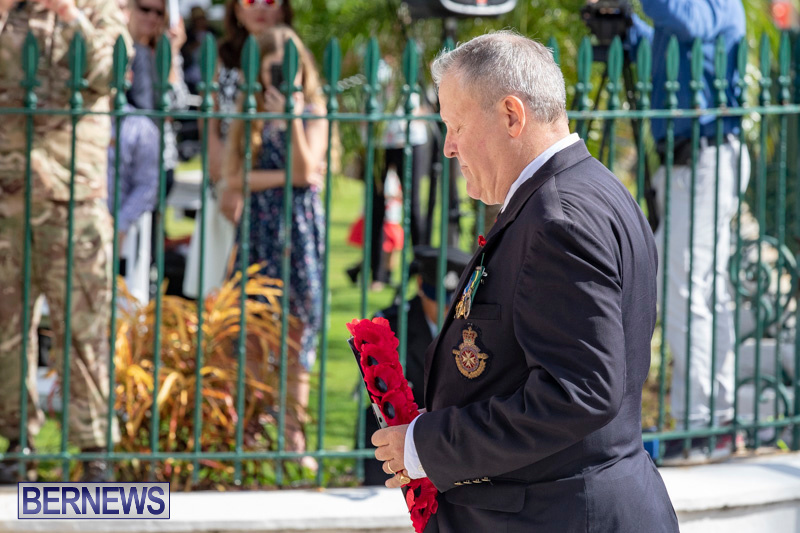 But not all the RBR soldiers were on parade – its chefs had put in two days of hard work to prepare a lunch to honour Bermuda’s former military at No. 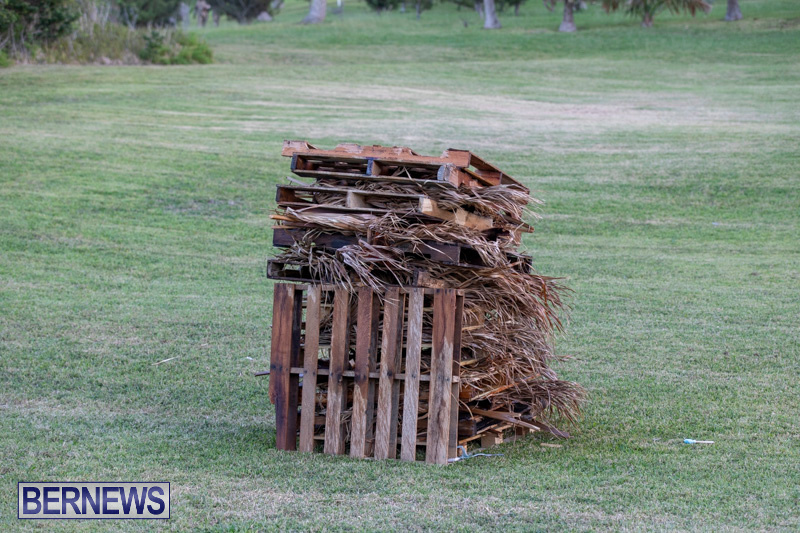 6 Shed. 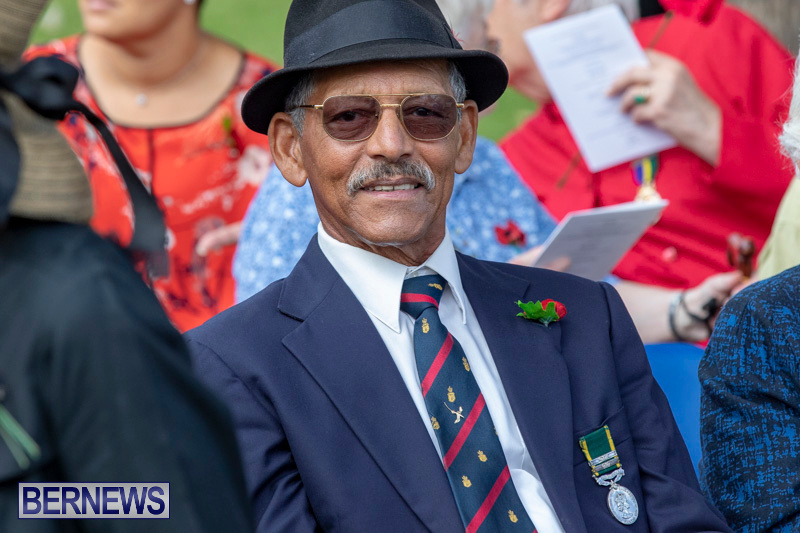 Sergeant John Lema, an eight-year veteran of the RBR and also a chef in civilian life, said his soldiers had started work at 5.30am to make sure the lunch went with military precision. 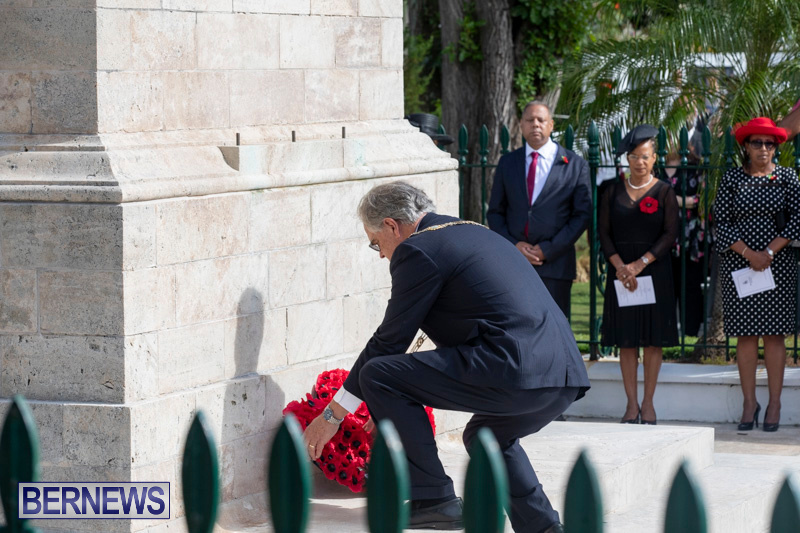 Governor John Rankin, who led the wreath-laying, said afterwards: “It was a very good service. 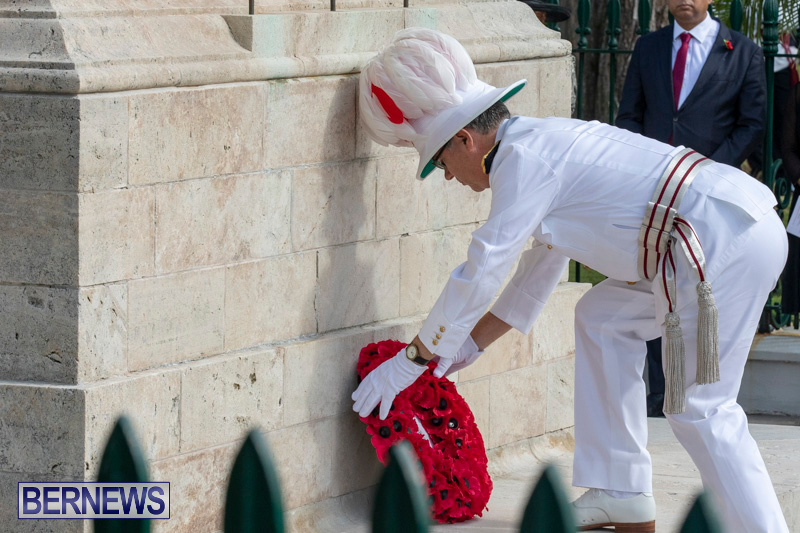 This year is a special one because it’s the 100th anniversary of the end of World War One. 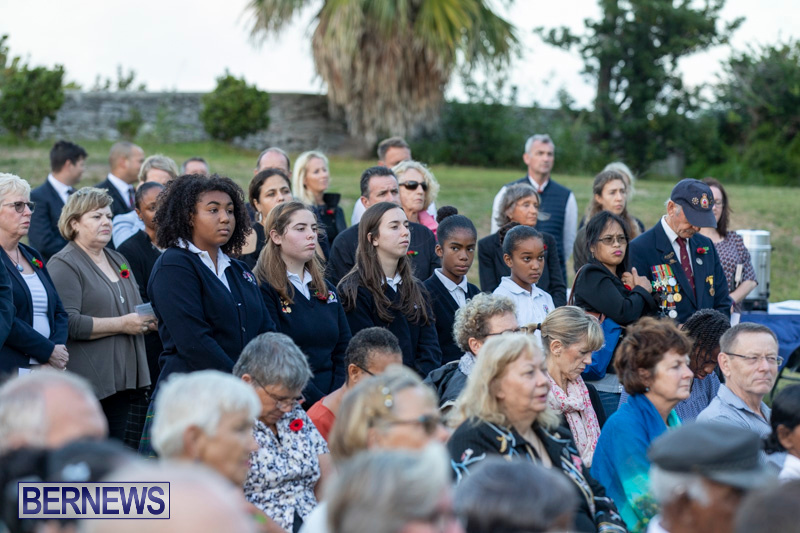 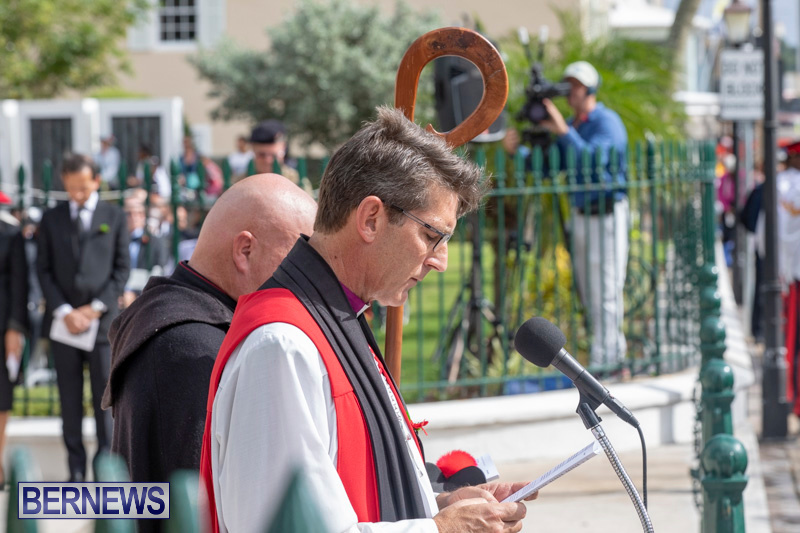 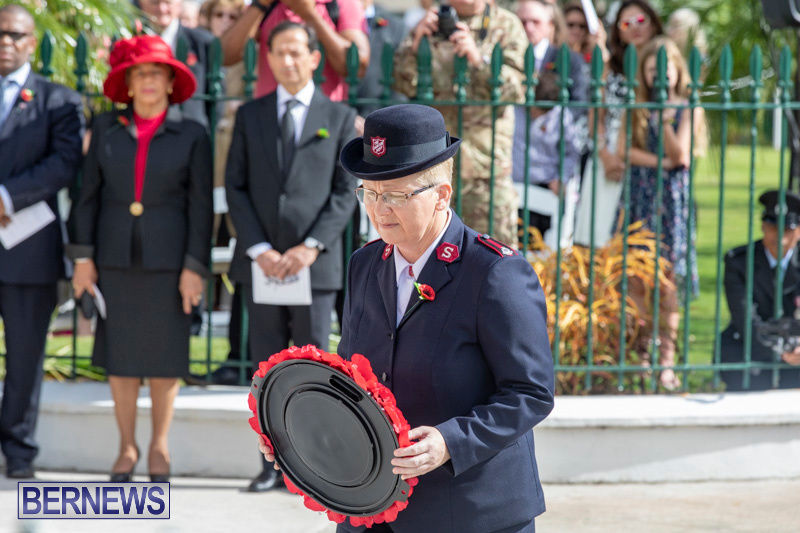 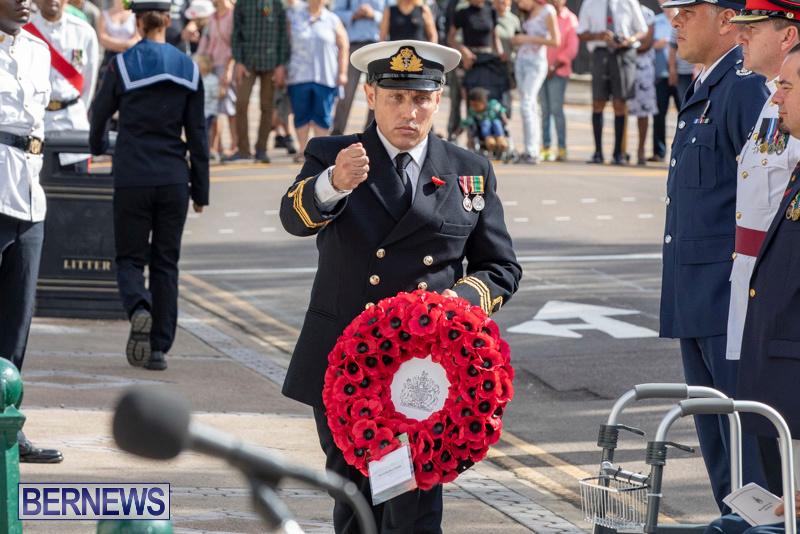 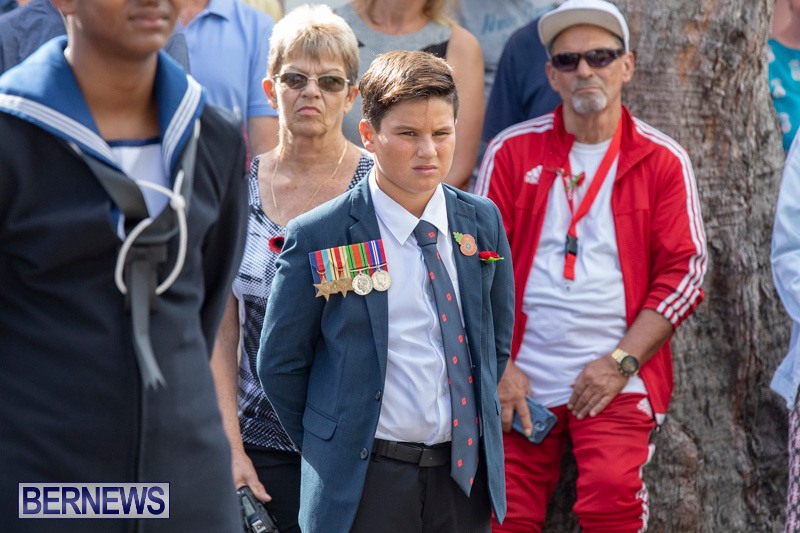 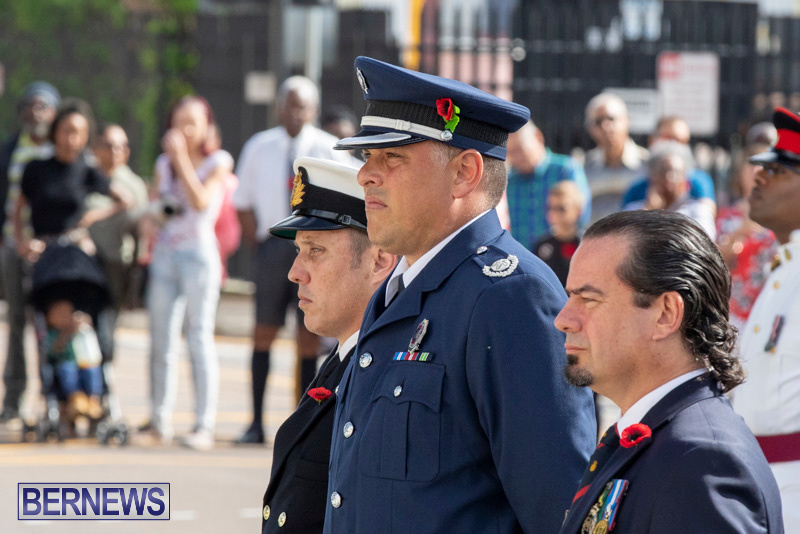 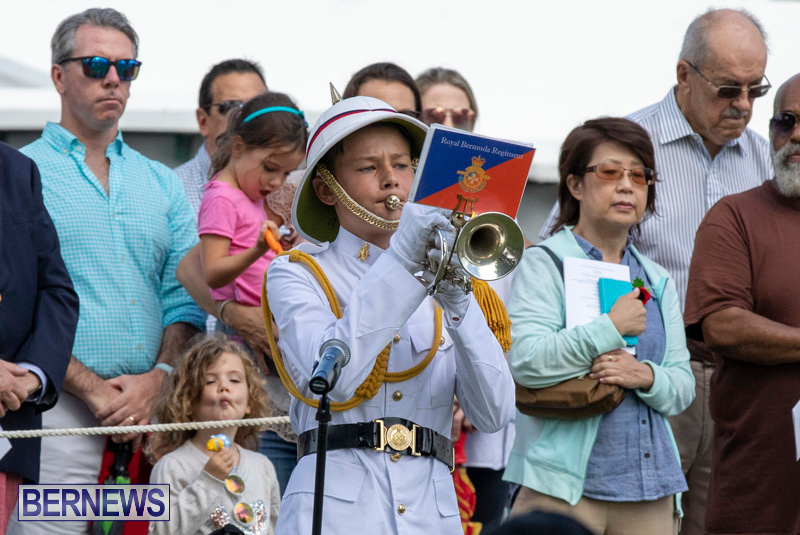 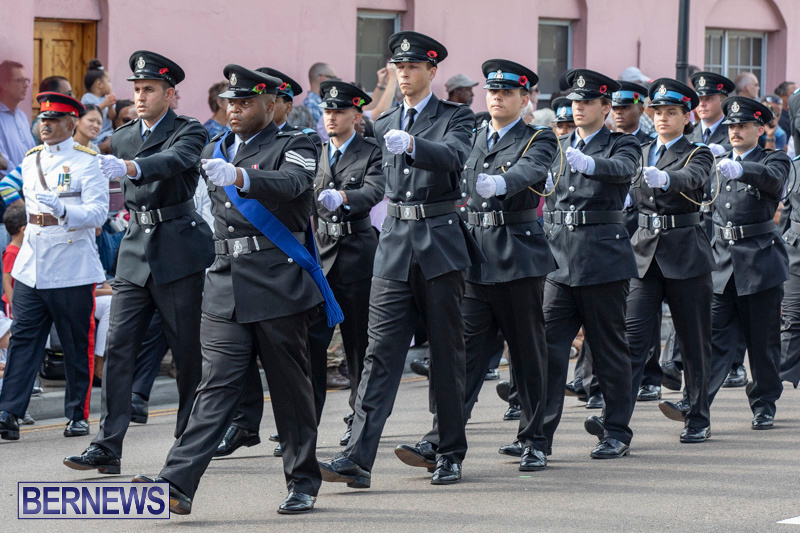 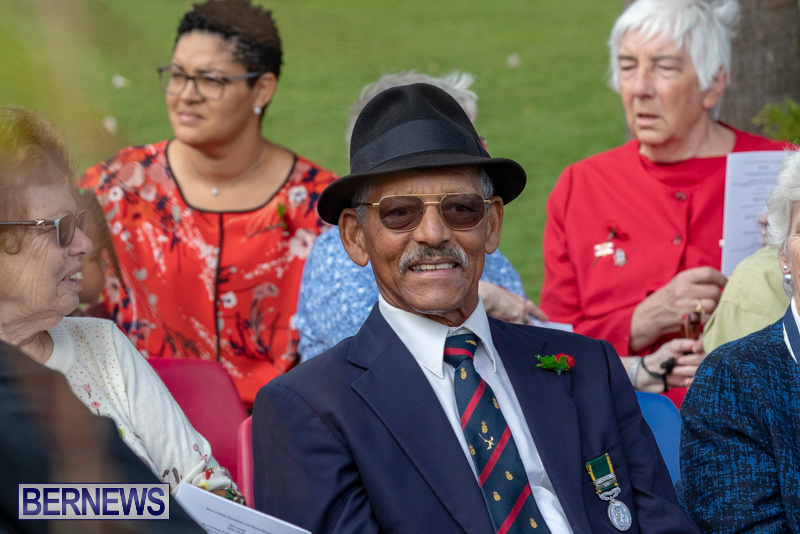 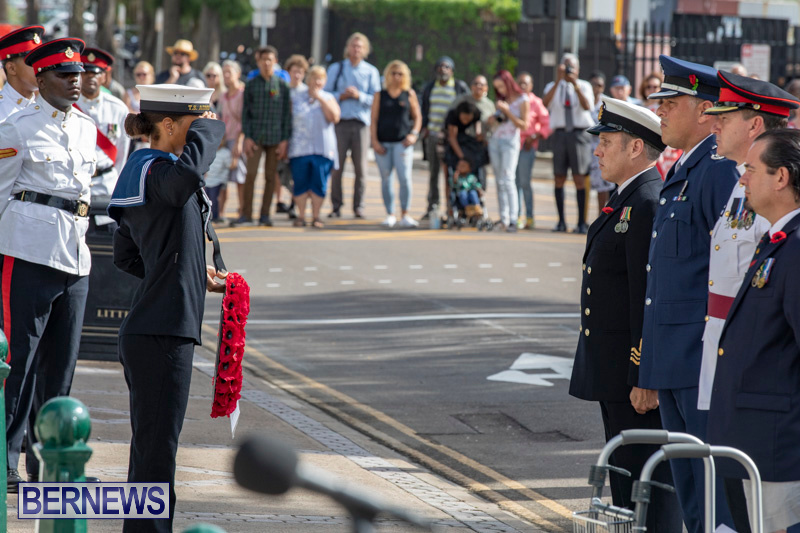 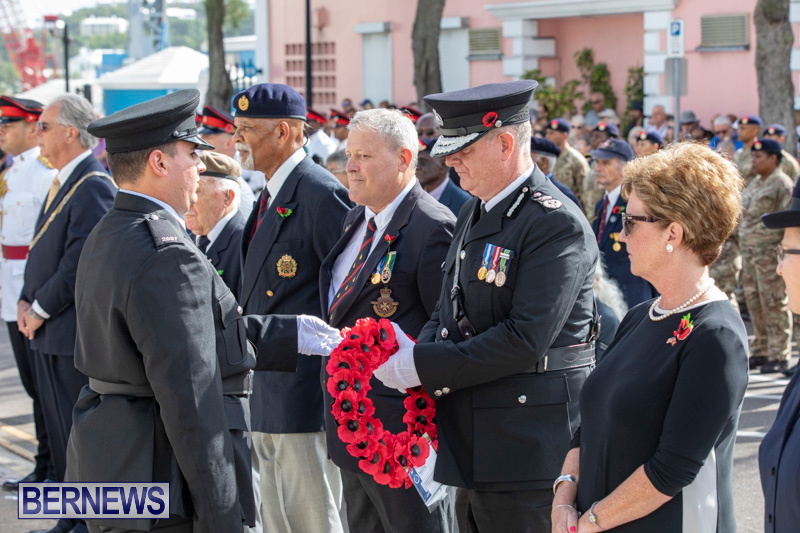 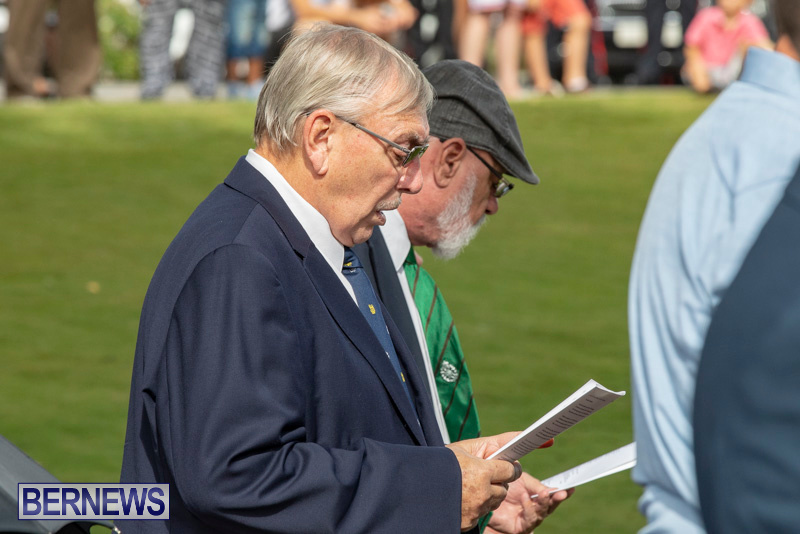 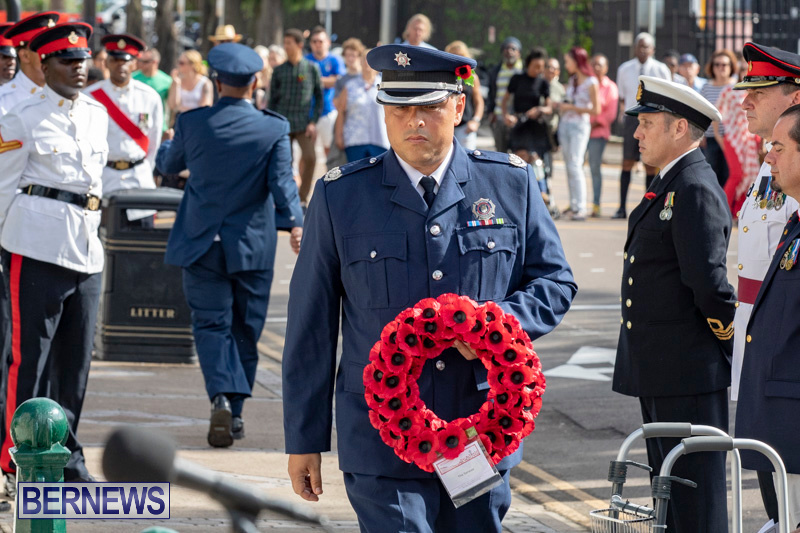 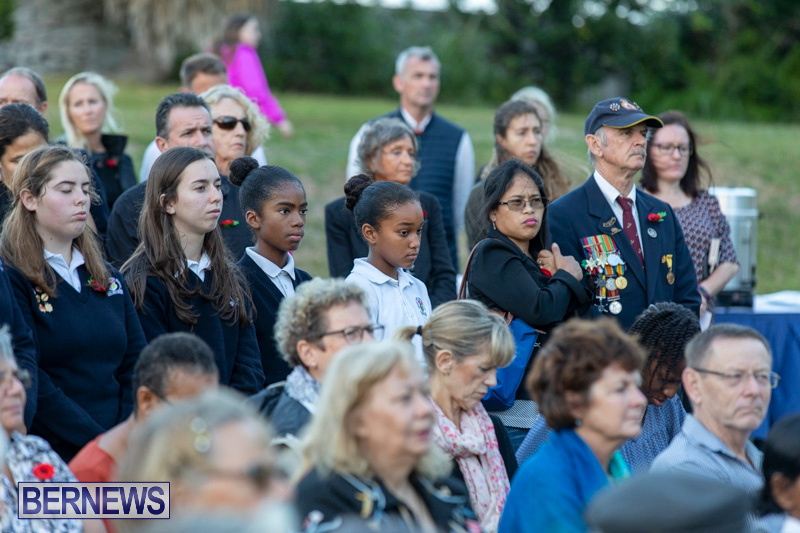 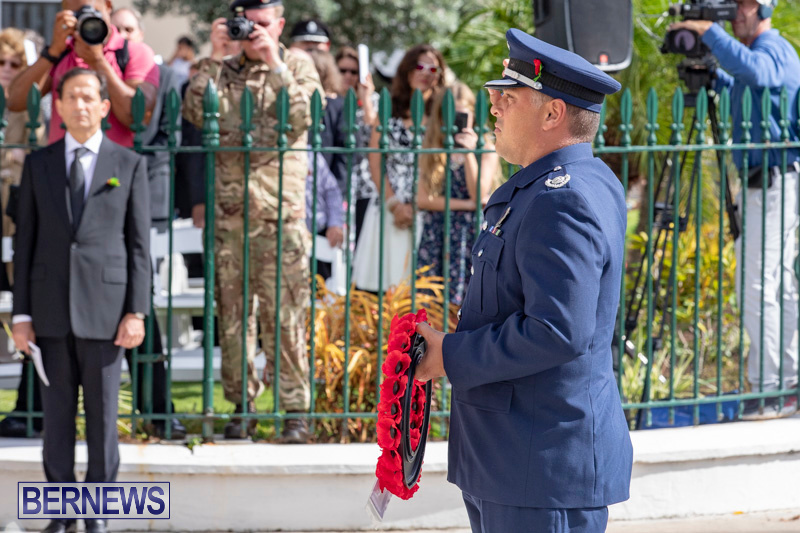 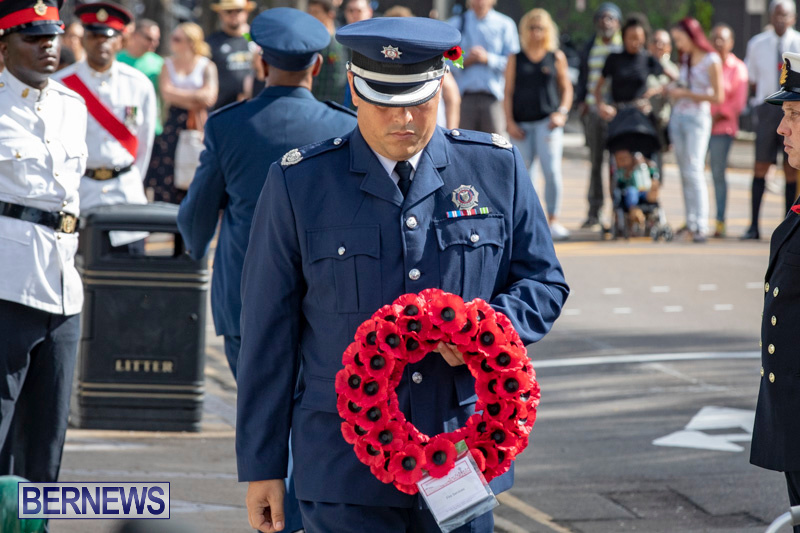 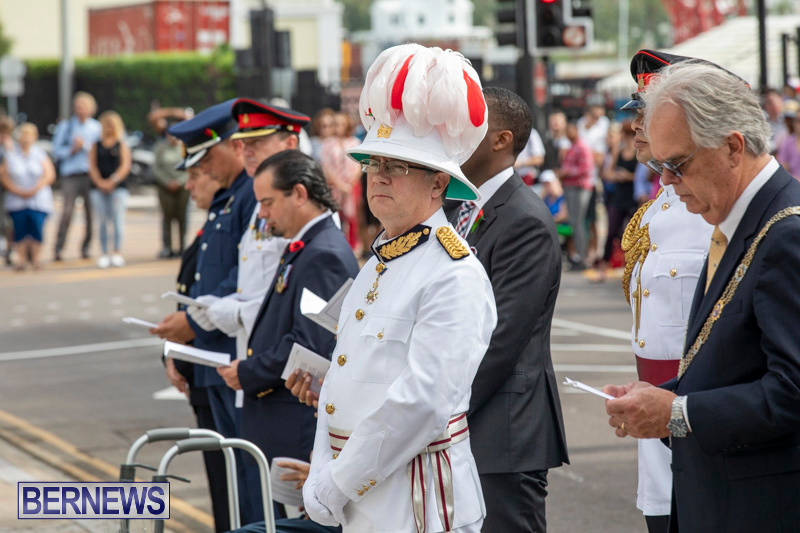 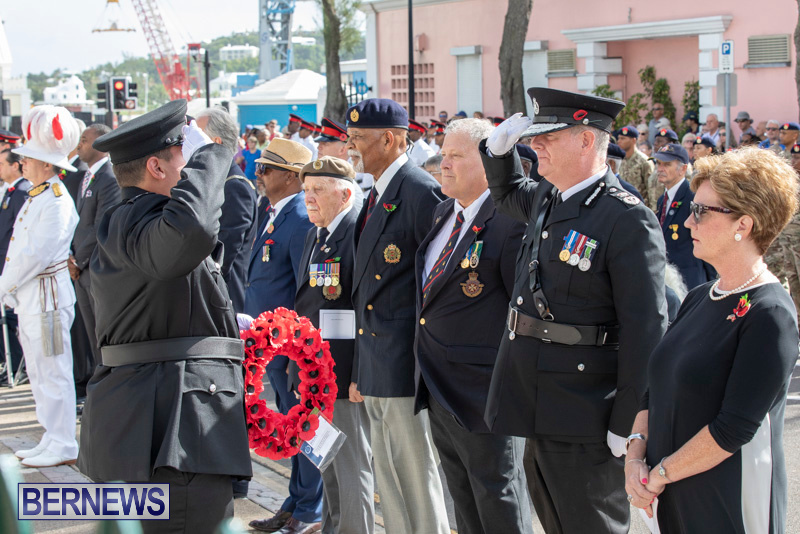 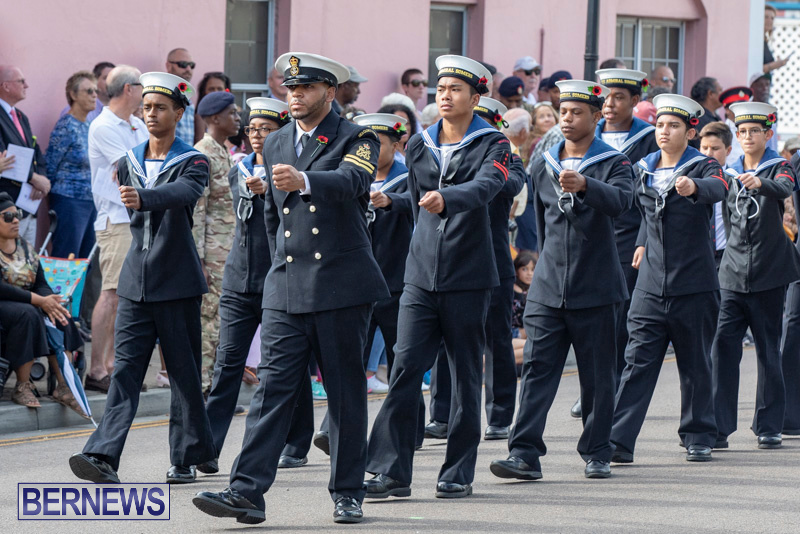 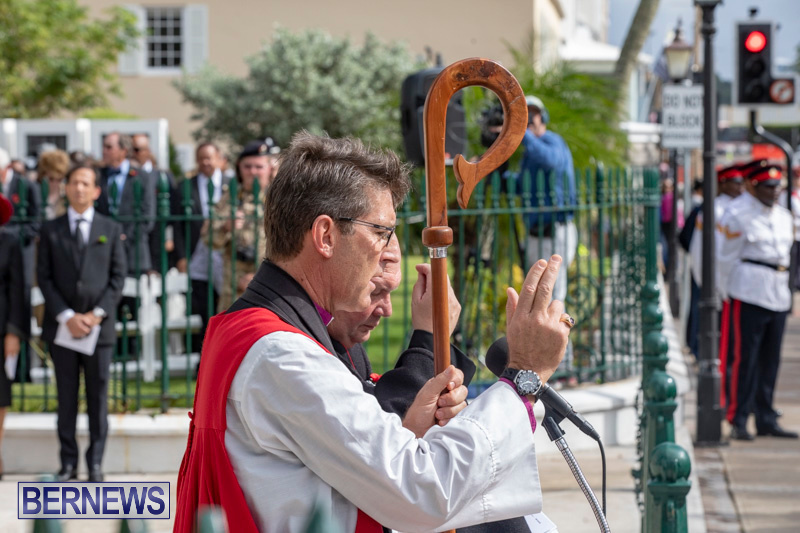 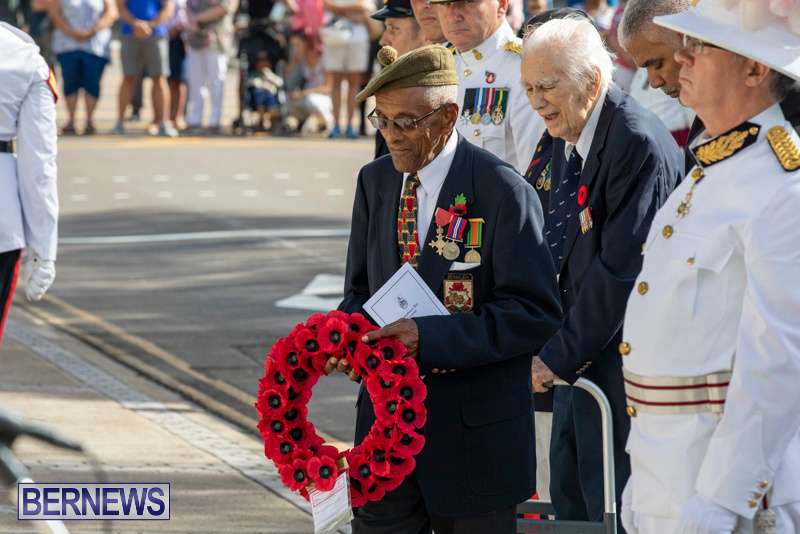 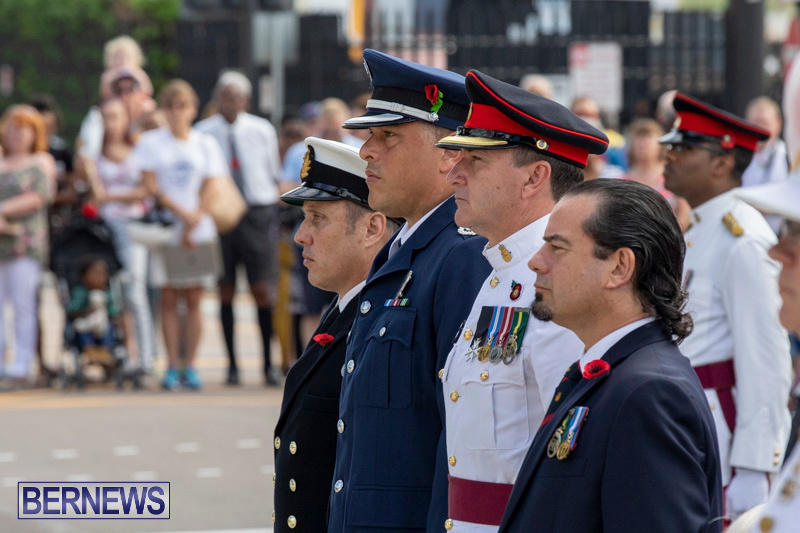 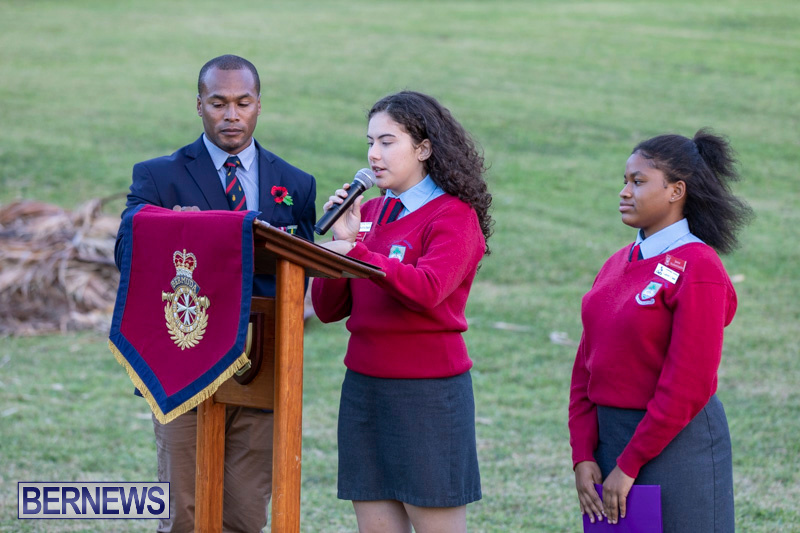 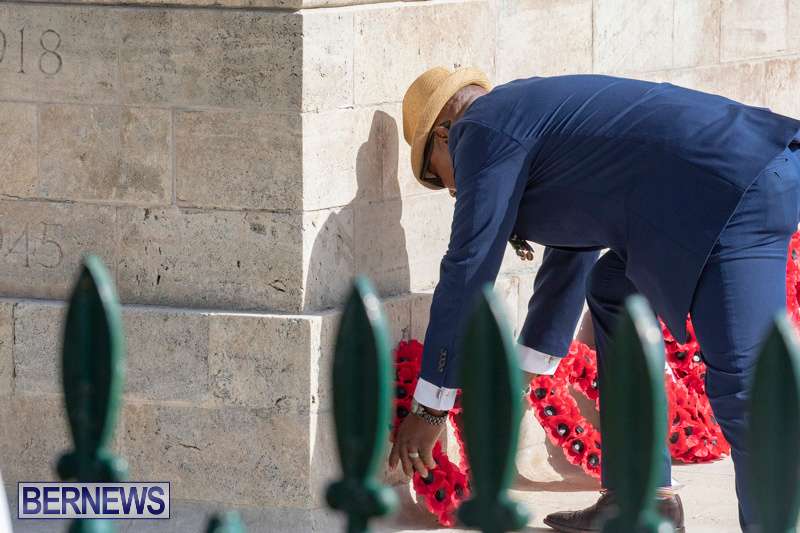 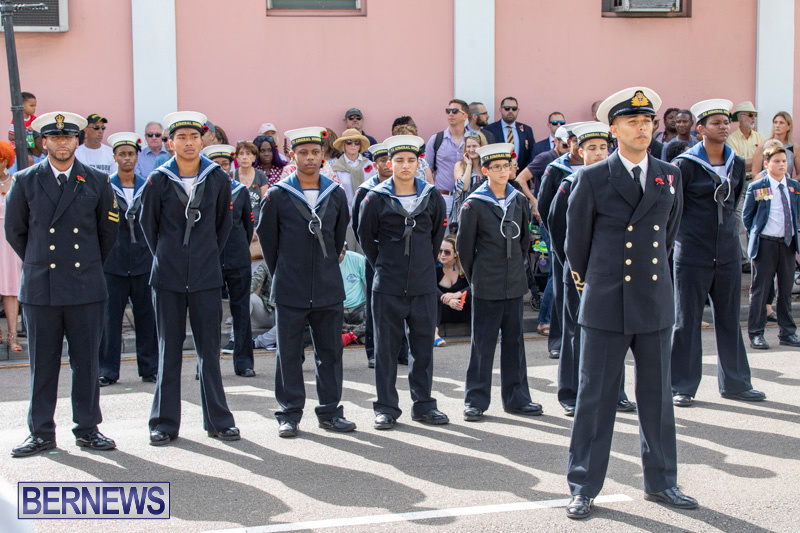 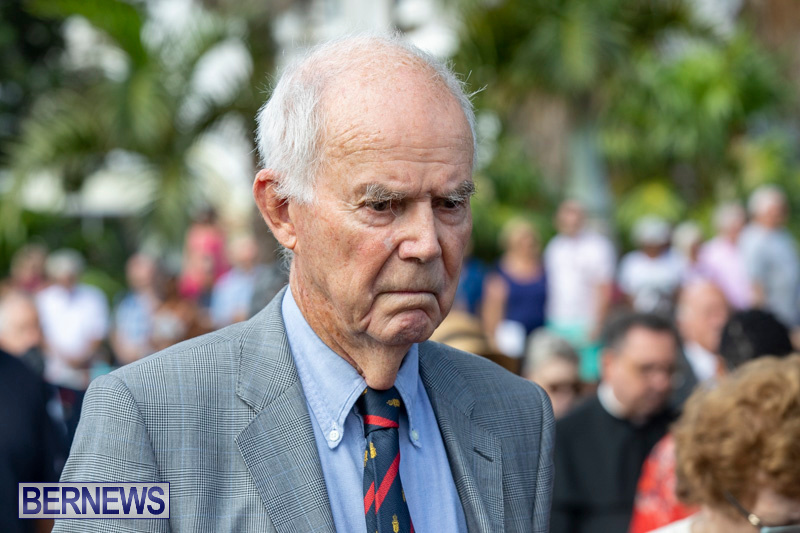 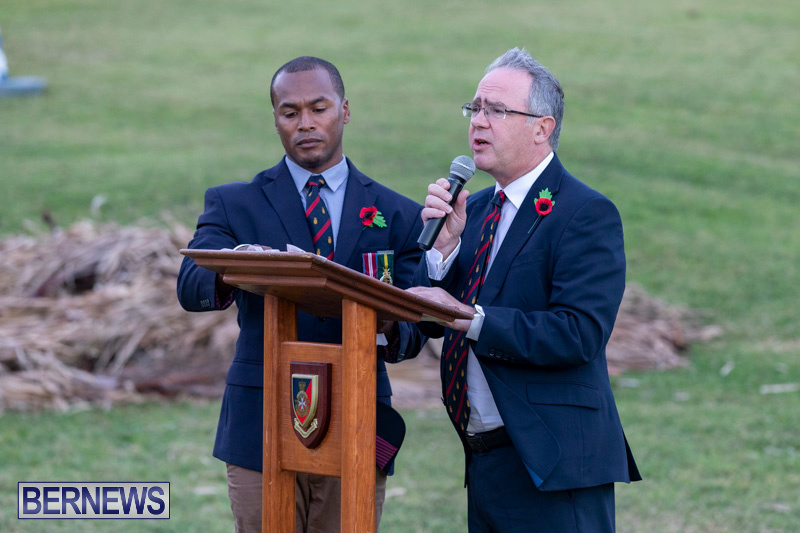 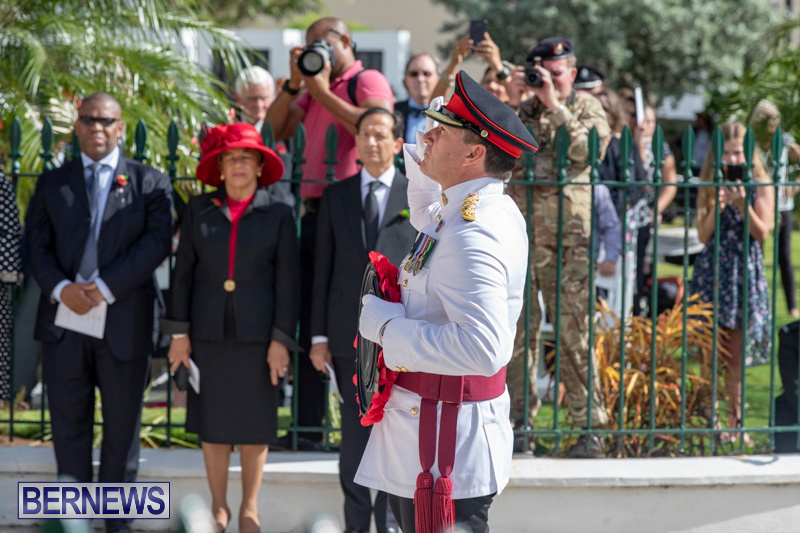 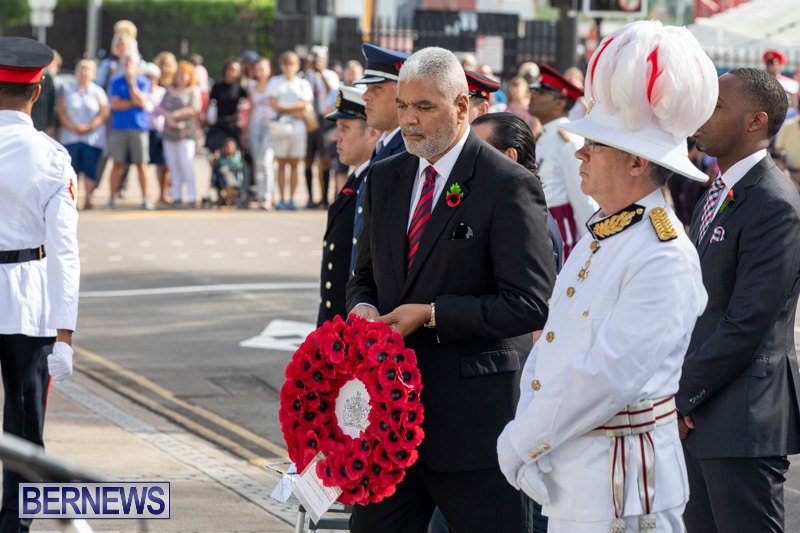 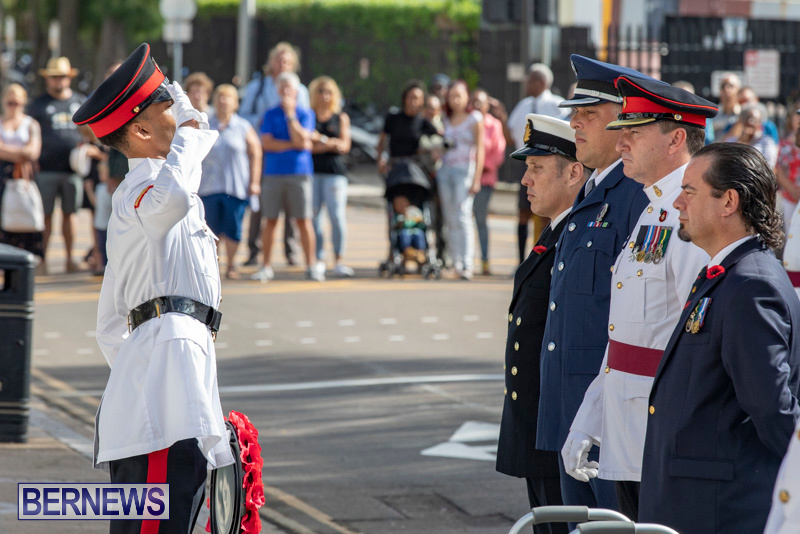 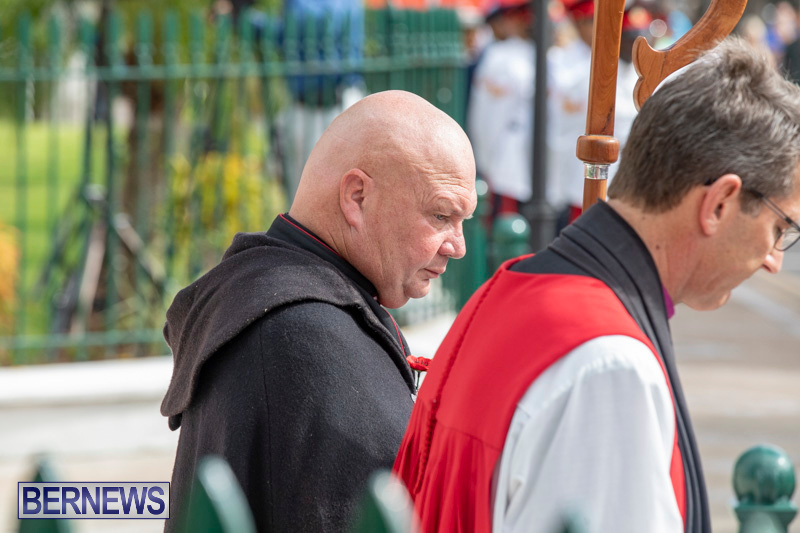 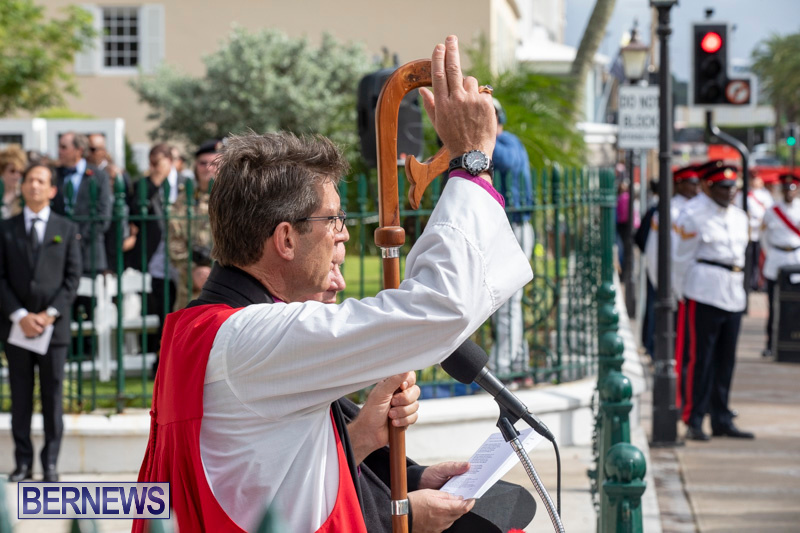 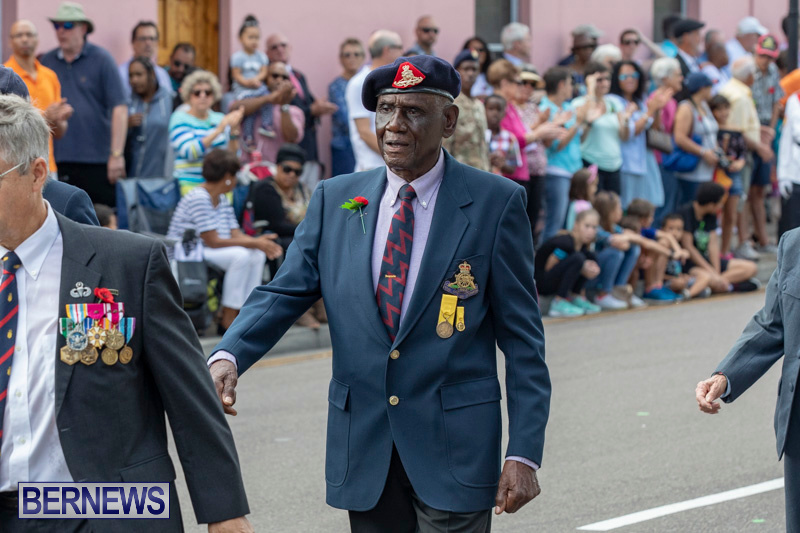 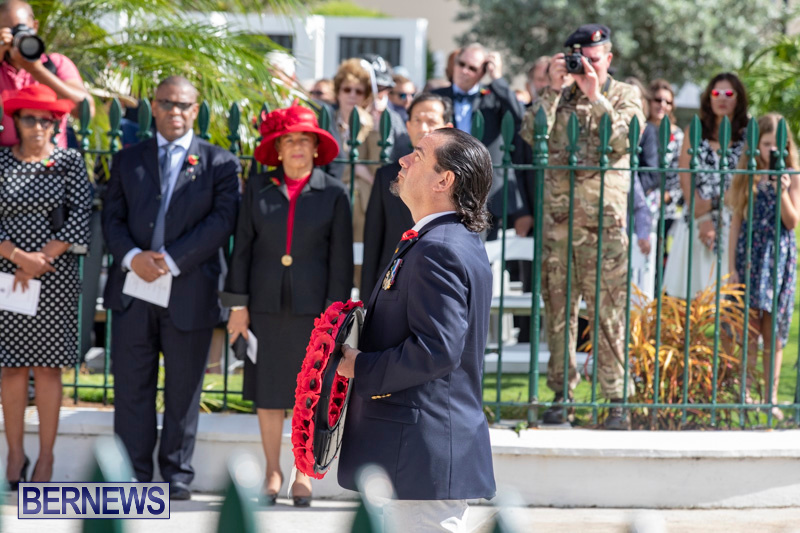 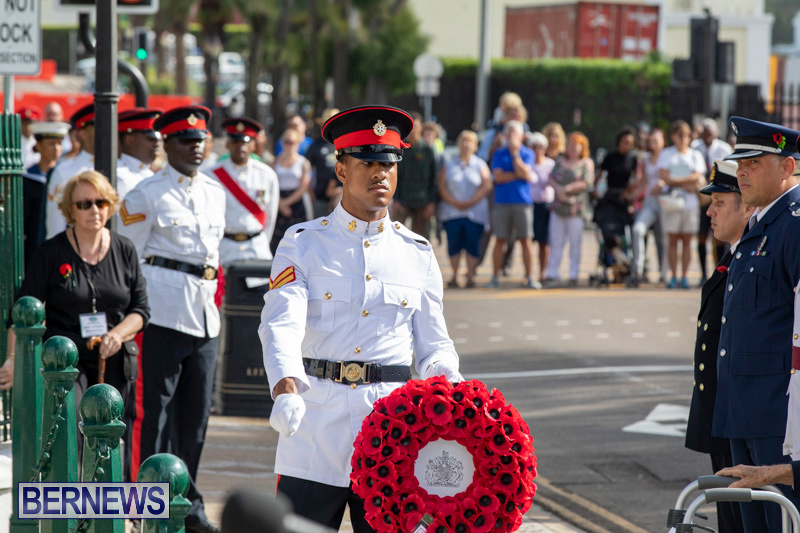 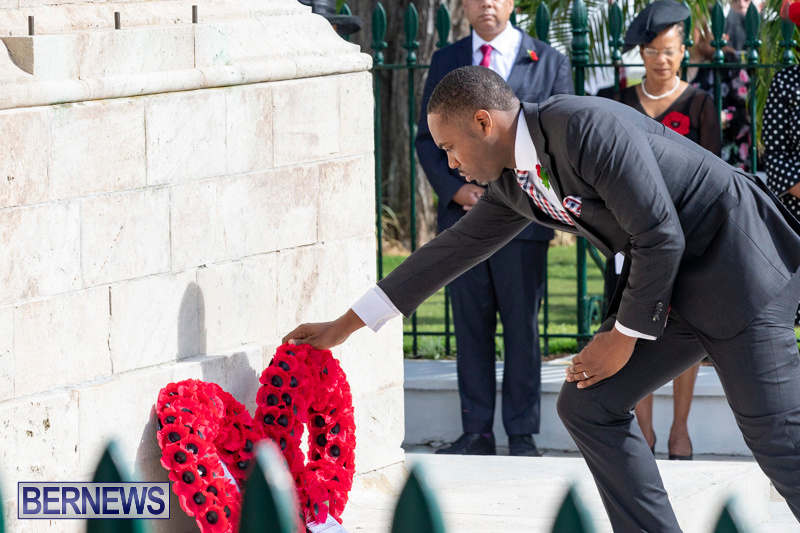 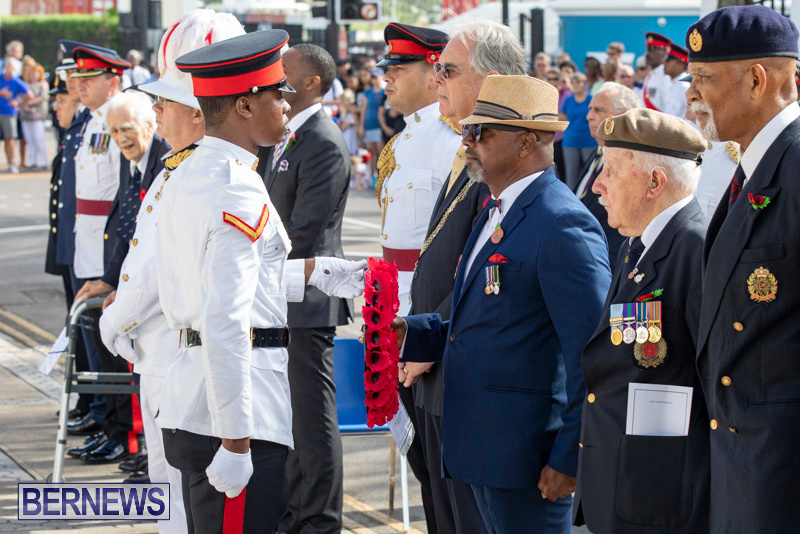 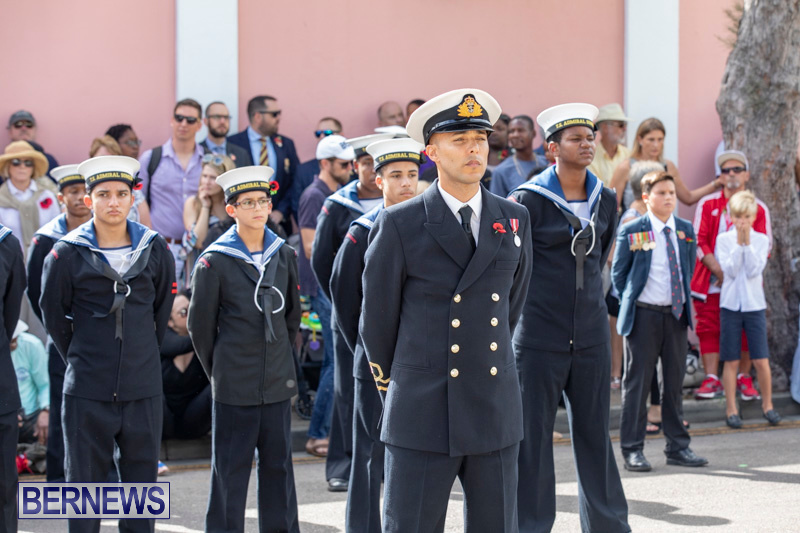 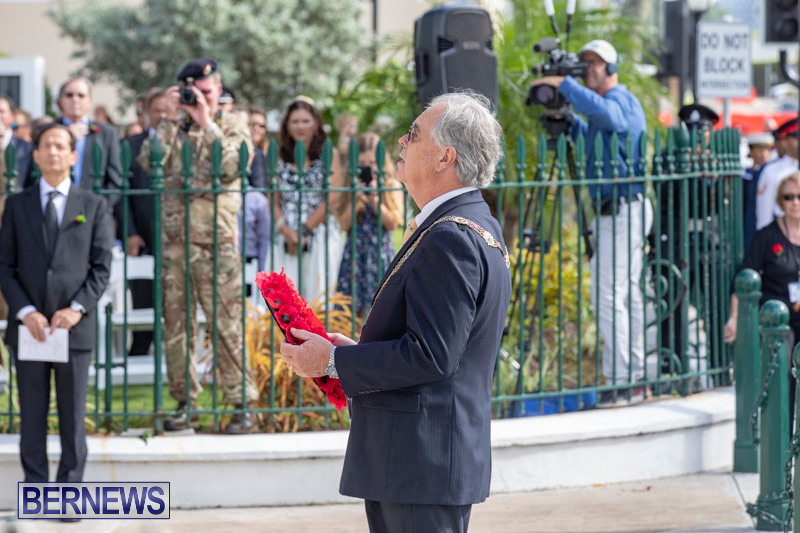 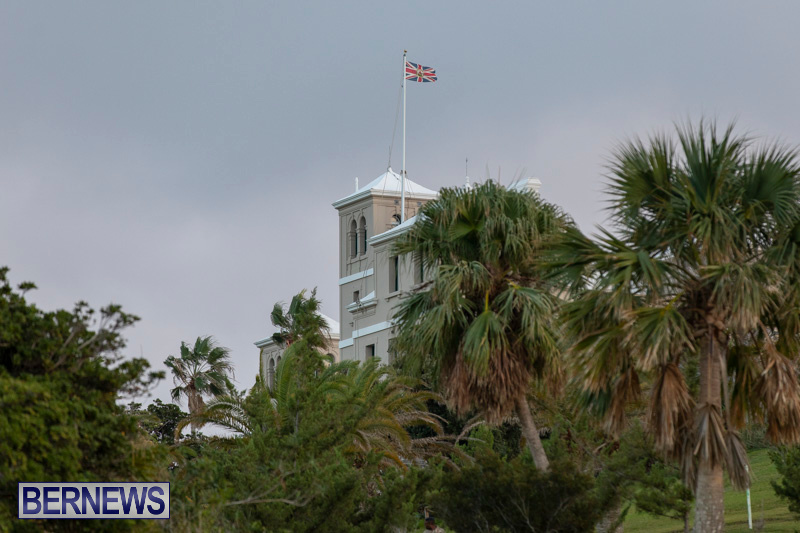 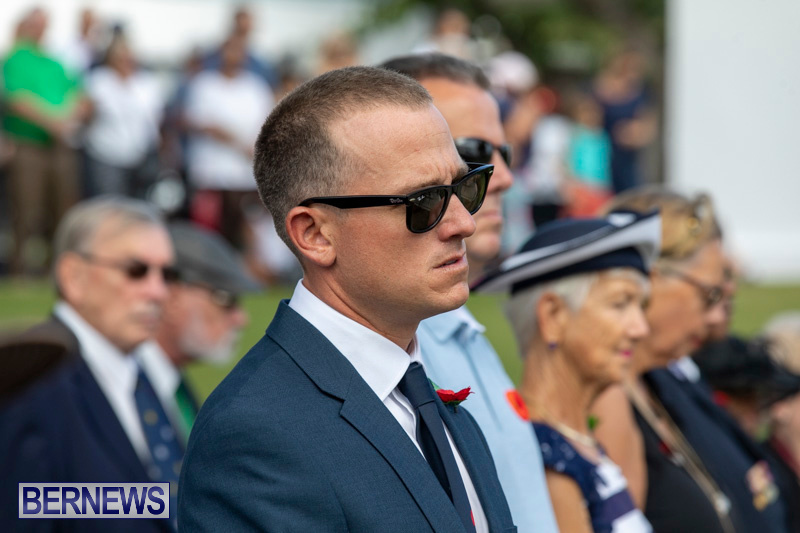 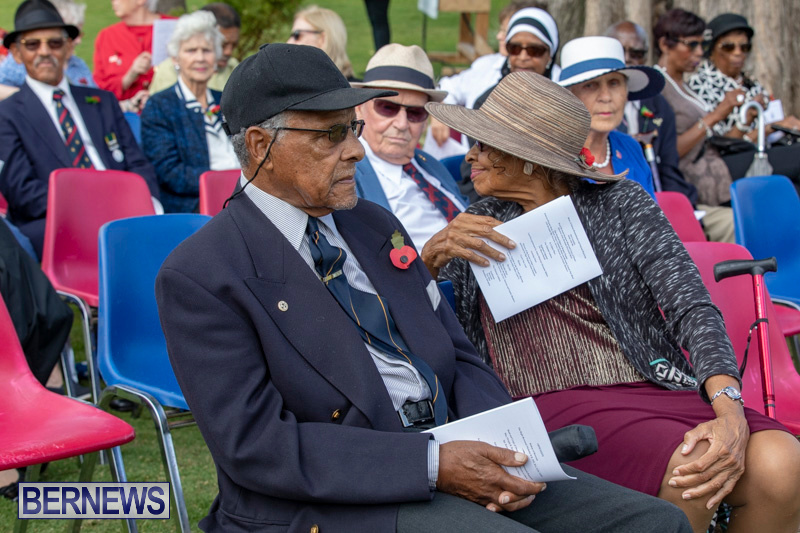 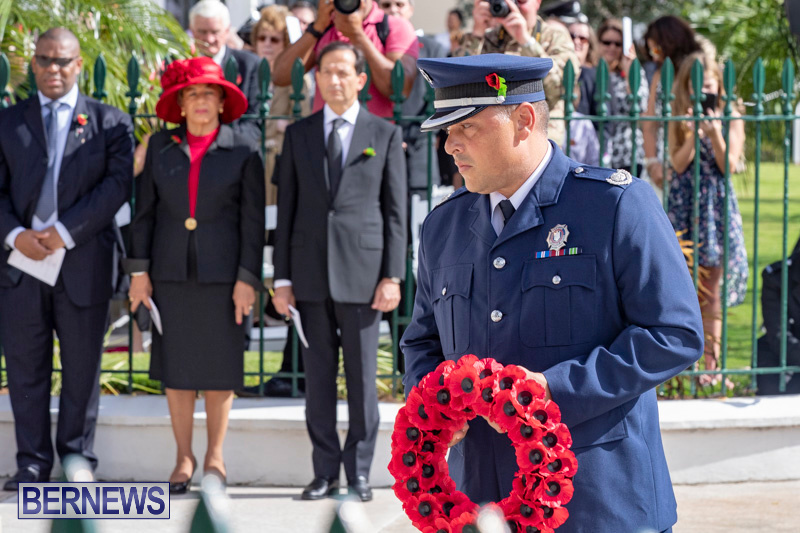 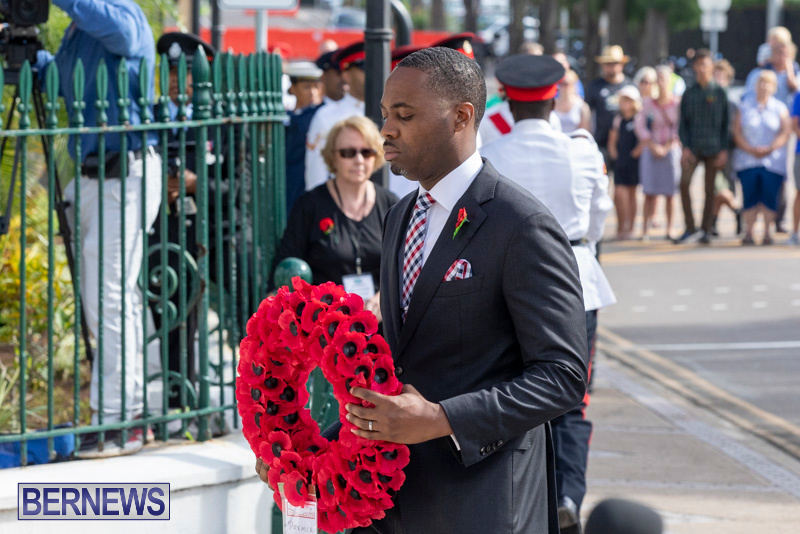 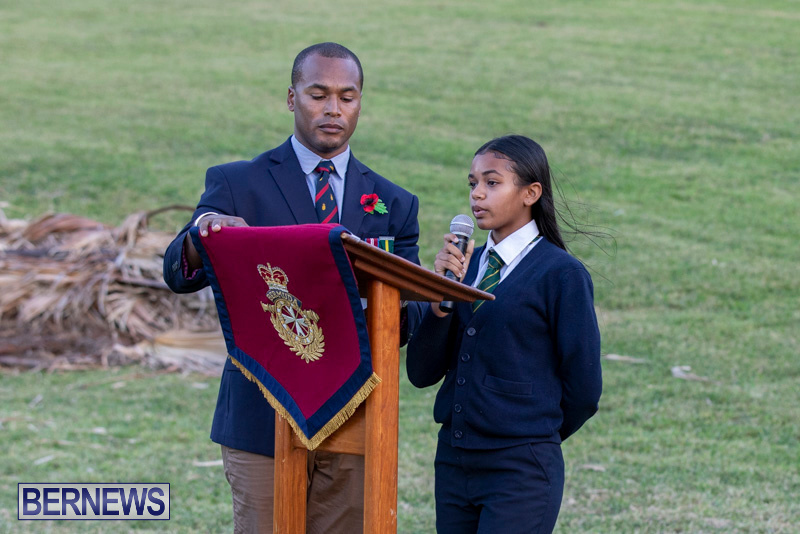 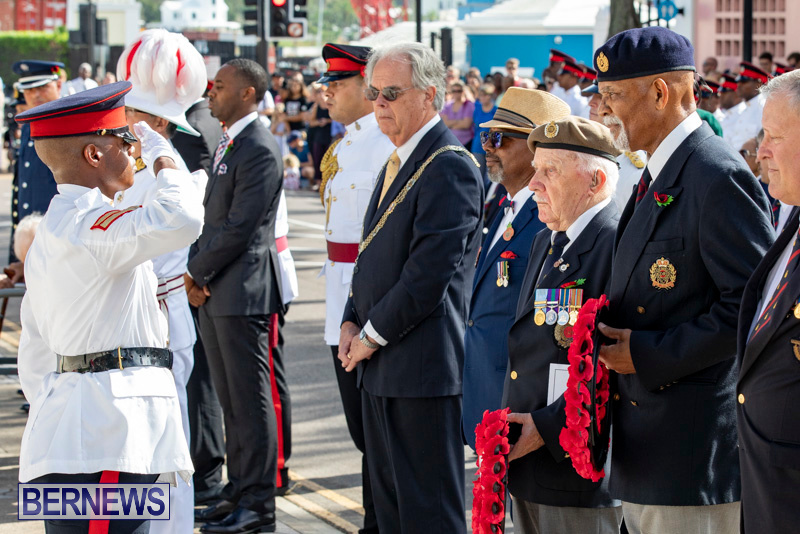 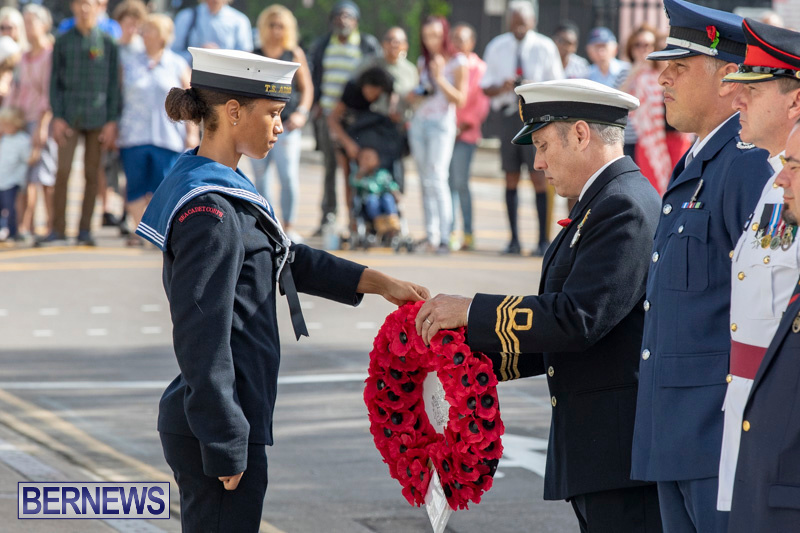 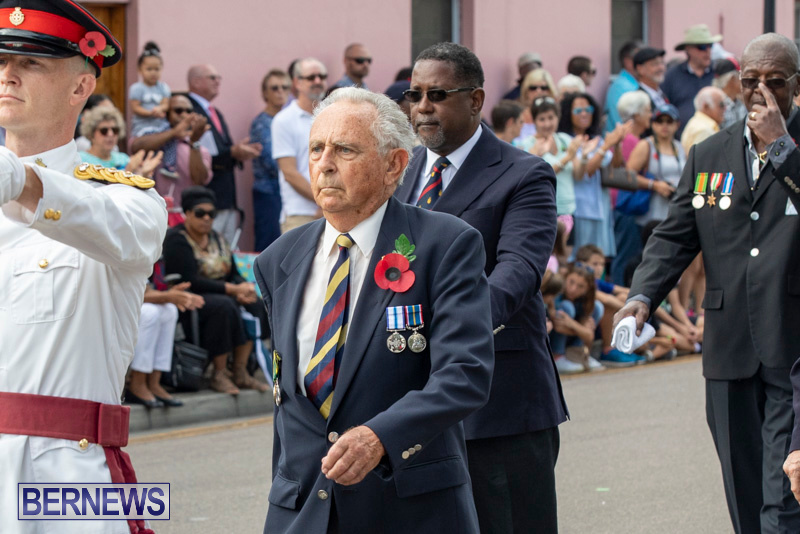 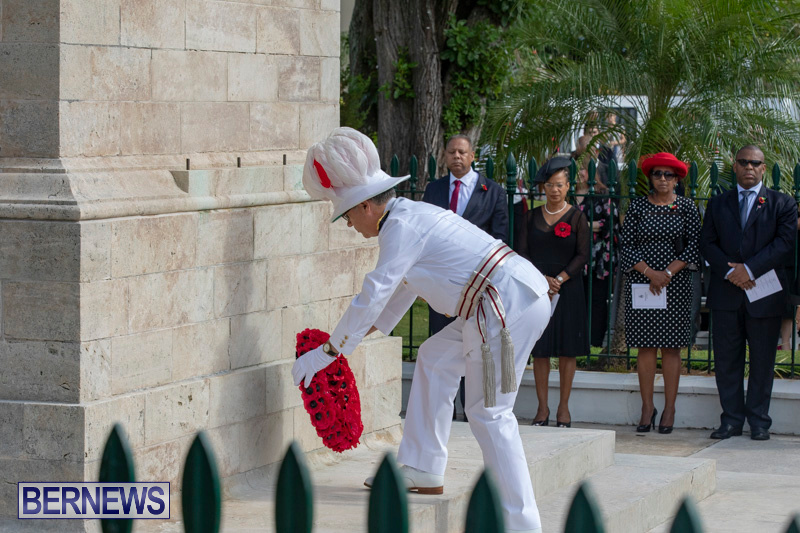 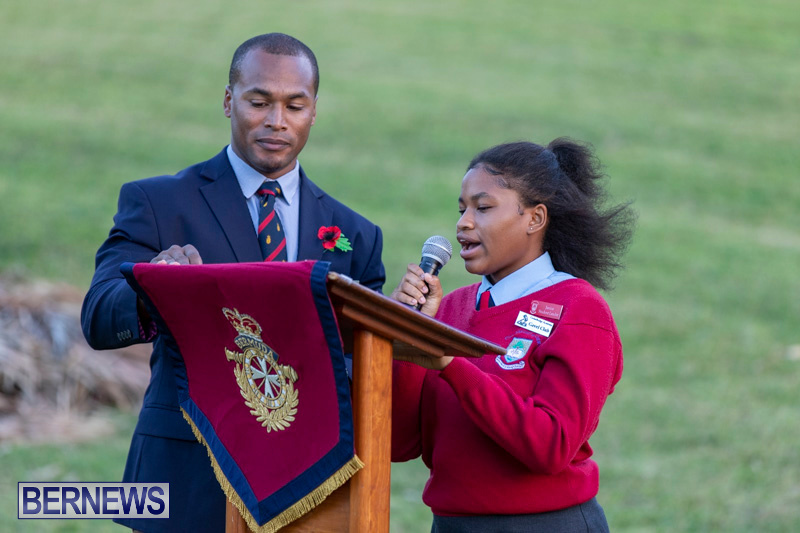 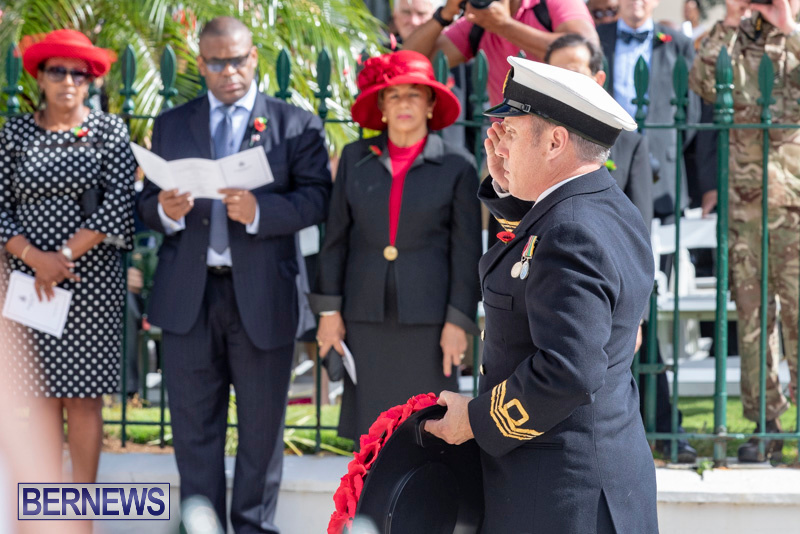 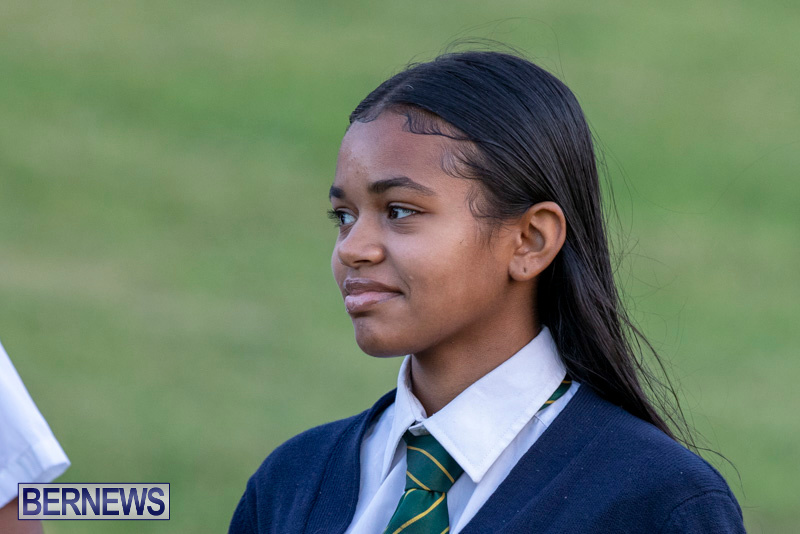 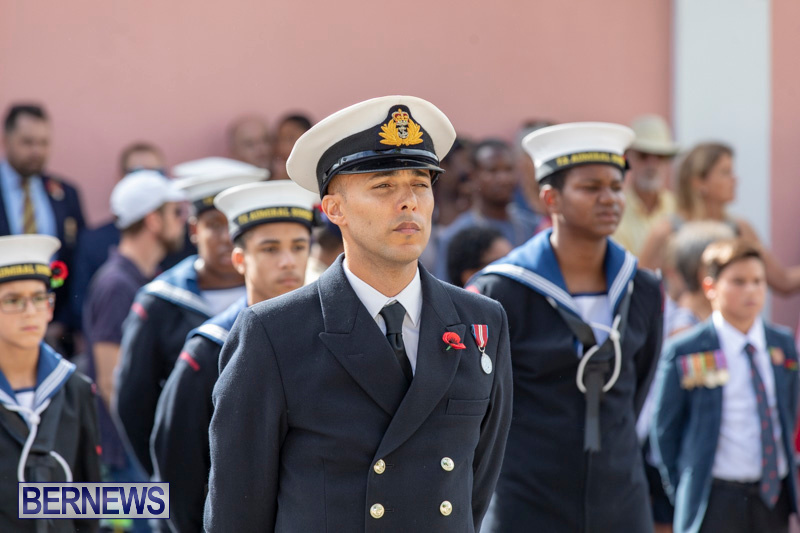 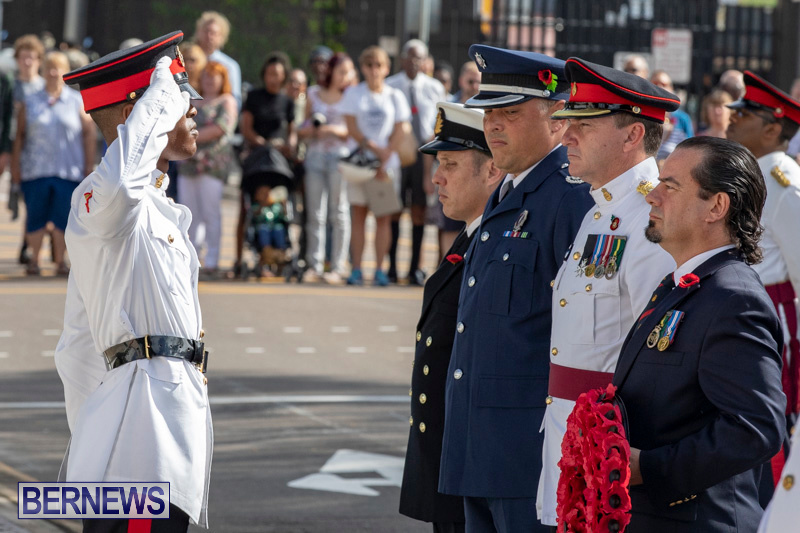 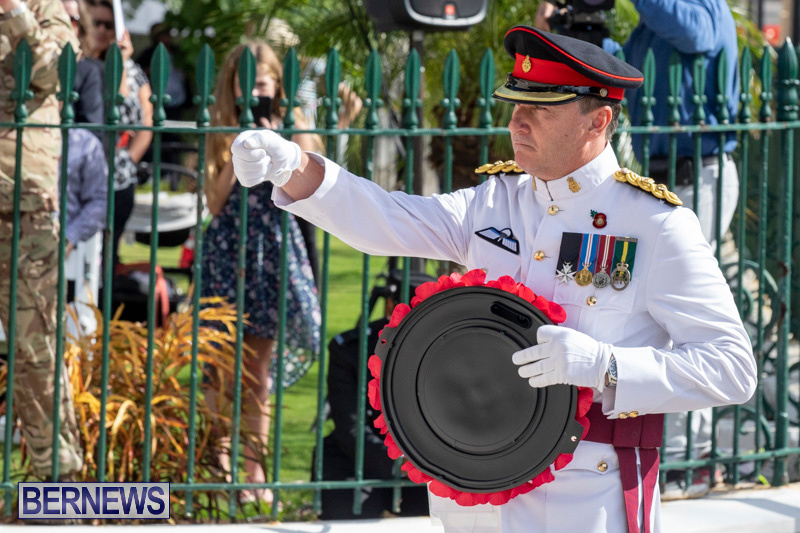 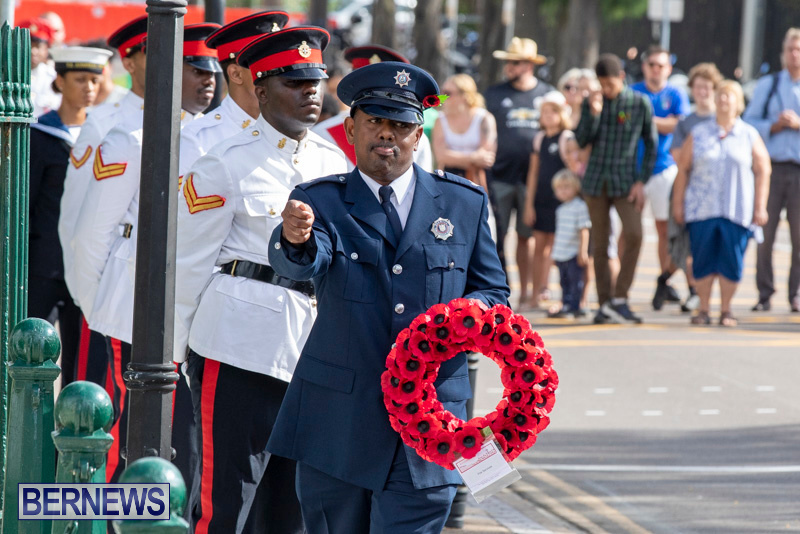 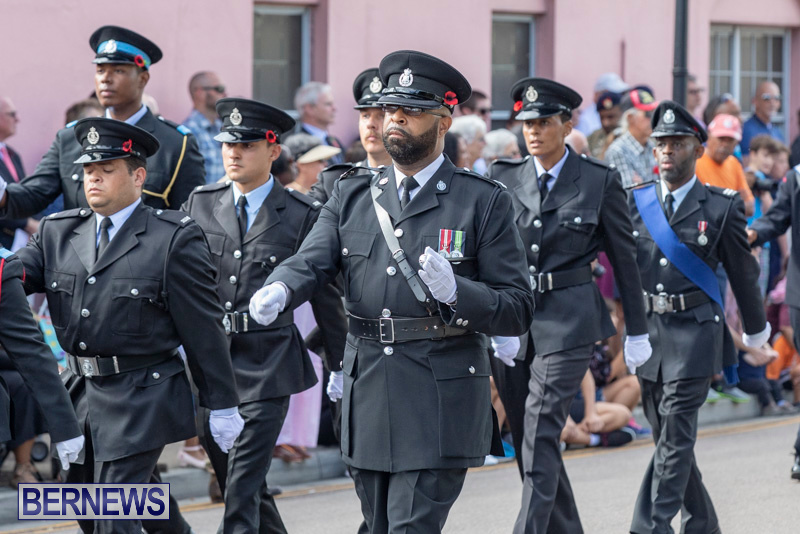 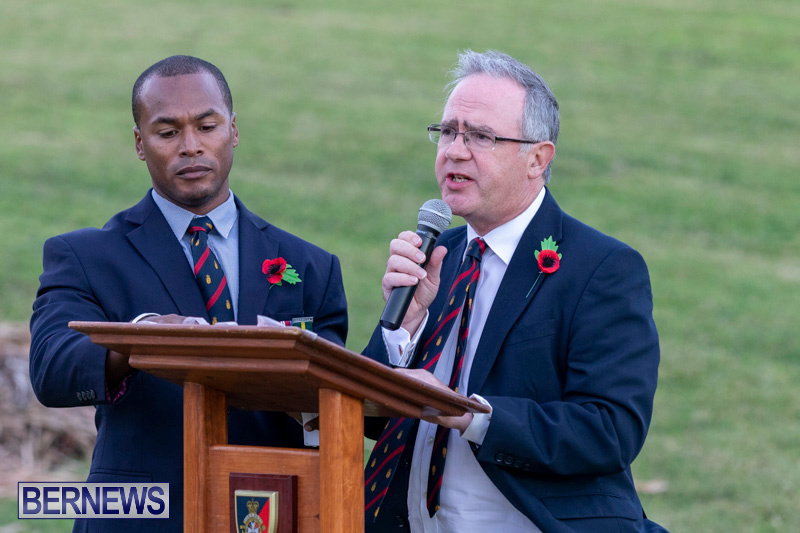 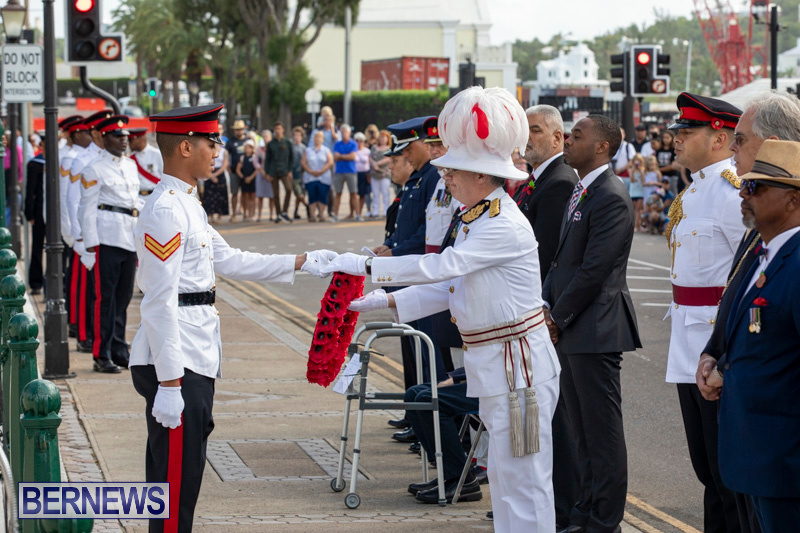 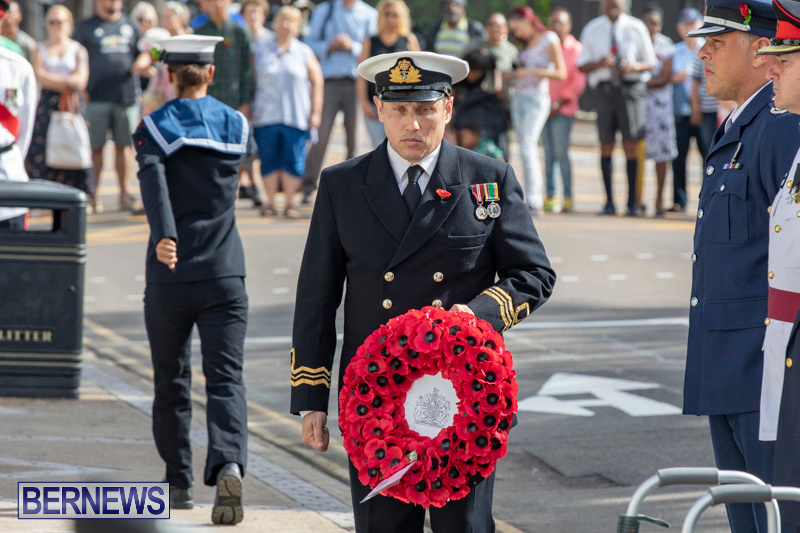 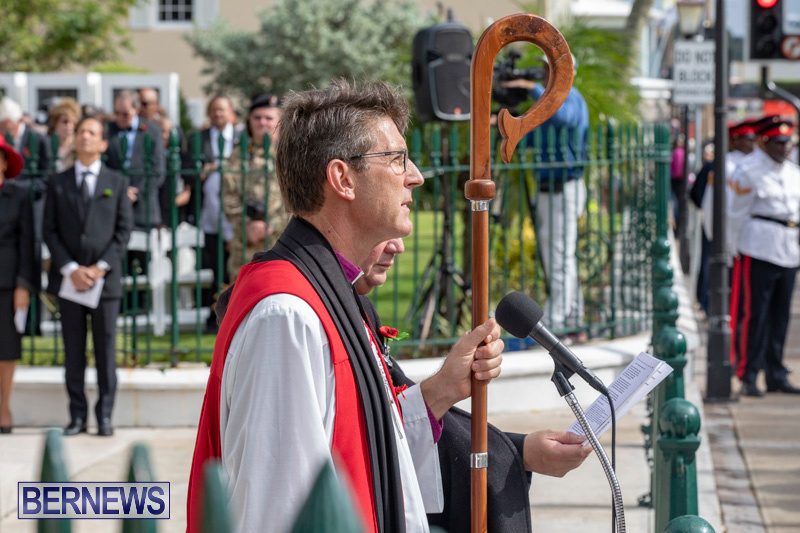 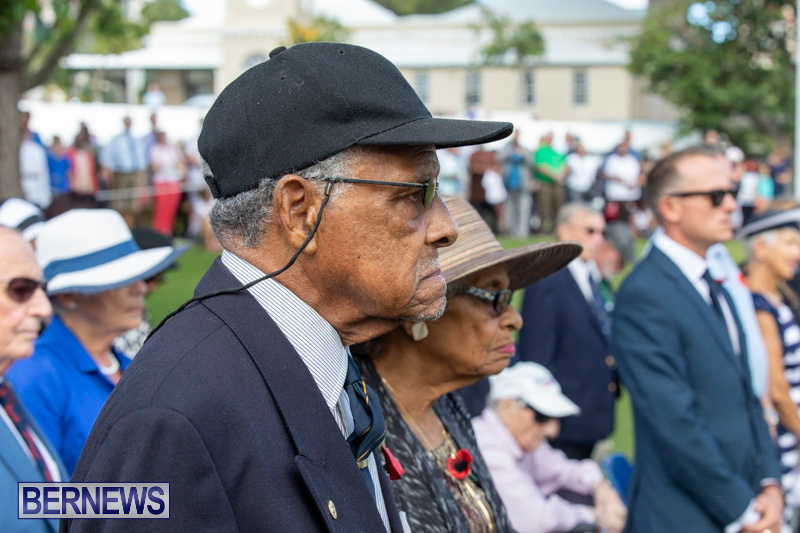 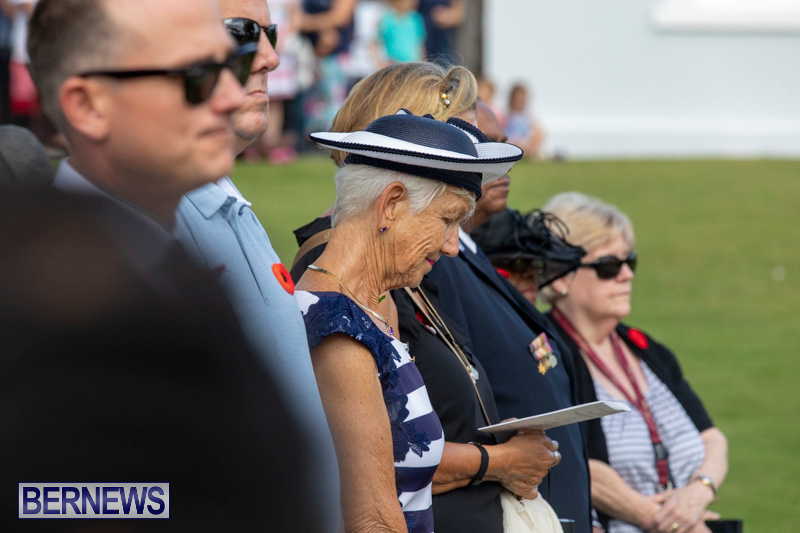 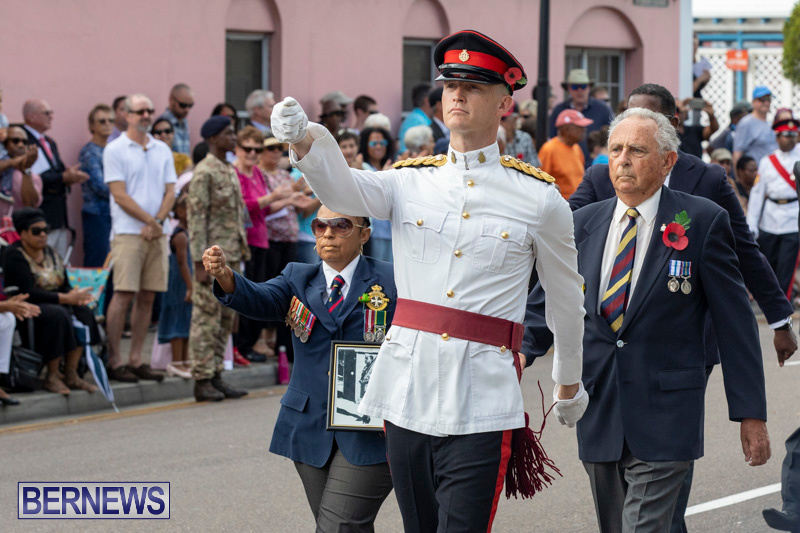 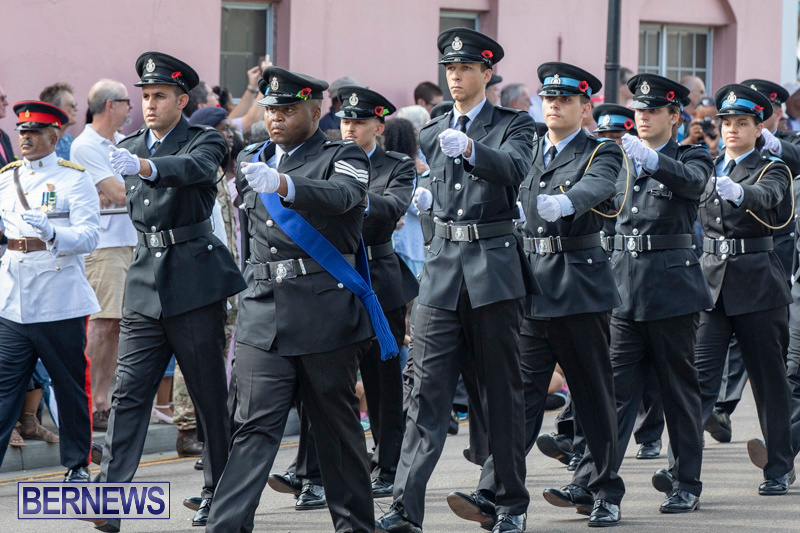 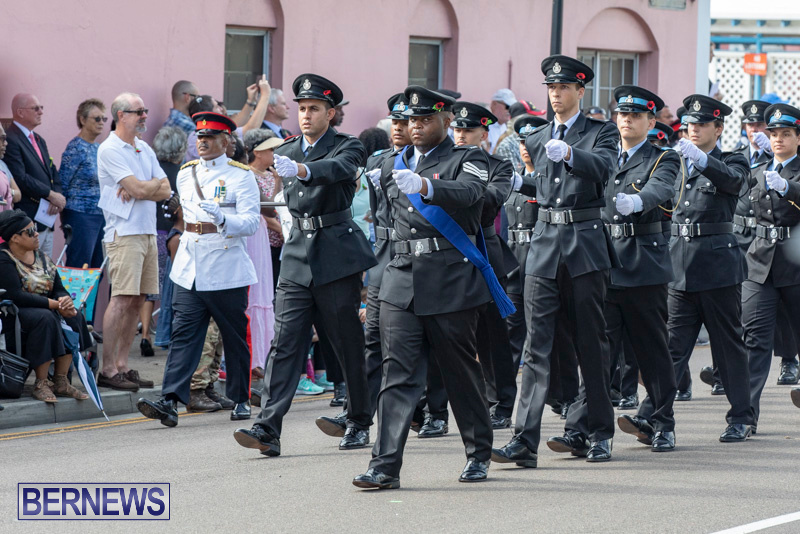 “Today has been a day to mark that Armistice and to recognise all of Bermuda’s veterans, both those who made the ultimate sacrifice and those who survived. 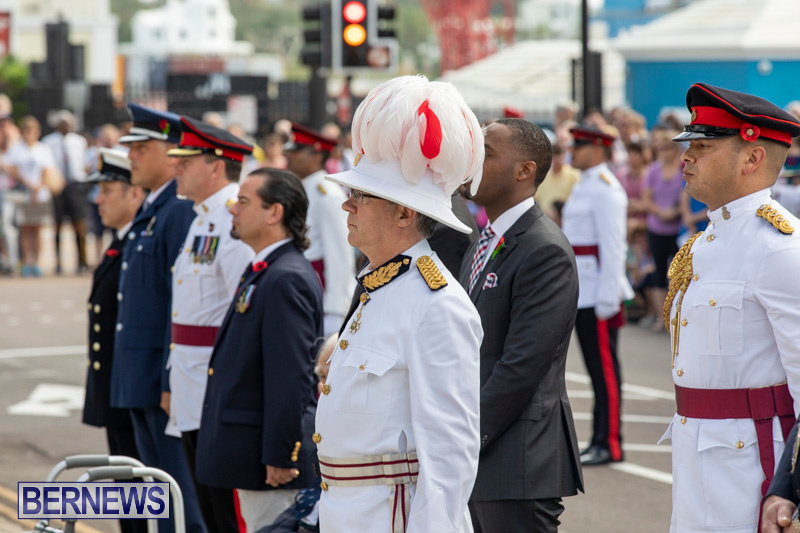 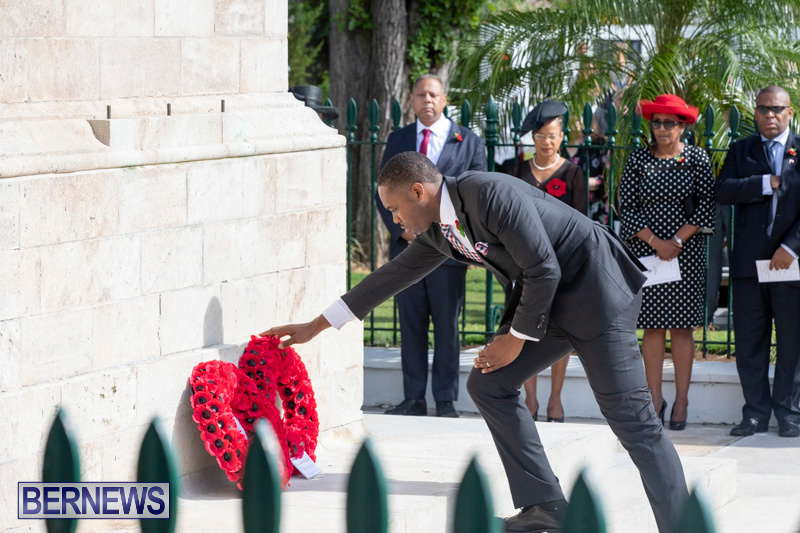 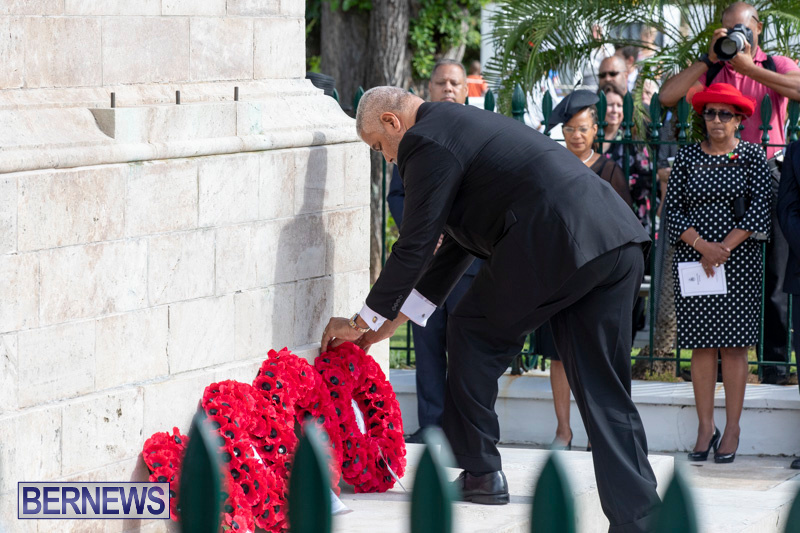 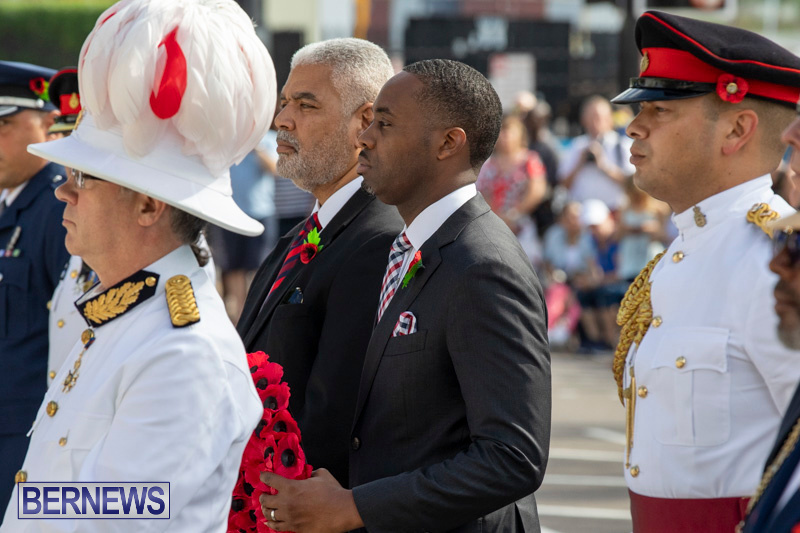 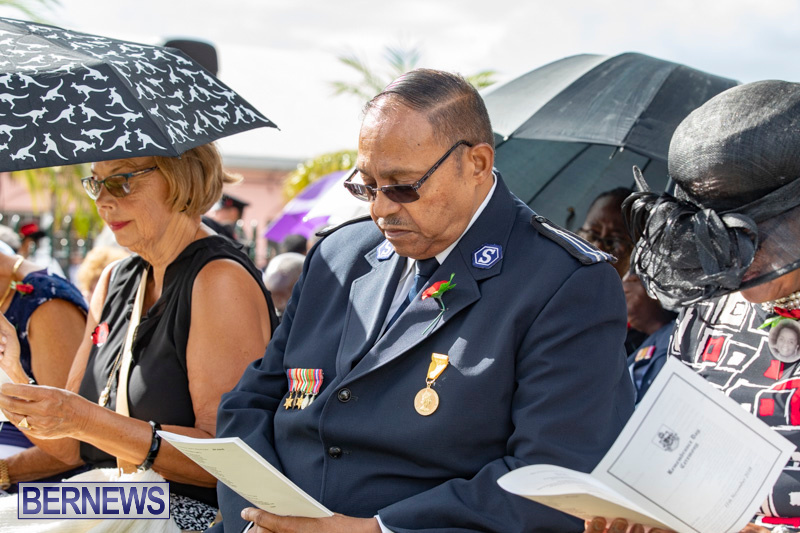 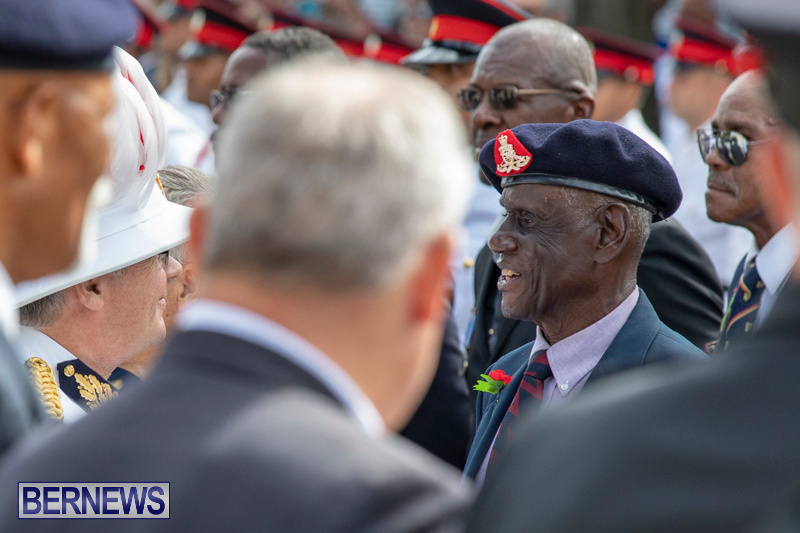 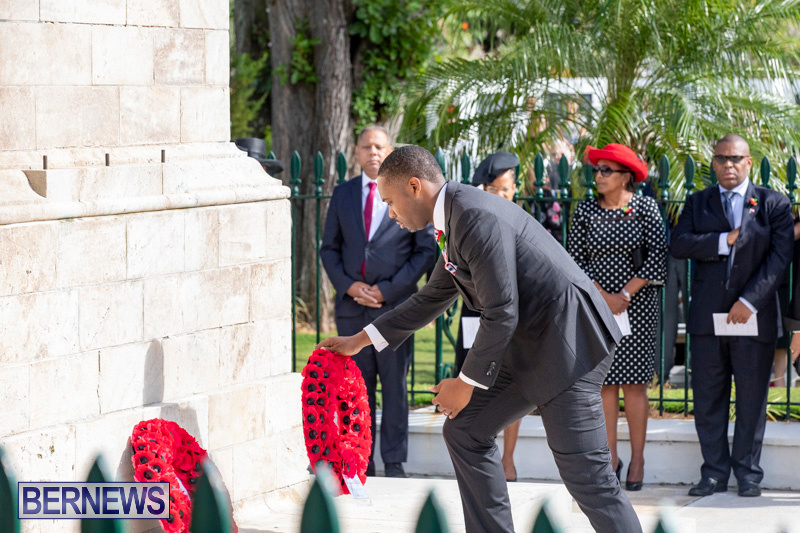 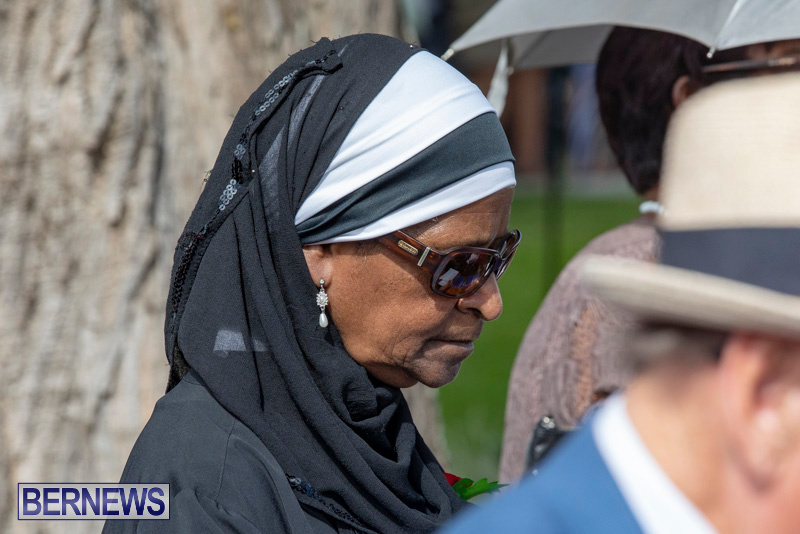 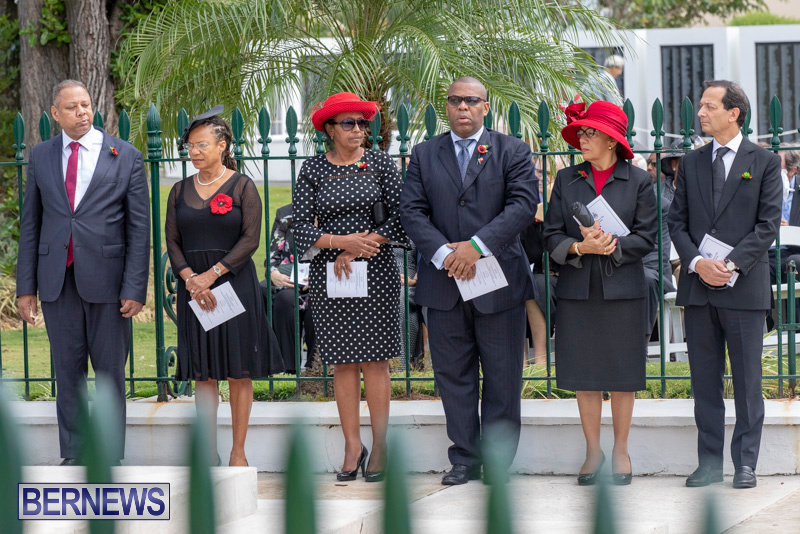 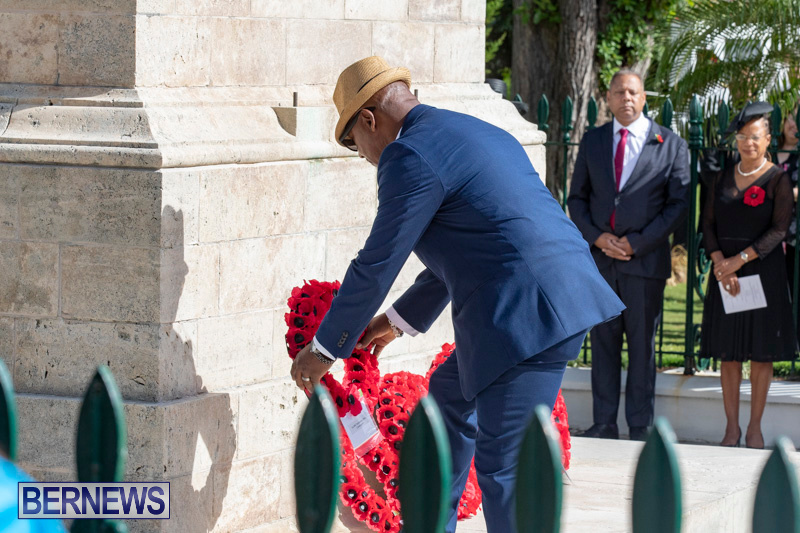 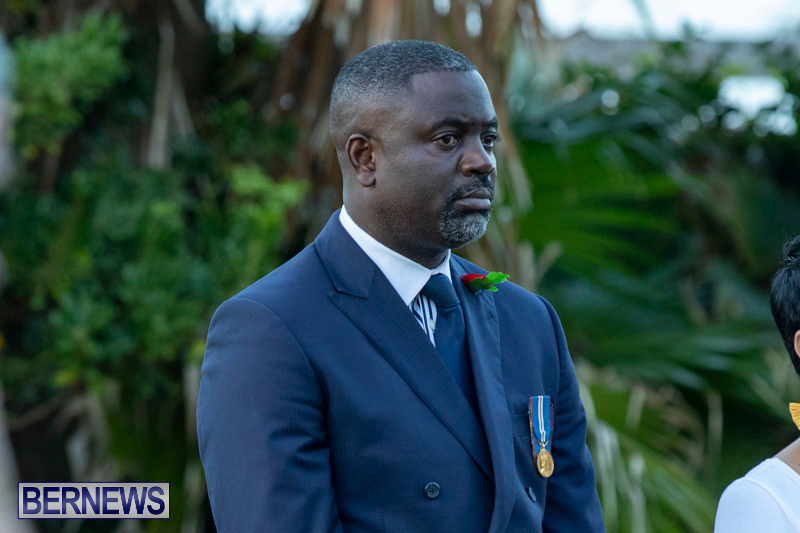 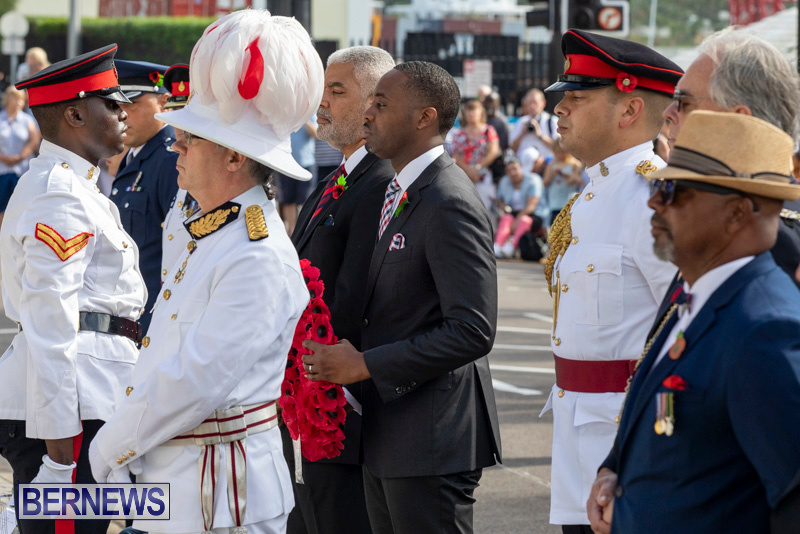 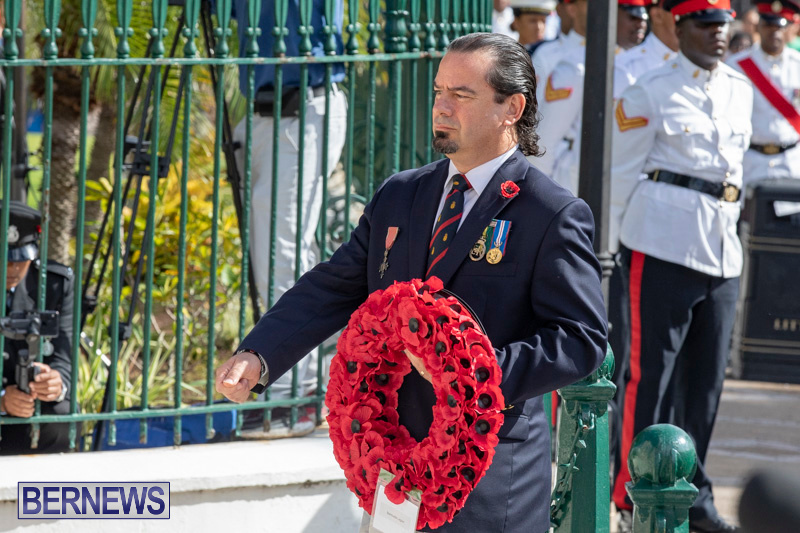 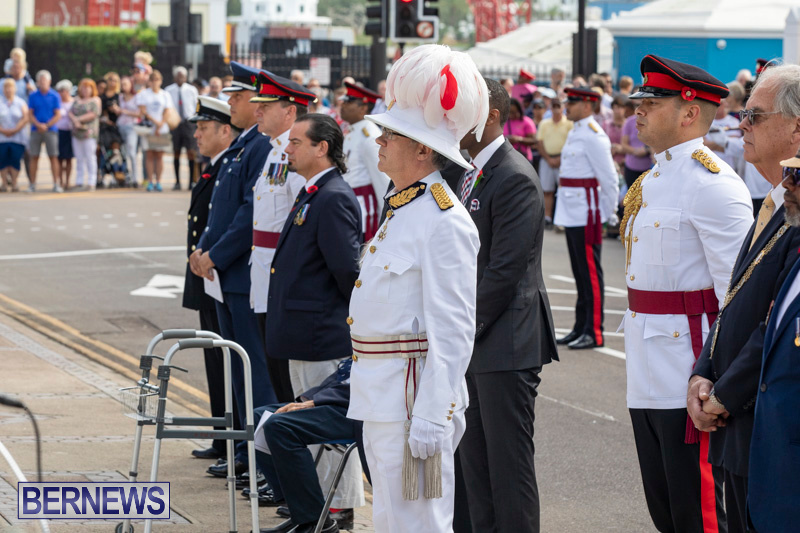 Premier David Burt, who laid a wreath on behalf of the Government, added: “This is tradition – when you have traditions, you have to consider them. 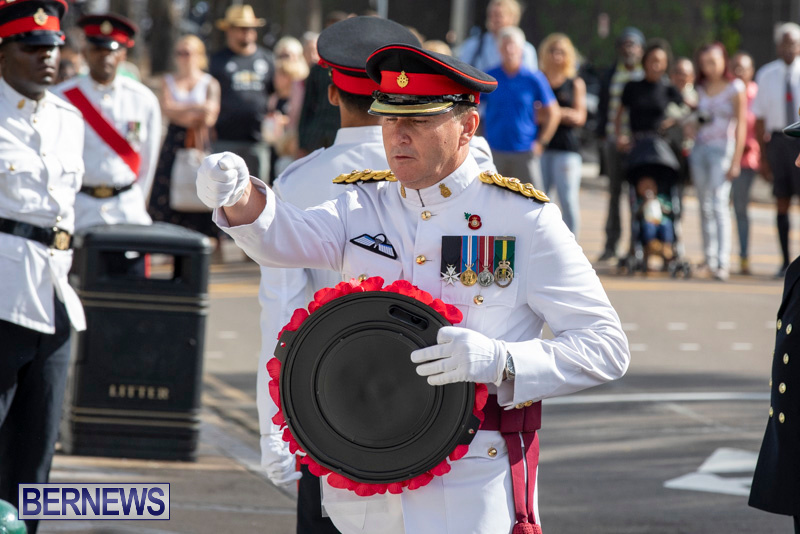 RBR Commanding Officer Lieutenant Colonel David Curley said: “This is one ceremony and parade that we are really honoured to do. 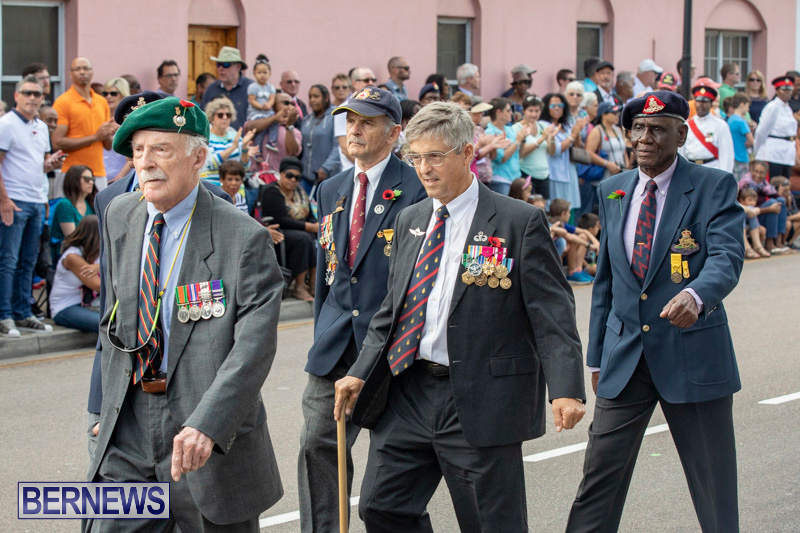 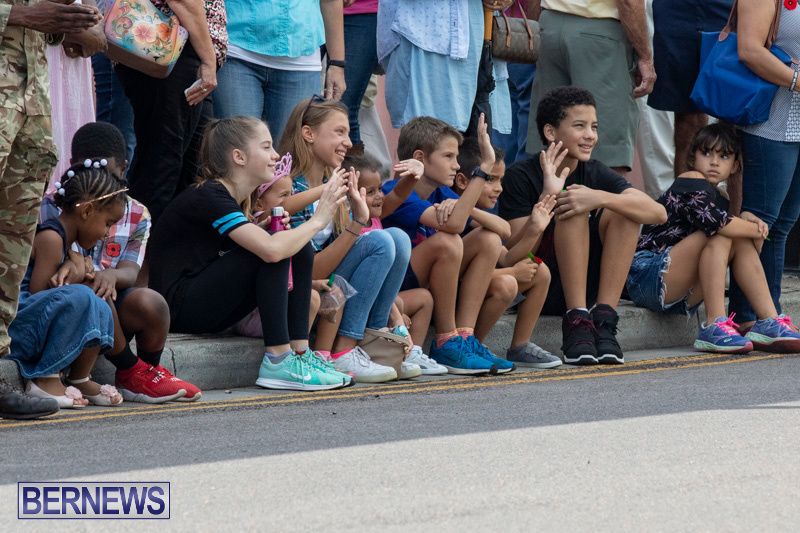 “That’s because it’s for the veterans – to see them out on parade is awesome and to be able to mingle with them at the lunch afterwards is first class. 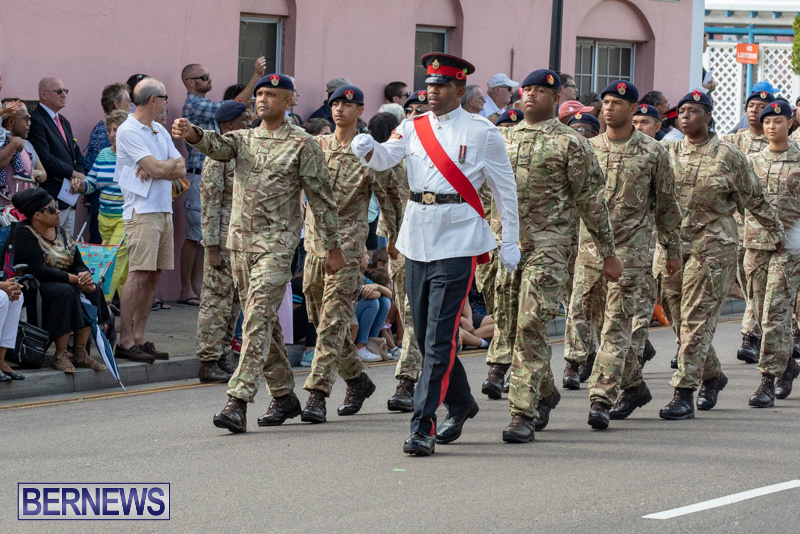 Col. Curley added: “I was very proud of our troops – it was an outstanding performance and they understand the values and traditions behind it.